We thought 2017 would be hard to top. 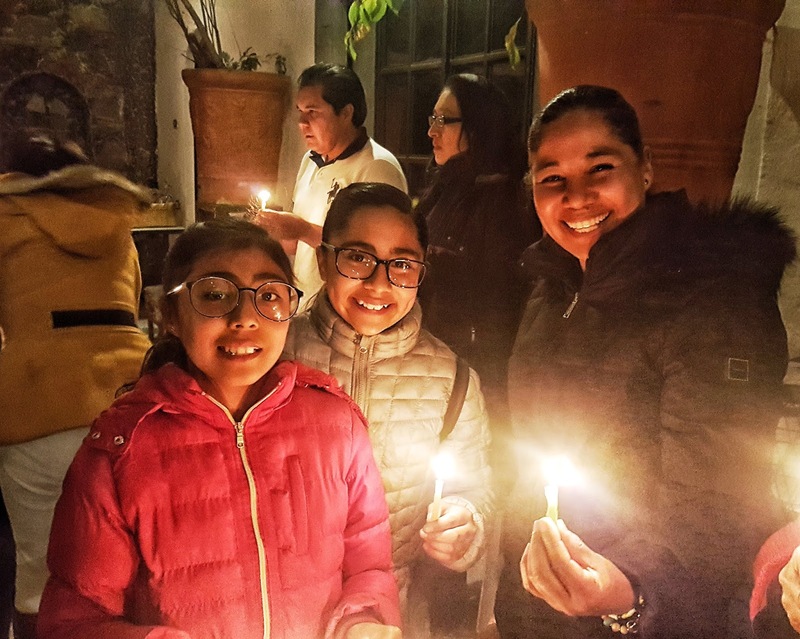 Starting the year with a number of goals, as 2018 comes to a close, we think this year, despite some major chef changes, was the best year ever for food in San Miguel de Allende. Many of the young chefs cooking in SMA – Arturo Sandoval of Atrio, Xavier Pinero Moreno at Ocre and Miguel Núñez of Bovine - have a year under their belt now and they’ve settled in to create some of the best dishes we’ve eaten this year. 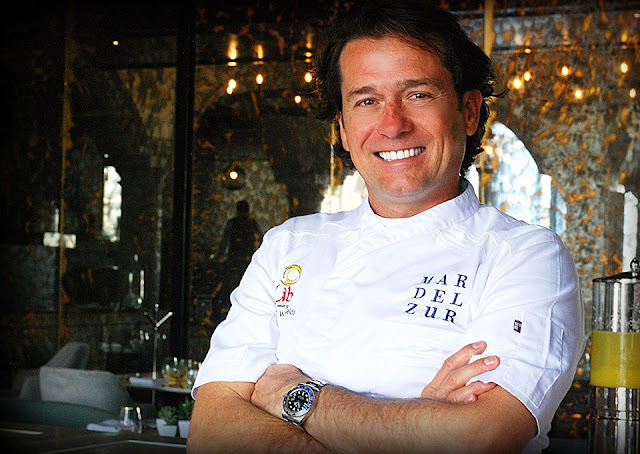 And speaking of young chefs, Patricio Fuentes Alvarez opened POLP SMA Gastrobar with small plates designed for sampling and sharing - our favorite way to eat; Chef Mariel Beiza brought her experience of cooking in the Caribbean to enliven the flavors at an old standard, Belmond Casa Sierra Nevada. It was a bold move on the part of the hotel that has paid off. 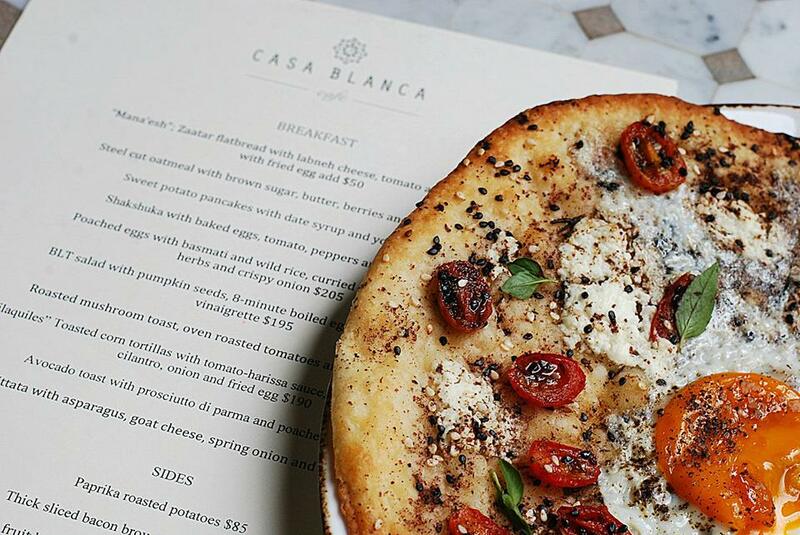 Chef Donnie Masterton opened Café Casa Blanca this year, where the Mediterranean menu follows the Moorish trail - Greece, Italy, Turkey, Lebanon, Tunisia and others, incorporating the use of a custom built tagine stove, a deck oven for flat breads and pita, a wood burning grill and a rotisserie. It’s highly anticipated sister restaurant, Fatima, will open in early 2019. Guest dining at Café Casa Blanca on New Year’s Eve will get the extraordinary thrill of a New Years toast from the rooftop of Fatima - and to watch the fireworks for the very first time. 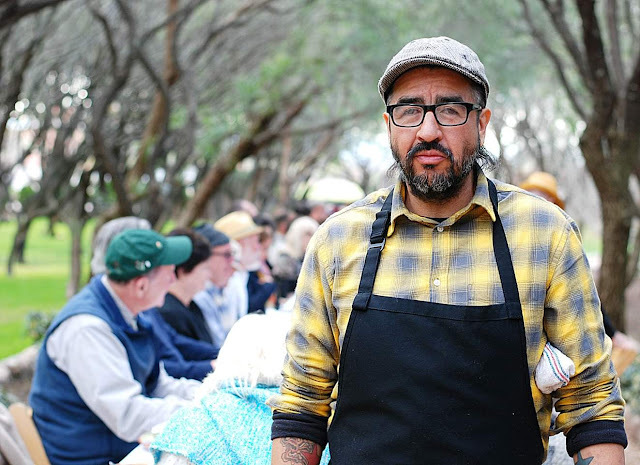 Some of our delightful eating experiences this year were at events, starting with Outstanding in the Field in January, featuring two remarkable chefs, Donnie Masterton of The Restaurant and Eduardo Garcia of Maximo Bistrot, lalo! and Havre 77 in Mexico City. 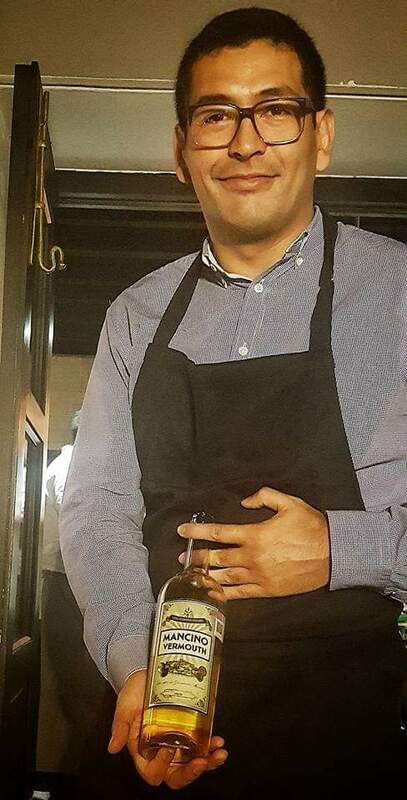 Also in the al fresco kitchen was Juan Jose (J.J.) Castaneda, the chef at Café Casa Blanca and Fatima. 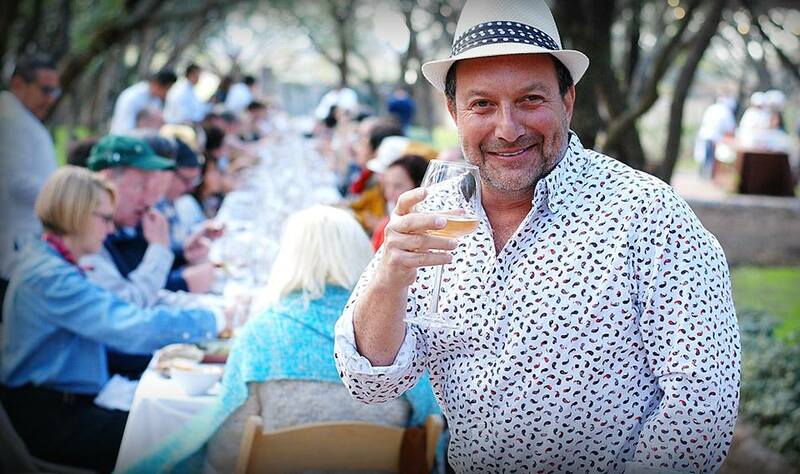 Sitting down at a long table in an open field with over one hundred of your new best friends, all of them food lovers just like you, was an incredible experience. I walked past fifty six chairs to the other end of the table to meet some of the guests. 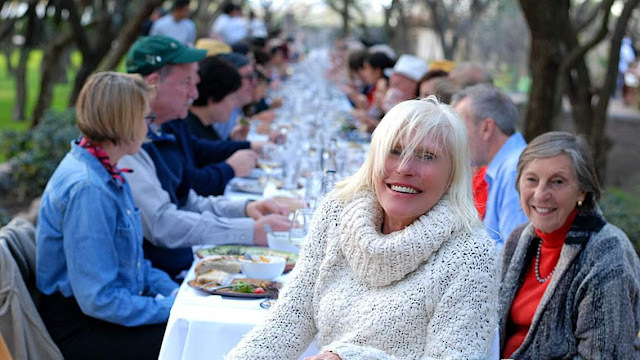 Many of them flew in to San Miguel just for the meal, following the trail of Outstanding in the Field around the world. What else caught our fancy in 2018? 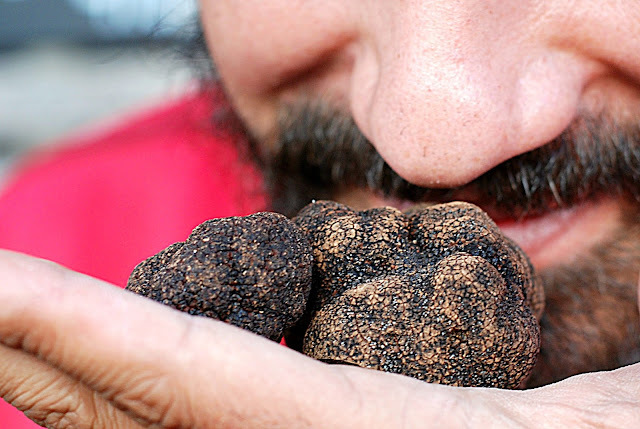 Going with Arif Towns Alonso of Simbiosi to pick up his first order of black winter truffles; the lucky recipient was Chef Oliver Deboise of Aperi. At the Lamb and Mezcal festival, we discovered a simple Birria made by Sushi 23 and served with white rice much like a New Orleans Gumbo and several new views: the rooftop top vista from La Unica, where we captured a beautiful picture of the Paroquia in our wine glass and the stunning view from the pool area at the new Live Aqua Resort. Don’t forget the new Asian restaurant, Spice Market, will open shortly. 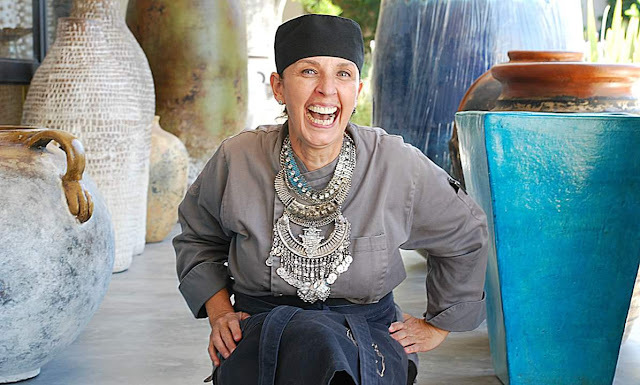 Our favorite artist, Carmen Jimenez, has also been commissioned to do a sculpture for this dazzling new resort. 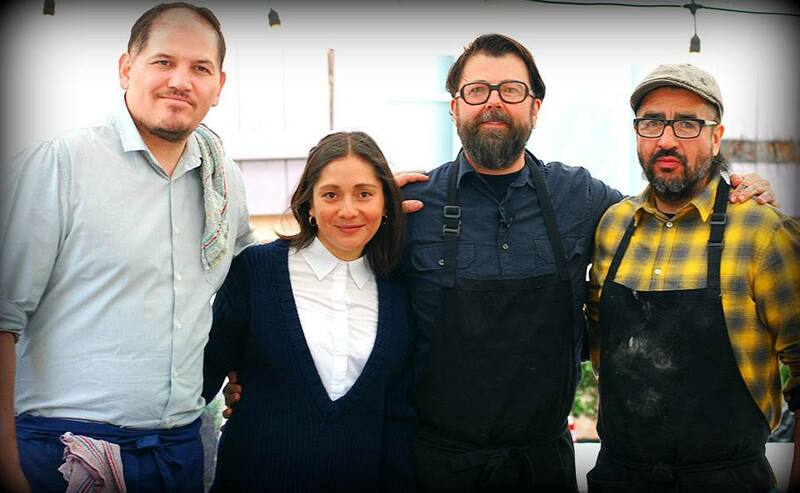 We savored the dinners cooked by guest chefs this past year: Alex Ruiz of Casa Oaxaca, who enchanted guests when he cooked with Israel Loyola Espinosa at Jacinto 1930 for their second anniversary dinner; Oswaldo Oliva of Lorea who created an exquisite chefs table dinner with Matteo Salas at Aperi; Lula Martin del Campo and Josefina Santacruz, who cooked with Marcela Bolano at Marsala cocina con acentos for her second anniversary dinner and Eduardo Echeverria, Rene Teyes and John Gallo of Pinch Kitchen Miami who produced the brunch at Moxi in Hotel Matilda during the MAG festival this past summer. We devoured everything in SMA this past year, eating our way though fine dining restaurants, markets, ranches and haciendas, cafes and food carts over 500 times. 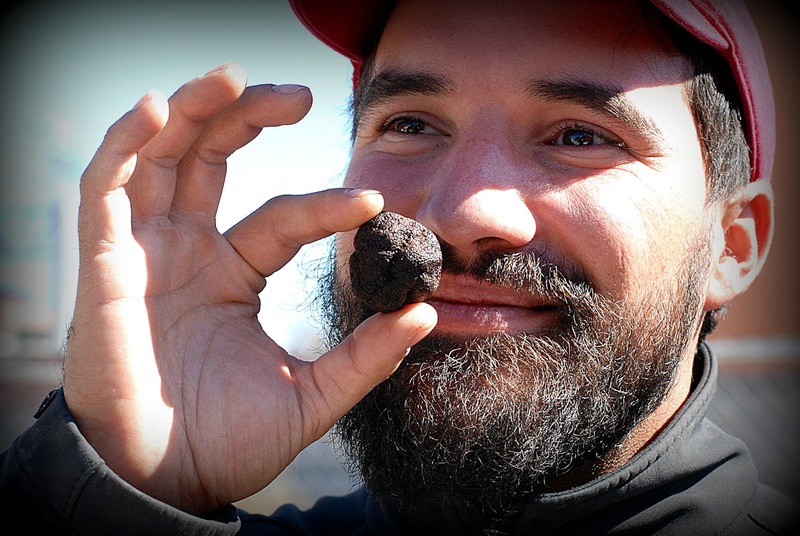 Photographs defined our day, many of them reminding us just how lucky we are to have the variety of food we do in SMA; ingredients grown at nearby farms around the Bajio region like Bodega Organica at Rancho Luna Escondida, where the Outstanding in the Field experience was held. Awards this year – well, we collected more than a few: for the second year in a row, SMA was named the Best City in the World by Travel + Leisure. 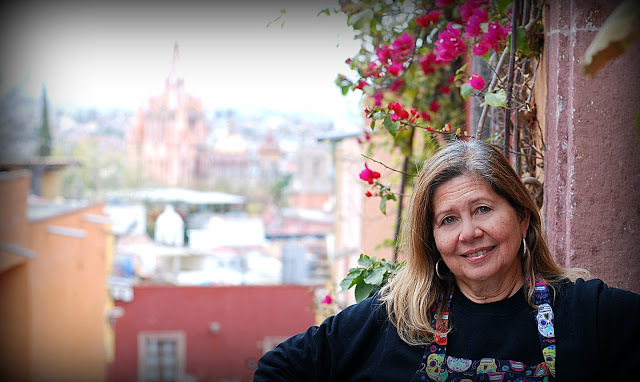 SMA was also named the Best Small City in the World by Conde Nast Traveler. The Rosewood, Hotel Matilda and Hotel Nena took # 3, 4 and 5 on the list of the ten top hotels in Mexico at Conde Nast’s Traveler Awards; the hotels also placed on the international list of the best hotels in the world. SMA was also nominated as the Best Destination in Mexico and the Best Gourmet Destination in Mexico at the Food and Travel Readers Awards. 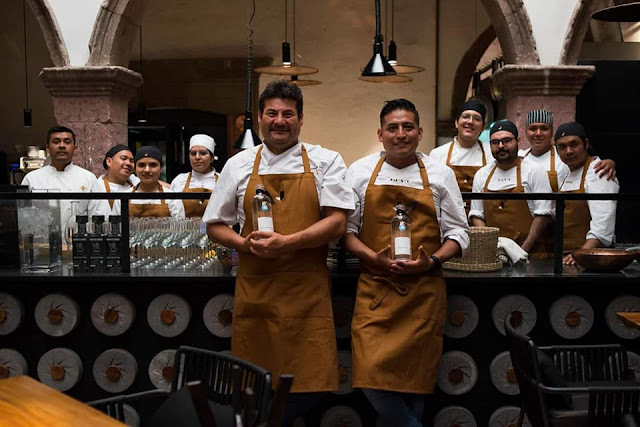 San Miguel de Allende was also named the American Culture Capital for 2019 by the International Bureau of Cultural Capitals; great news for the city’s chefs, who have worked hard to made the culinary scene an central part of SMA’s rank as the Best City in the World. 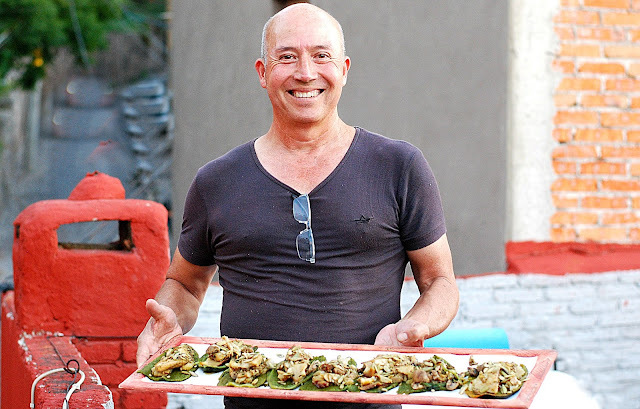 We experienced a renewed interest in food preparation (after cooking a different recipe every Sunday for thirty years and then taking a hiatus for the past five years by eating out every day in SMA) at some of the best cooking schools in SMA: Chef Kirsten West’s La Piña Azul Escuela de Cocina, Chef Gilda Carbonaro’s Culinarian Expeditions, an old school with new blood, Sazon and Chef David Jahnke’s Cooking School Lab. 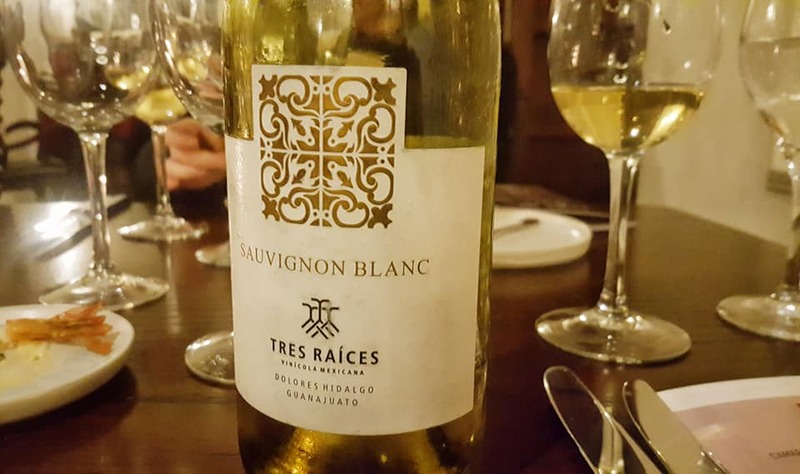 In 2018, we developed a passion for new wines from the region with Tres Raices Winery. 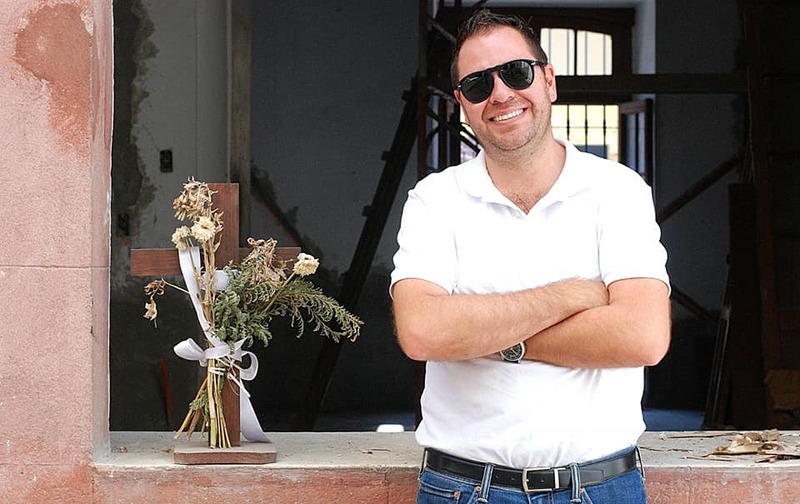 Opening this year, they’ve already won medals in worldwide competition and they just opened a new tasting room on the first floor at Cuna de Allende #15. Here’s a list of our most memorable food moments from 2018. Thanks to all the chefs who created them; they’re why 2018 was our best year in SMA for food and drink. Stay hungry SMA! A feast called 2019 is right around the corner and we can’t wait to savor it. Chef Mariel Beiza cooked with Italian chef Chef Sergio Daniele Spoletini of Rome, Italy to honor Italian Ambassador Luigi Maccotta for the Week of Italian Cuisine in the World, organized by the Italian Embassy in Mexico in partnership with Crea Italia Connections . With the Mexican Caribbean as her backyard, Chef Mariel Bezia refined the tropical and peppery flavors that she brings to the kitchens at Belmond Casa Sierra Nevada. Of all the appetizing dishes she’s made, Shrimp on Rasurada was our favorite. 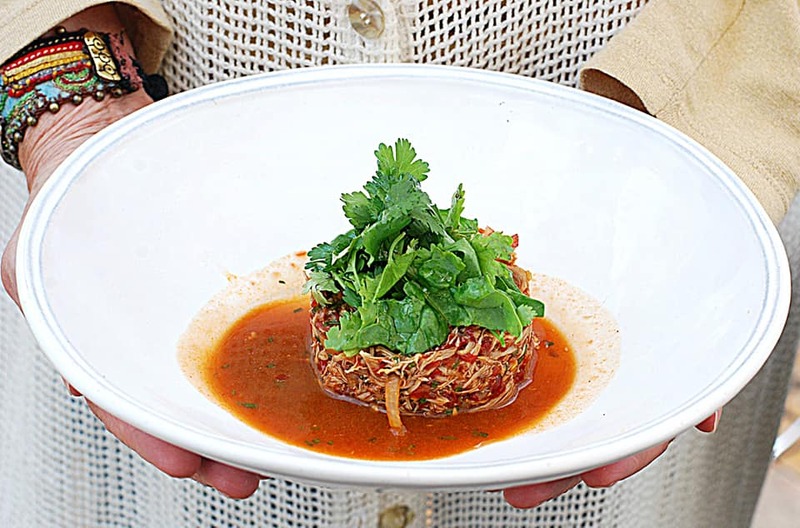 A clever way to serve this appetizer, we loved the presentation almost as much as the dish itself. We also savored the chili oil sautéed octopus, mayonnaise with mustard seeds and green salad. 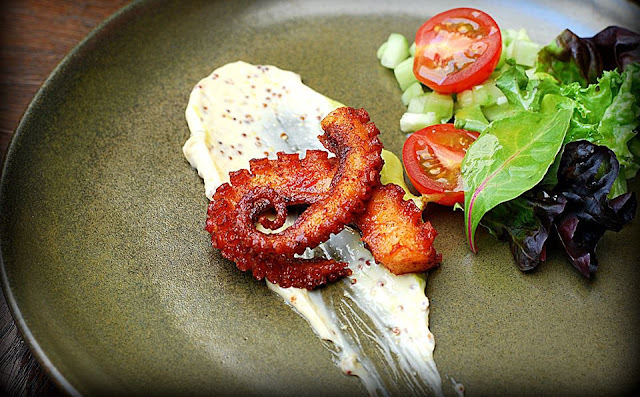 The octopus was crispy on the outside and tender on the inside – exactly like we love it. 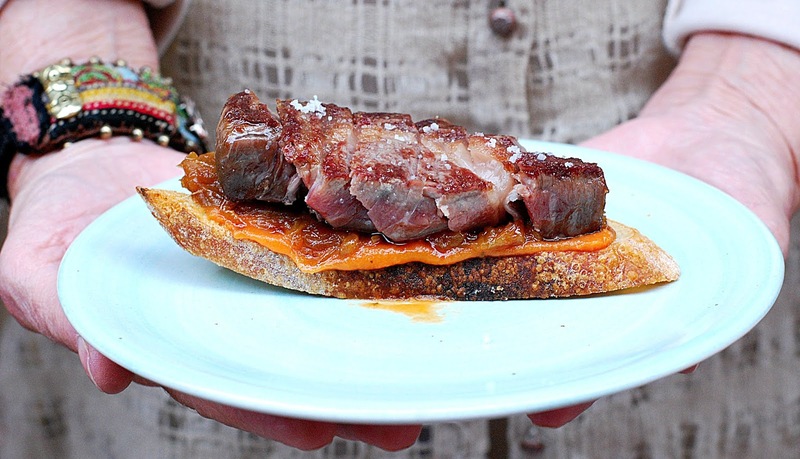 We also loved many of the dishes we made at Casa Sierra Nevada's cooking school, Sazon. Pretty sure a perfect night in SMA should end at Andy’s Tacos. Written up by the Wall Street Journal in 2014, Andy’s has ruled the late-night street carts in SMA since then. We tried a lot of Tacos al Pastor in Mexico City this year; we didn’t find any we liked better. Who was also on the trail to find the best taco in SMA? 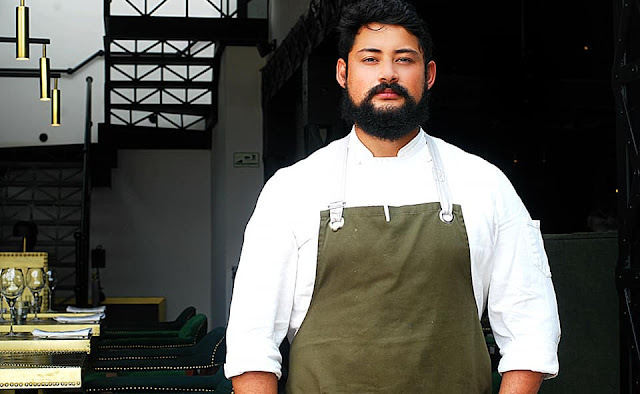 MAG Chef Duncan Welgemoed of Africola restaurant: South African-born, French-trained and Adelaide, Australia-based. 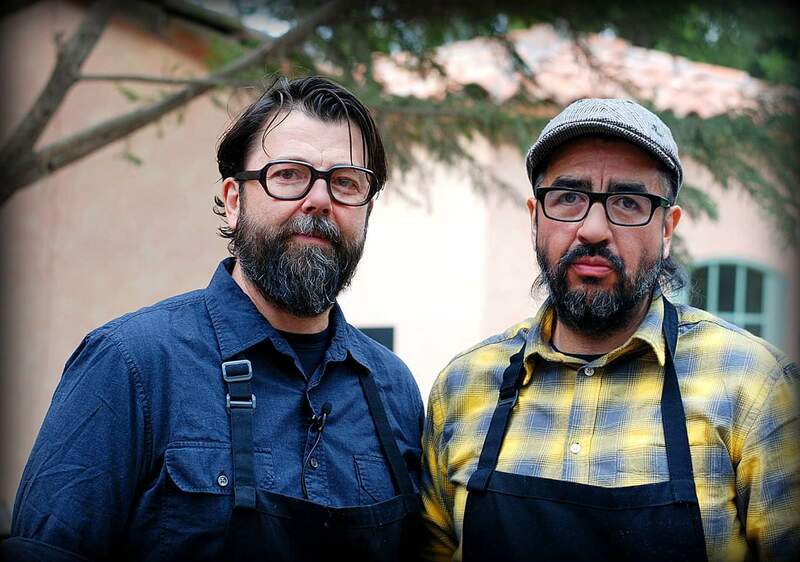 A bromance was in the making when confirming to Andy that Duncan was in fact that famous chef from Australia. Andy is a local celebrity as well, catering to the after midnight crowd. 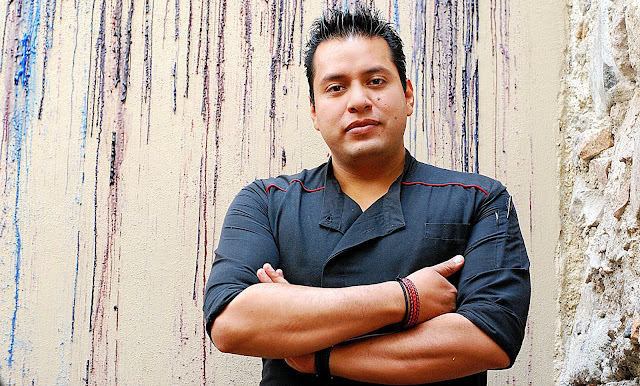 Chef Alejandro Cuatepotzo of Antonia Bistro SMA was nominated for the Best Chef Revelation and the Best New Mexican Restaurant for the Food and Travel 2018 Readers Awards. We love breakfast at Antonia, for the daybreak quiet that comes with the most stellar view of the city. 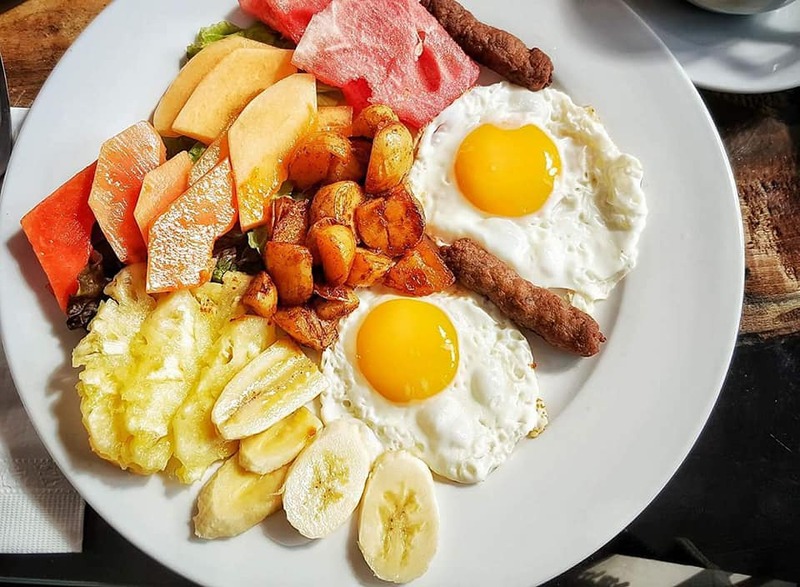 Order the Fried Eggs with Green Herbs Cream on the side and homemade hash browns; we’re still savoring the side medley of pork sausage and onions. 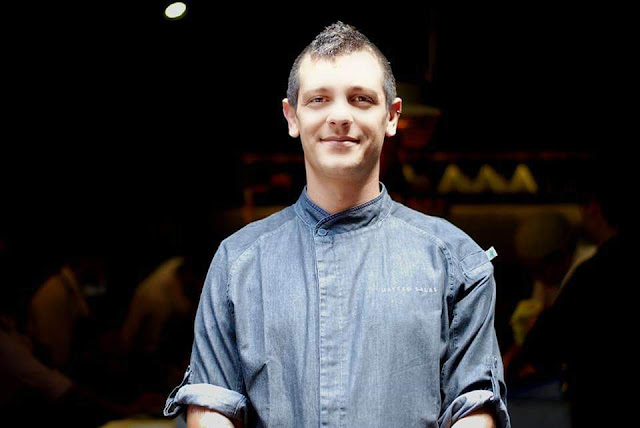 The king has left the house; Chef Matteo leaves Aperi for a new adventure in Europe. Chef Olivier Deboise takes the kitchen and if you haven’t tasted his food, 2019 is the time to try it. Aperi was nominated for Best Restaurant of the Interior and Best Hotel Restaurant for the Food and Travel 2018 Readers Awards. 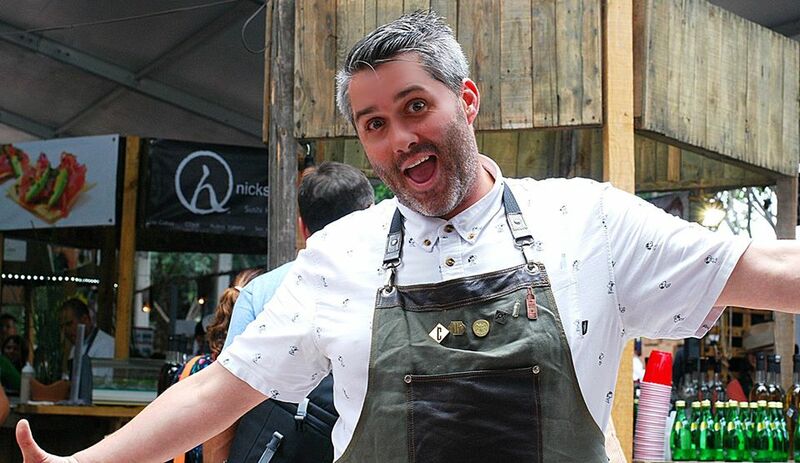 Mixologist, Adrian Garcia Evans, was nominated for the best cocktails. 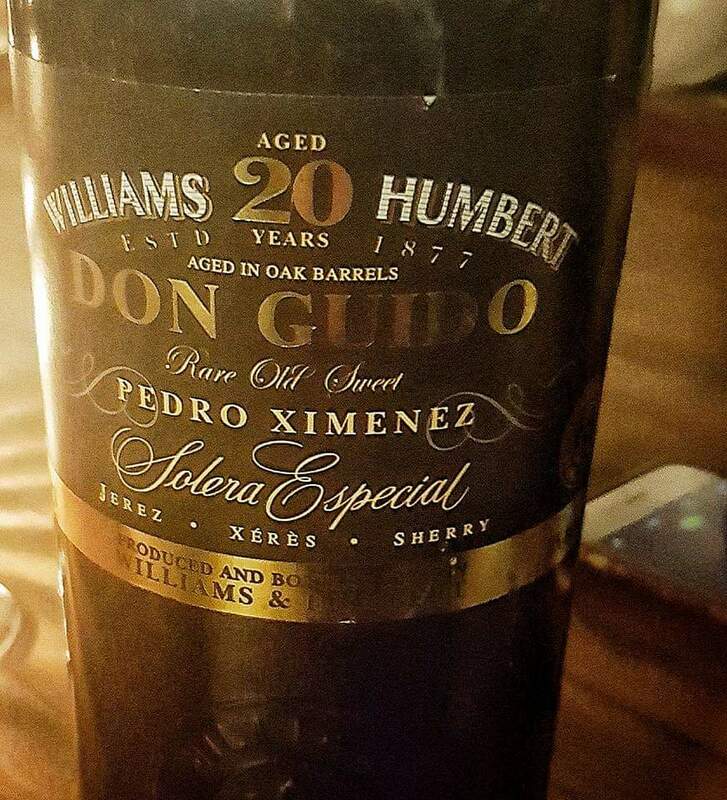 Never underestimate the sophistication of a 20 year old sherry - Don Guido Sherry. A Mancino Vermouth that redefined what a vermouth experience should be, especially for someone who has never loved vermouth. Yeast butter: we couldn’t lick the plate clean while sitting at the chefs table… but we kind of did. Octopus with crispy pig ears – we’ve eaten pig’s ears before but never like this. 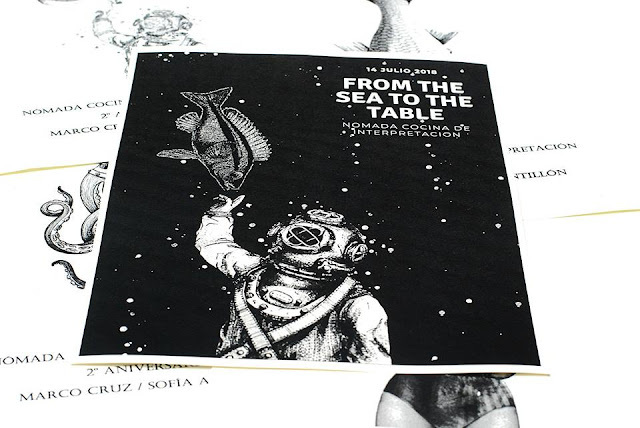 The best seat in the house is the chefs table; Matteo Salas's chef table. 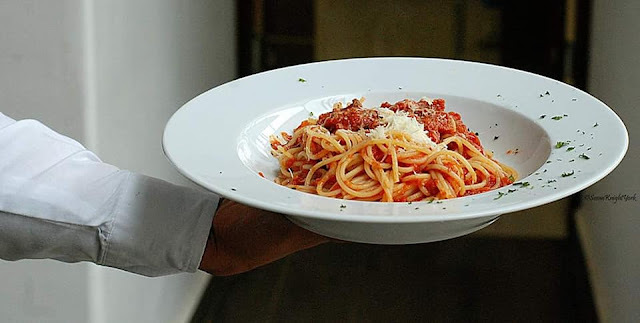 I've often said that although there is only one in SMA, it will always be the best as long as Chef Matteo Salas is cooking. He proved it once again at his dinner with Chef Oswaldo Oliva of Lorea. Taking on a very aggressive menu, which required guests to think about texture rather than flavor, was a challenge for someone who always thinks about taste. 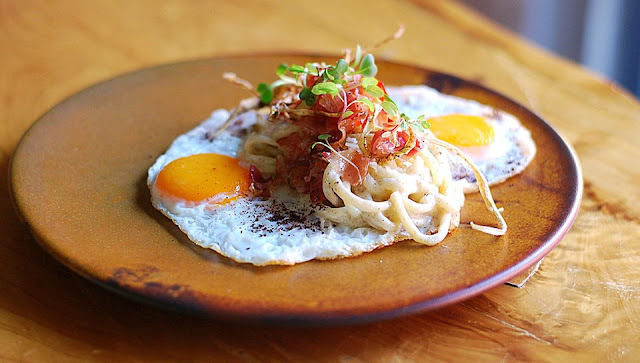 But thinking outside the box is the place where Chef Matteo Salas artfully lifts you to; you're painlessly pushed beyond your boundaries to a whole new level of respect for great food. 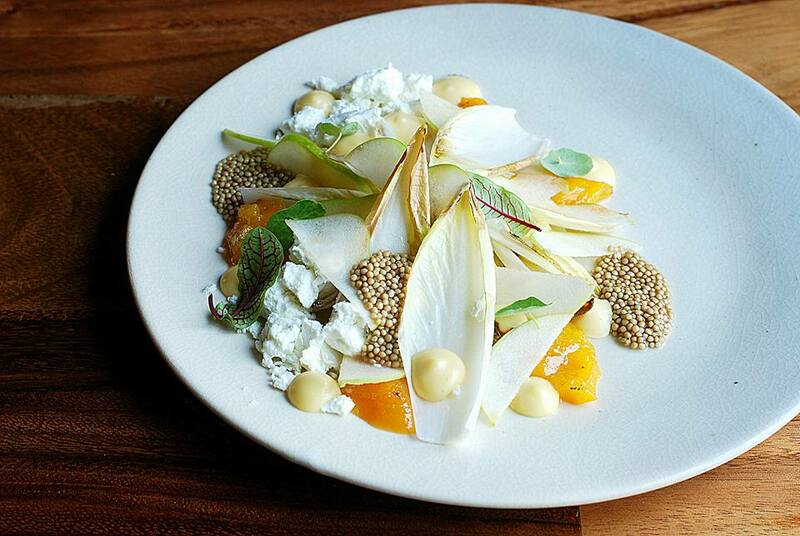 The chefs table is the place I go when I want to learn more about food. Honestly, school cannot teach me as much as what I learn in 5 hours at the chefs table at Aperi. 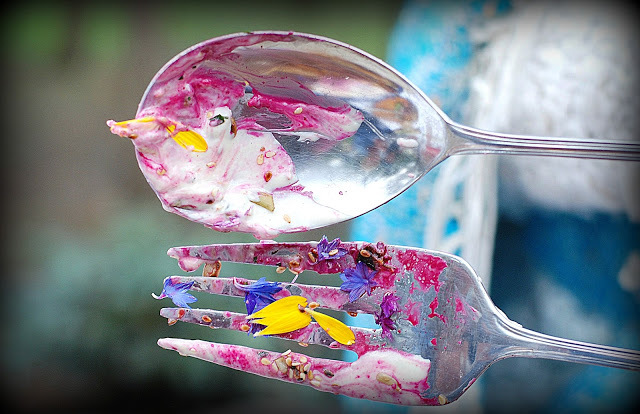 How often do you get to talk to the chef about how he prepares a dish or where he finds his ingredients? 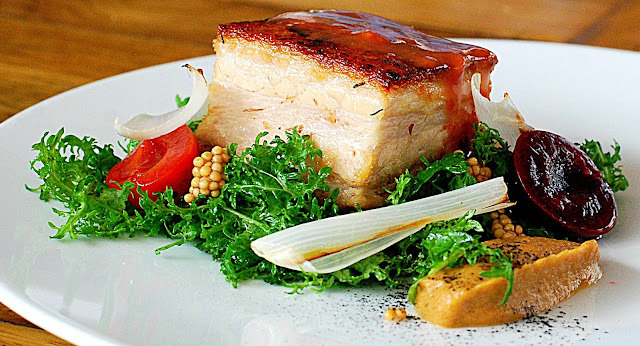 Sourcing good ingredients is not easy but Chef Matteo Salas has mastered that art as well. 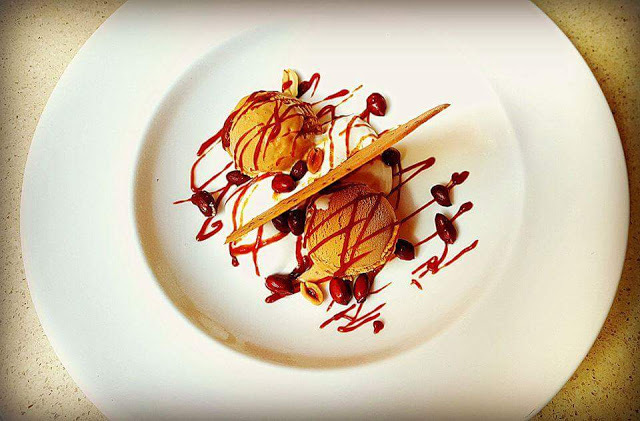 In Chef Salas's kitchen, there is an energy that carries you beyond the appreciation for good food. He sees a dish and brings it to life; plating it in a way that makes you wonder where that one came from. I've learned to never second guess the mind of a chef who can elevate simple dishes to a culinary high spot; it's a gift. The pictures in my head are all amazing but these are with my phone, not my Nikon as the night is impossible, at least for this daylight photographer. We eat with our eyes first and I can tell you that my eyes had a total food indulgence that only a visual person can tell you about. 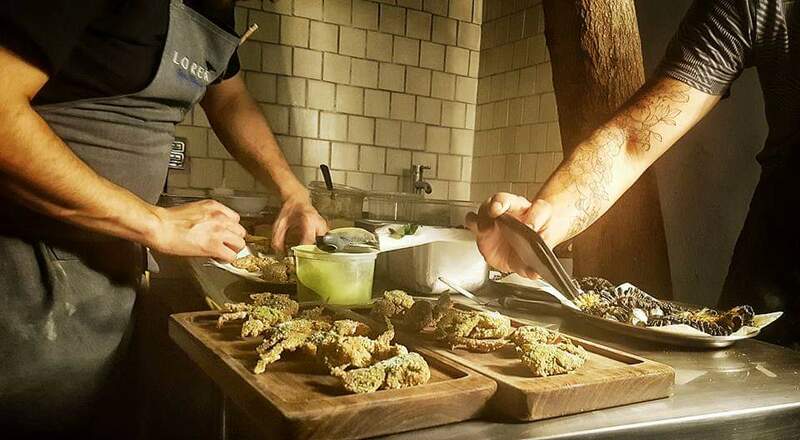 At the chefs table, you learn about techniques as well as ingredients - like yeast butter or stuffed squash blossoms that you eat whole with your head tilted back so you can appreciate the texture of the food. Or how about a pineapple tepache shot or Octopus with crispy pig ears. It was all great food; brilliant in fact, along with world-class pairings like a 20-year old Don Guido Sherry that I savored to the very last drop. A pairing with vermouth? Never until Mancino came along and redefined what a vermouth experience should be, especially for someone who has never loved it. Chilean born sommelier Sebastian Acosta Quiroz and Welch pairing master Adrian Garcia-Evans worked with Chef Salas to create the pairings, some of the best I've had anywhere. 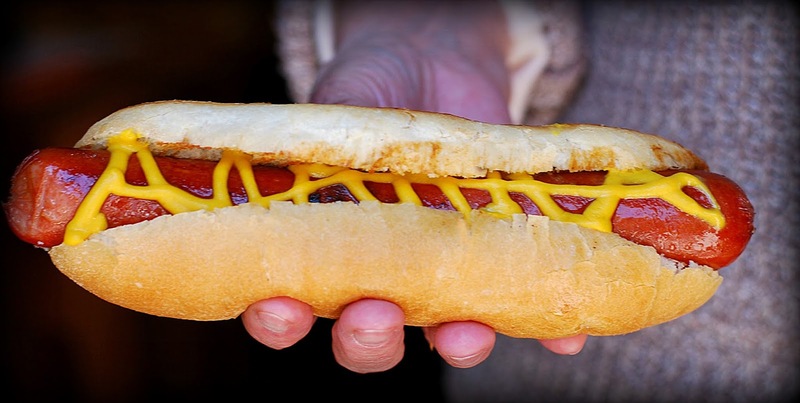 With your senses in overload, the sight, taste, and smell of both the food and the drink transcend you. How can you possibly get anything better than this? You settle in to your place at the end of the table, praying the feast will never end but it does, promptly at midnight. 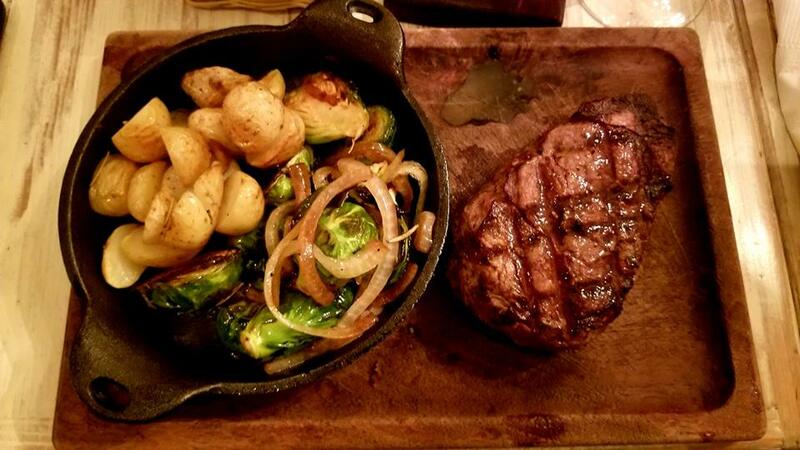 Now you get to go home and dream about this meal; the perfect ending to a perfect night. One thing I've learned over the years is to measure a meal on its own merits; not to compare it to every other one you've eaten. This was mandatory for me since one of the best meals I've ever had anywhere was delivered last year by Chefs Matteo Salas and Eduardo Garcia at the chefs table at Aperi. This, I can say, was also one for the books! We think owners, José María Calvo (Chema) and Jesús Manuel Calvo (Chus) are some of the best restaurateurs in SMA. 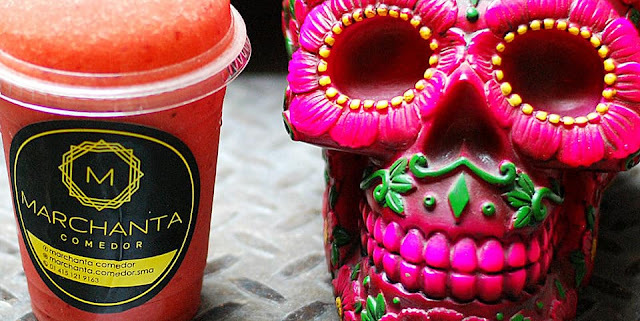 Along with Atrio, they also own La Azotea and Pueblo Viejo. 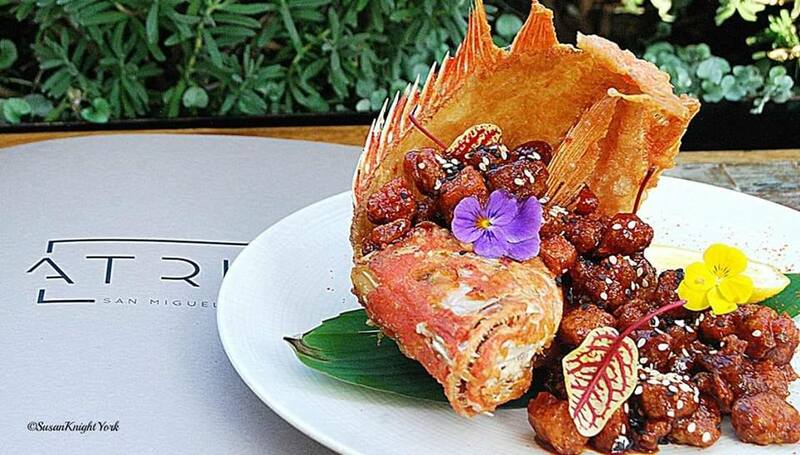 Crunchy red snapper marinated with spicy oriental red chilies, chipotle and citric sauce. 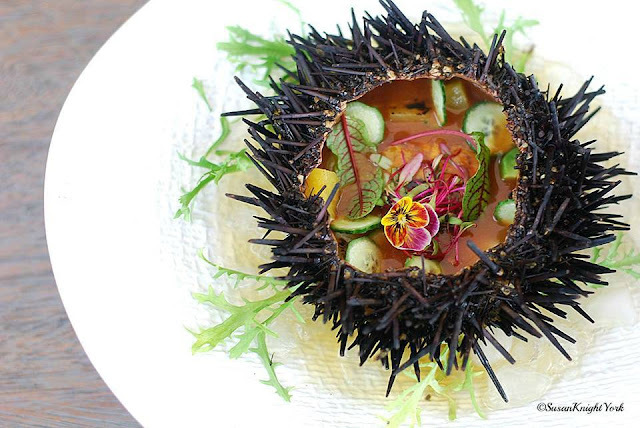 Sea Urchin Ceviche: cubes of scallop and sea urchin with avocado, josper roasted pineapple, tamarind tiger milk and chipotle. 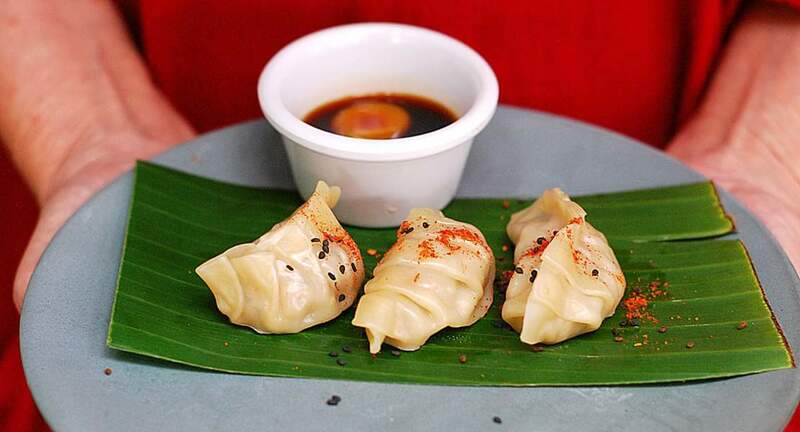 Duck dumplings served with Ahi amarillo sauce made from Peruvian peppers. WENTE Vineyards is registered as California Historical Landmark #957; it’s is the oldest continuously operating, family-owned winery in the United States. 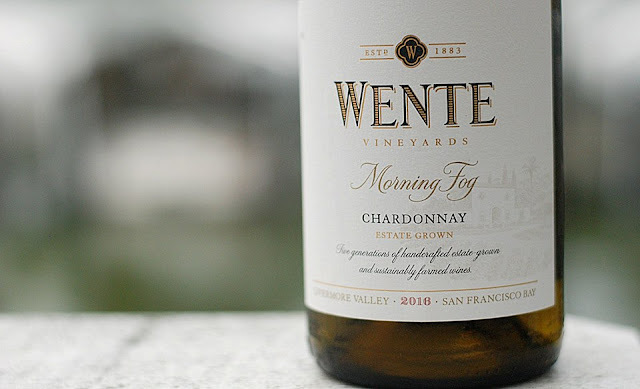 Many people in SMA can’t believe that Atrio is carrying Wente Chardonnay; that is unless we’ve drank it all by now. Cucapa Beer: We really don’t need a reason to drink beer in Mexico; many say that Mexican beer is the best and we happen to like this Microbrew from Baja. 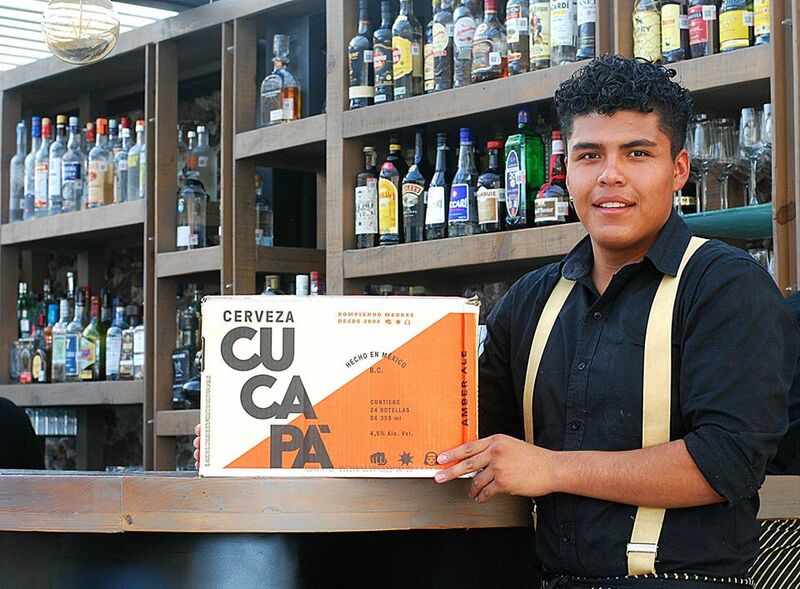 Cucapa says of their own beer “We were born between the best of two worlds, the border allowed us to explore two cultures to incorporate the best of each and create something authentic like our beer. 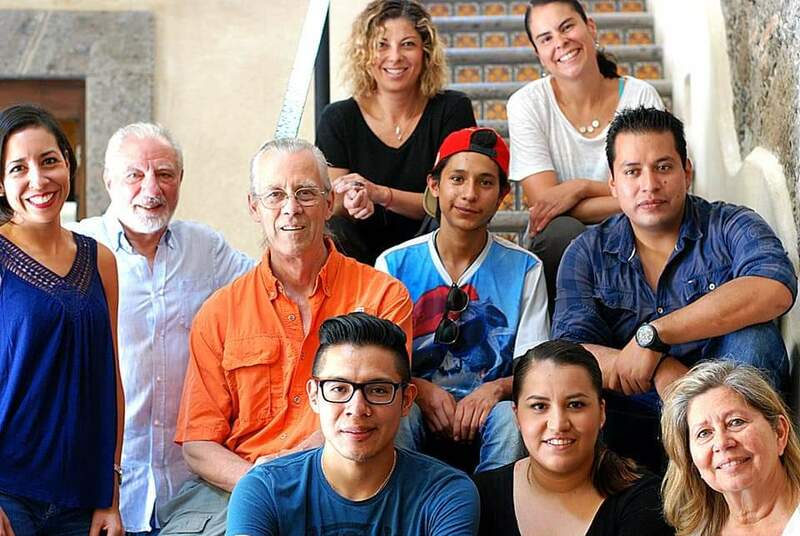 We are a young Mexico with new ideas.” We like that thought… and the beer. 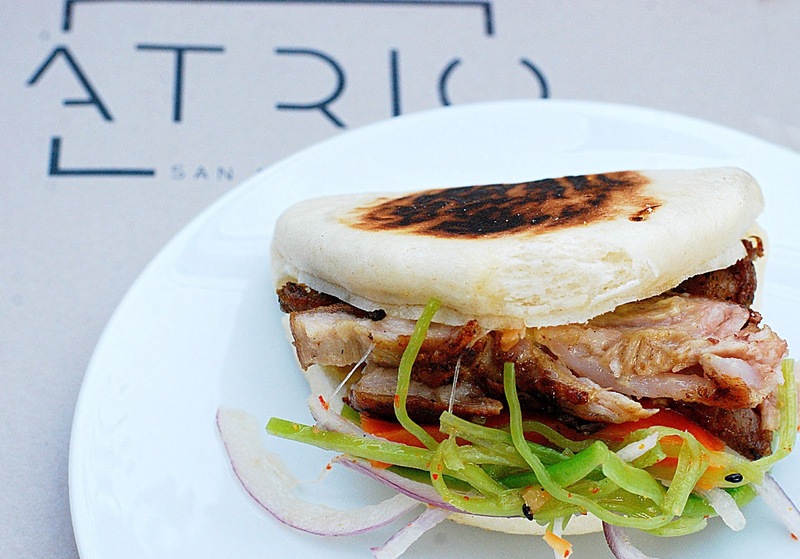 Finally, Atrio has a new Bao Bun made with a buttery confit of Lechon that’s cooked for 16 hours and is accompanied by a yellow chili aioli, a creole salad of onions, peas and habanero with a sweet potato puree. It’s our new favorite; the best Bao Bun they’ve created so far. We know, we eat it at least once a week. 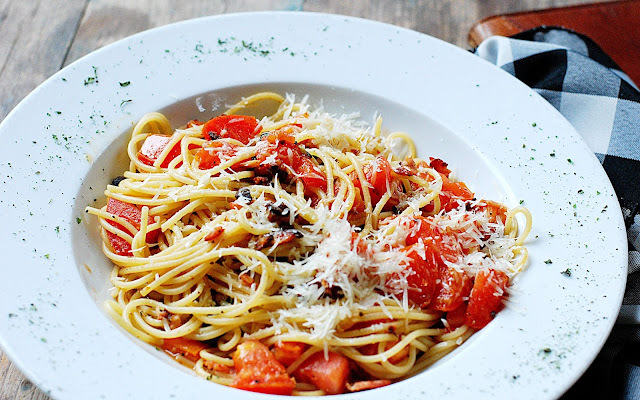 Amatriciana spaghetti with double bacon and cheese - because no one needs to justify Sunday comfort food. We’re addicted to the creamy Limoncello made by small, local producer, Renee Marklulin, that showcases fruits grown here in Central Mexico. 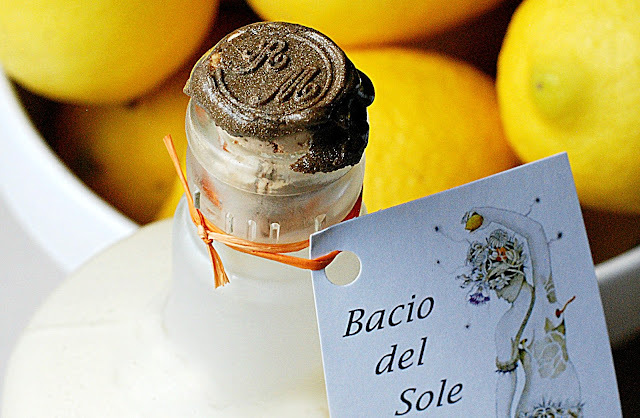 Unlike may Limoncellos that are made from grain alcohol, Bacio del Sole Limoncello uses a smooth, high-end vodka as the base, along with Meyers Lemons; sweeter than regular lemons with the same aroma and tart flavor. 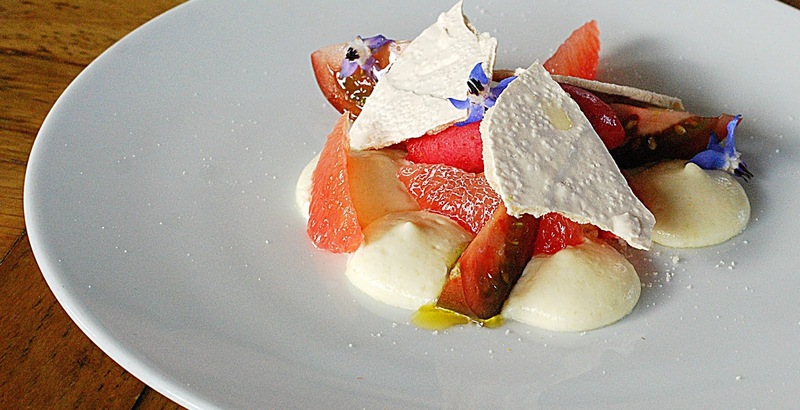 You can pour it over pound cake and garnish with grilled peaches and whipped cream for a satisfying Italian dessert. It also comes in an orange flavor called Creamsicle. Didn’t you always love Creamsicles as a kid? A grilled Costco Hot Dog - because Queretaro is a long drive when you’re this hungry and we’re always hungry for Big John’s Munch Box. 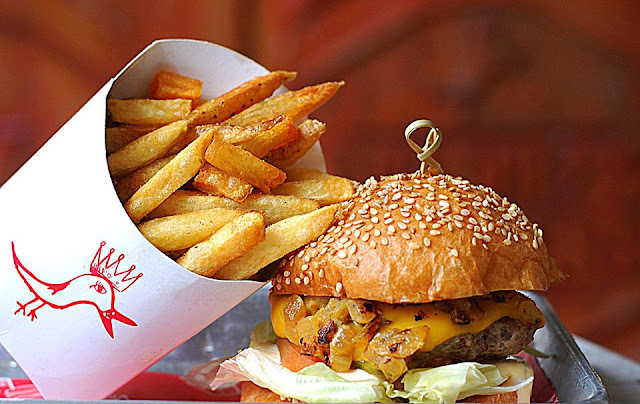 Monday: nothing that a little Birdies wouldn’t fix, served with Sea Salt Fries or, when we’re really hungry, the loaded fries. It’s our weekly addiction. 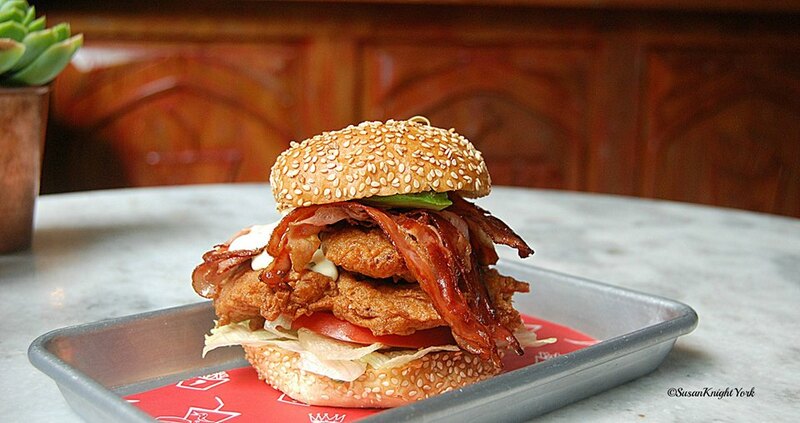 Birdies Chicken Sandwich: Just seeing this sandwich is suggestion enough. Ridiculously good and probably one of the biggest and best chicken sandwiches I've had since I’ve been in SMA, it's batter fried chicken, bacon, avocado, tomato, lettuce and a special dressing. 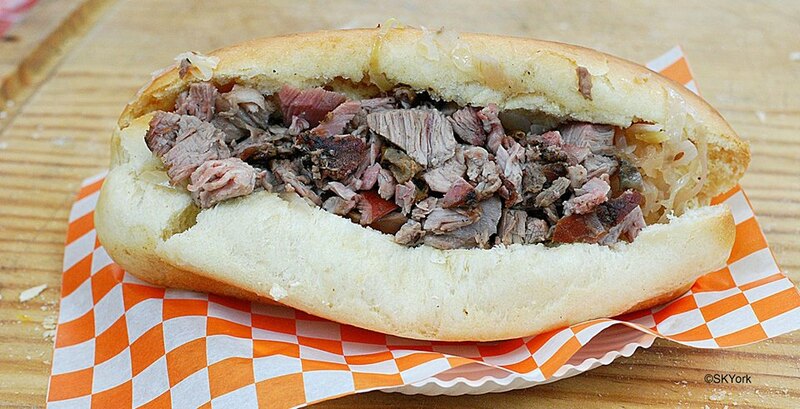 Belly up for this one; I wasn't hungry for days after tackling this sandwich. Bovine was nominated for the Best New Mexican Restaurant for the Food and Travel 2018 Readers Awards. Congrats to owner, Bruce James and chefs Paul Bentley and Miguel Nunez for the prestigious nomination. The Oxtail stew with bone marrow sauce is the richest thing we ate in 2018… and also one of the most delicious. 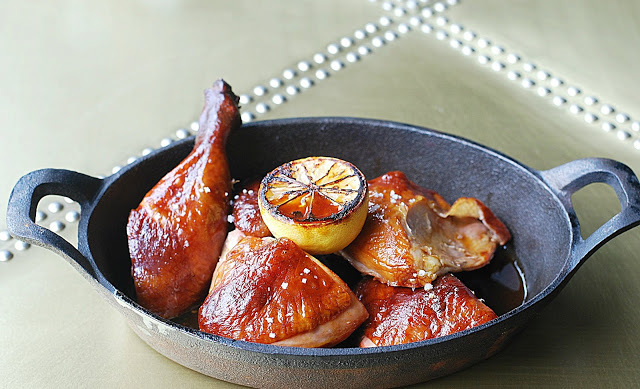 If its chicken you’re craving, the slow, smoked essence of Bovine’s chicken is definitely worth the wait. 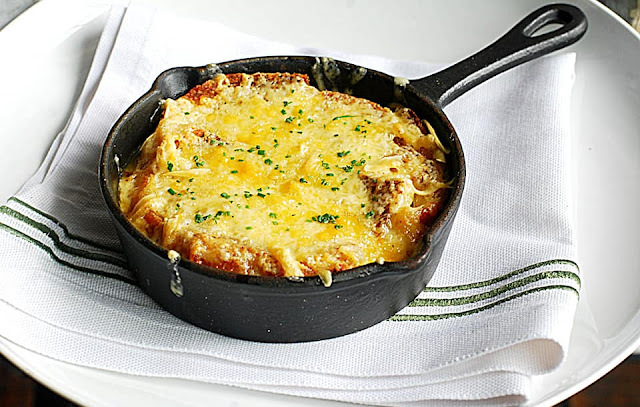 How to make the perfect French Onion Soup? 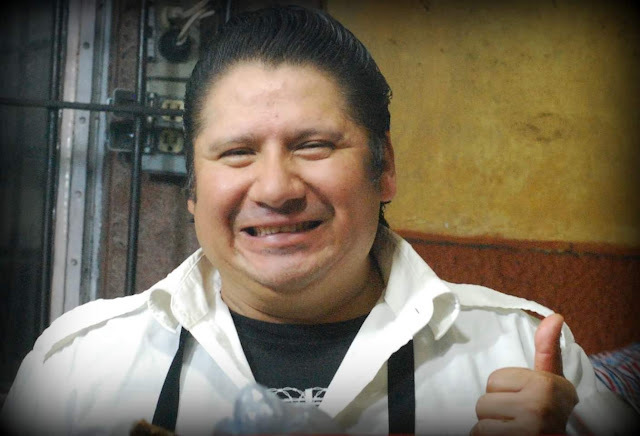 Just ask Chef Miguel Nunez, who has created the best soup in SMA; our favorite soup this year. 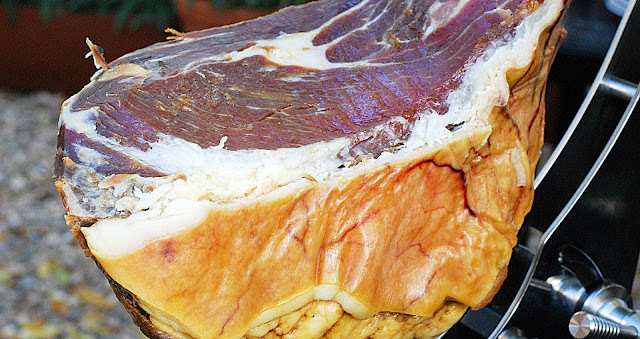 Because when you crave a great steak, you should always go for the best! 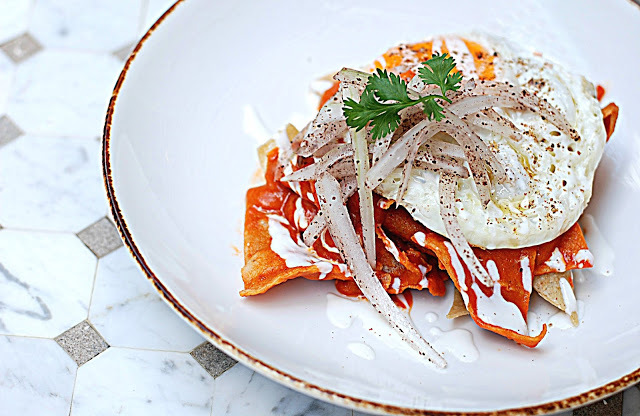 Photo by Don Ledsworth Jr.
Moroccan Chilaquiles, distinguished by a tomato-harissa sauce, feta cheese, goat yogurt, cilantro, onion and a fried egg; different and delightfully delicious. Mana’esh: Zaartar flatbread with labneh cheese, tomato and mint and a fried egg: our favorite breakfast pizza. When you crave steak and bread, it’s Ribeye Meloui, one of our favorite dishes at Café Casa Blanca. Where will you be this New Years Eve? 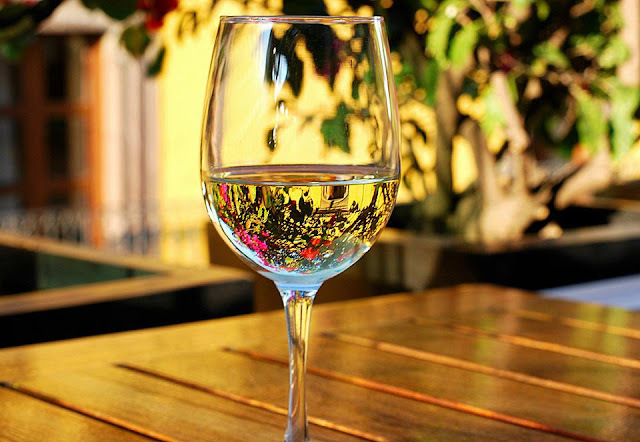 Guest dining at Café Casa Blanca will get the extraordinary thrill of a New Years toast from the rooftop of Fatima and watch the fireworks from there. 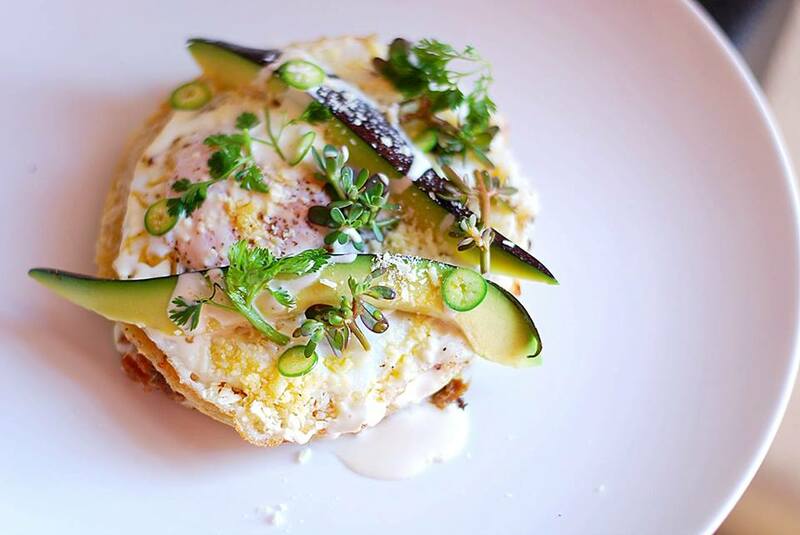 Huevos Rancheros: because Chef Mariana Gonzalez Gutierrez has got her sauces down to a science + art. She also makes the best mole in town. What else is more satisfying on Sunday morning than an oversized, American breakfast? Cathy’s Breakfast - sometimes we just need a big gringo fix. 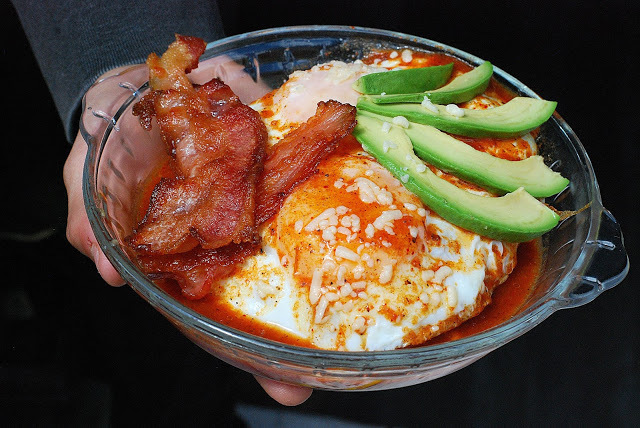 Huevos con chile pasilla: best Mexican breakfast and look at the size of the serving. 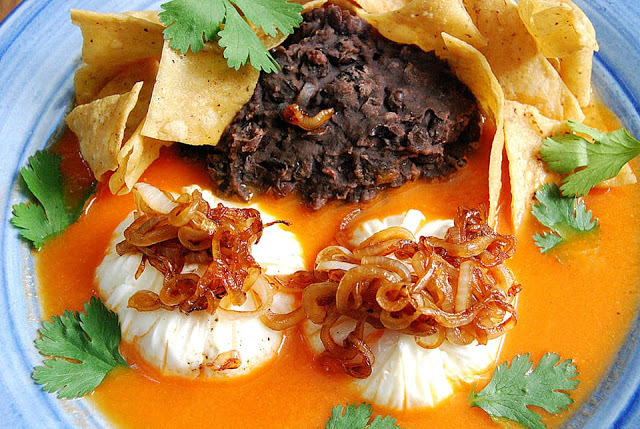 All of Café Muro’s servings are enormous. 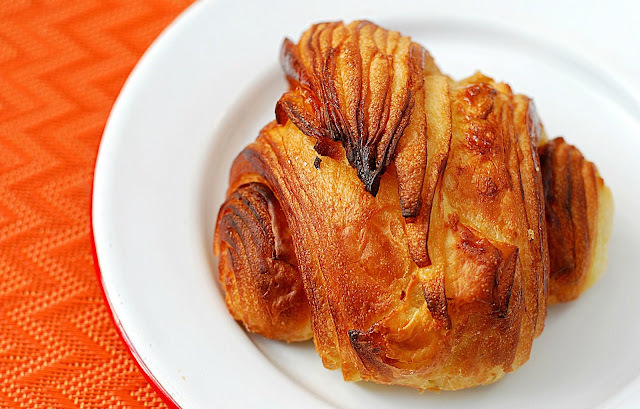 The most buttery Croissants; one of the many pastries created by their baker at Marulier and served every Sunday morning. Carnitas: because everything tastes ten times better when it’s grass-fed and served in the heart of their wide-open-spaces. 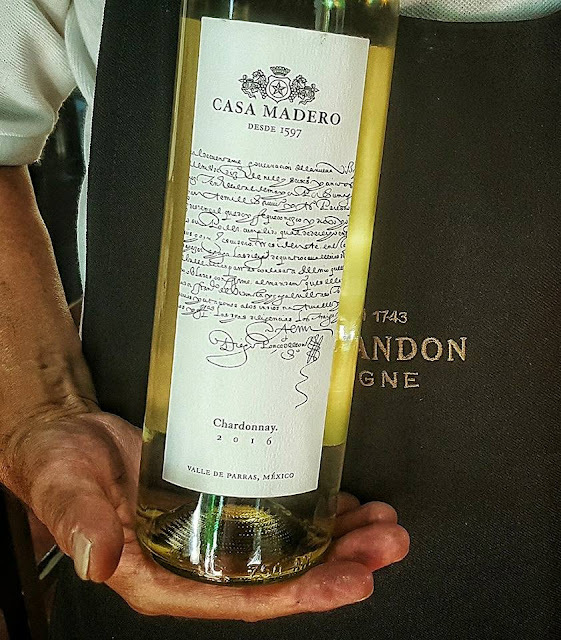 Casa Madero Wines has won over 500 awards in its history and is the oldest winery in the Americas. 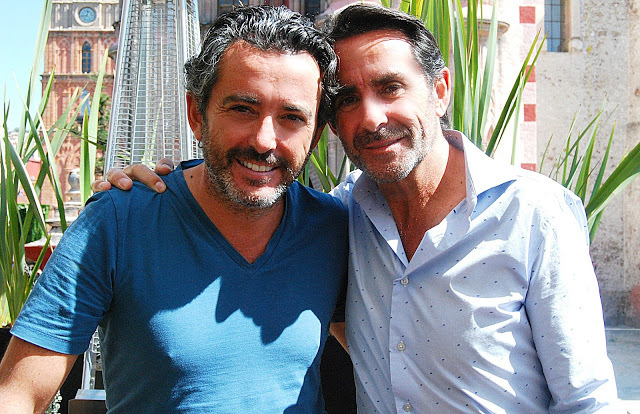 Thanks to Ricardo Sautto of Bacco and Cava Sauto for introducing us to Casa Madero Chardonnay and Casa Madero Rose. Cava Sautto just opened a new liquor store on the Ancha in the old Mercado Centro/Espino’s space. A huge congrats to Valeria Sautto on the opening. 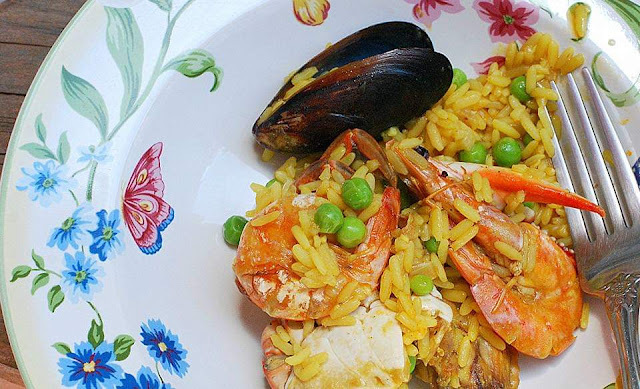 Seafood Paella: because one of the best culinary instructors in SMA makes everything better than everyone else; it’s a rule! 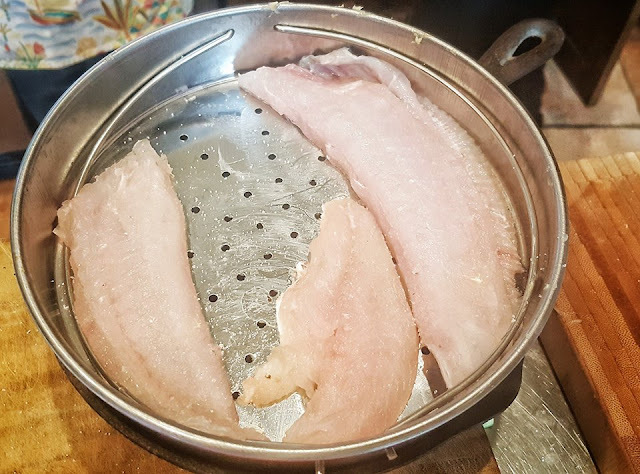 Smoking Fish: The chef took a cast iron pan and put wood chips in the bottom - absolutely no water - placed a steamer pan on top with three different thin fish fillets, then covered the pan with aluminum foil. He cooked the fish on top of the stove on low heat for 10 minutes. The fish was perfectly cooked and lightly smoked. Kitchen life would have been a lot easier if I had learned this 35 years ago. 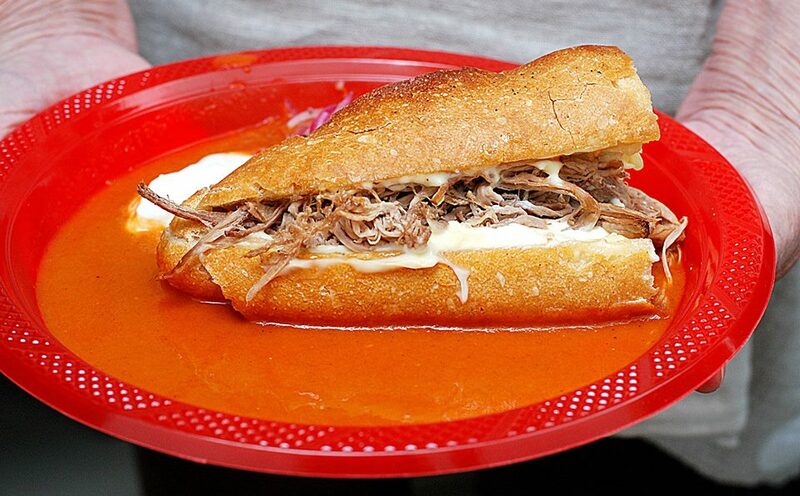 Torta Ahogada: because this treasured family recipe has stood the test of time. 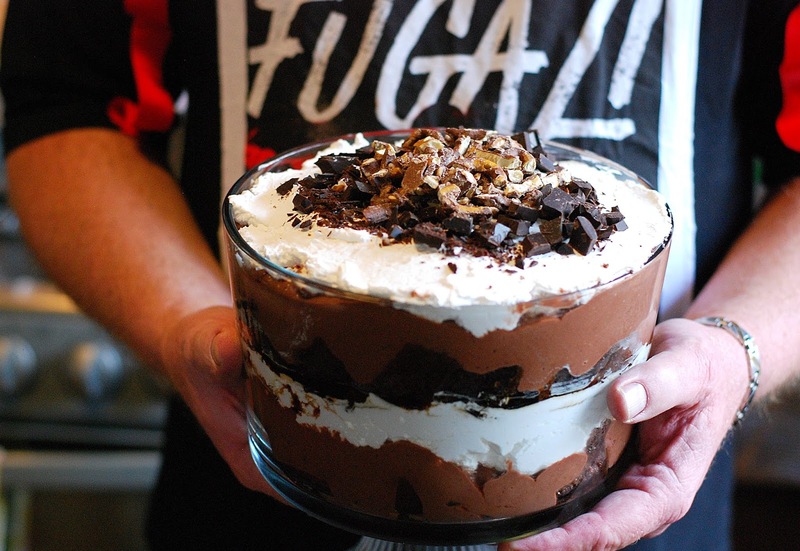 We loved this recipe almost as much as much as this talented chef. 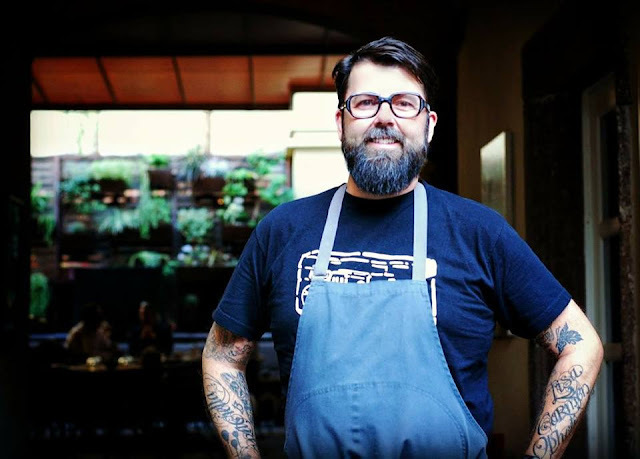 Chef Antillon now cooks for private events and dinners. 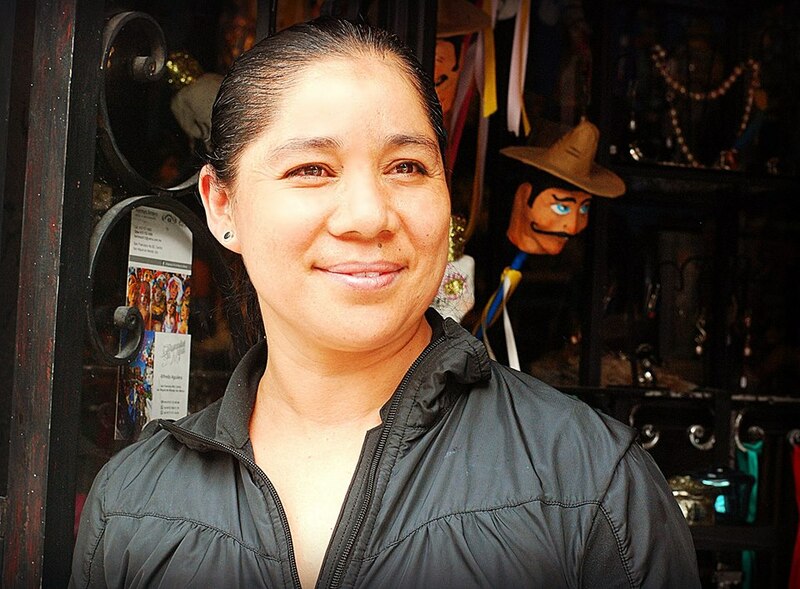 You can contact her by calling Nomada cocina de Interpretacion at 415-121-6165. Sinfully delicious was Franklin Terry and Rick Thompson’s Christmas dessert, a rich, creamy, and rather boozy Kahula filled Chocolate Trifle.The founders of Club Luna, a private dinner club in SMA, know how to entertain, especially around the holidays. 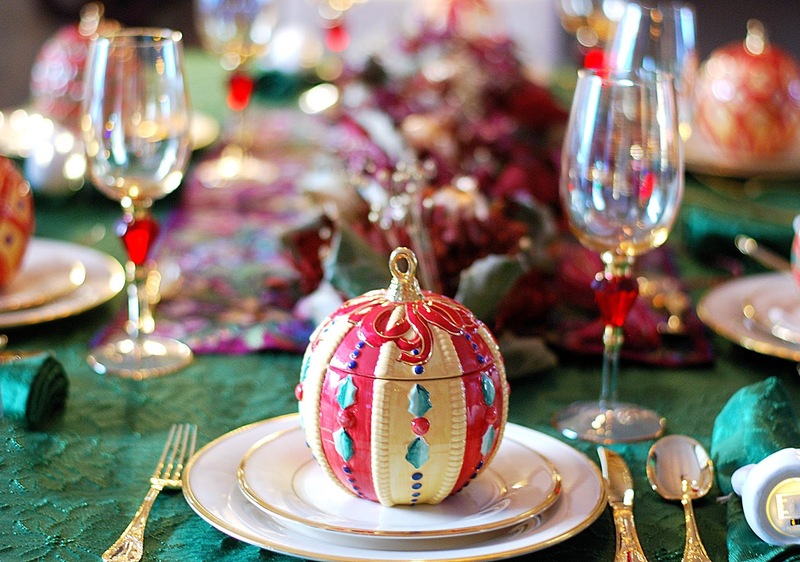 We were delighted to sit down at their beautiful Christmas table which featured a striking textile from Evita Avery’s La Calaca, Mesones #93. Great pizza in SMA? 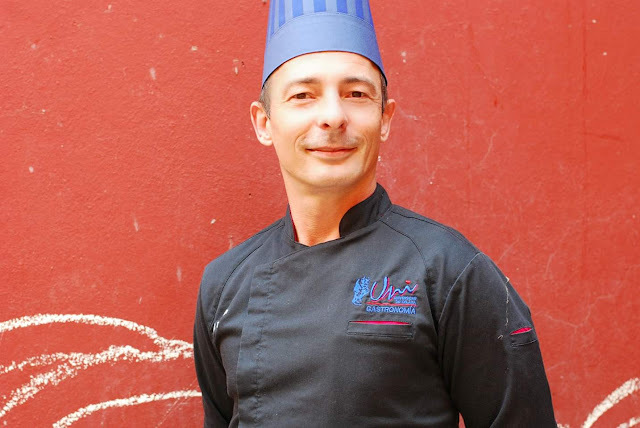 We have it thanks to instructor Fulvio Carbonaro, who taught pizza making classes for many of the chefs in town. 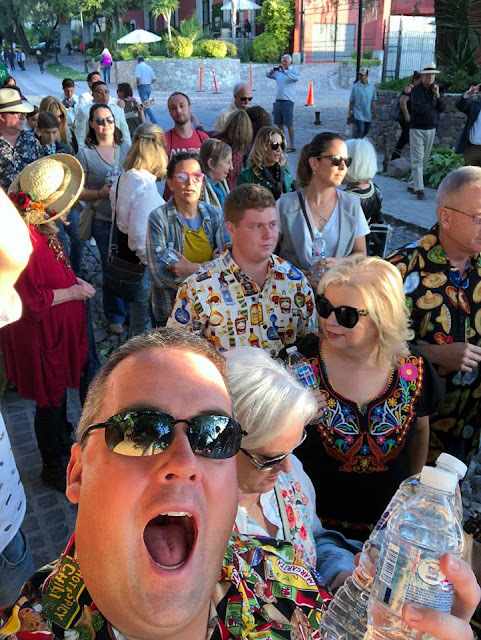 Thanks to OCRE, Marsala cocina con acientos, Aperi, MiVida and Atrio for participating and for Gilda Carbonaro of Culinarian Expedition for organizing. 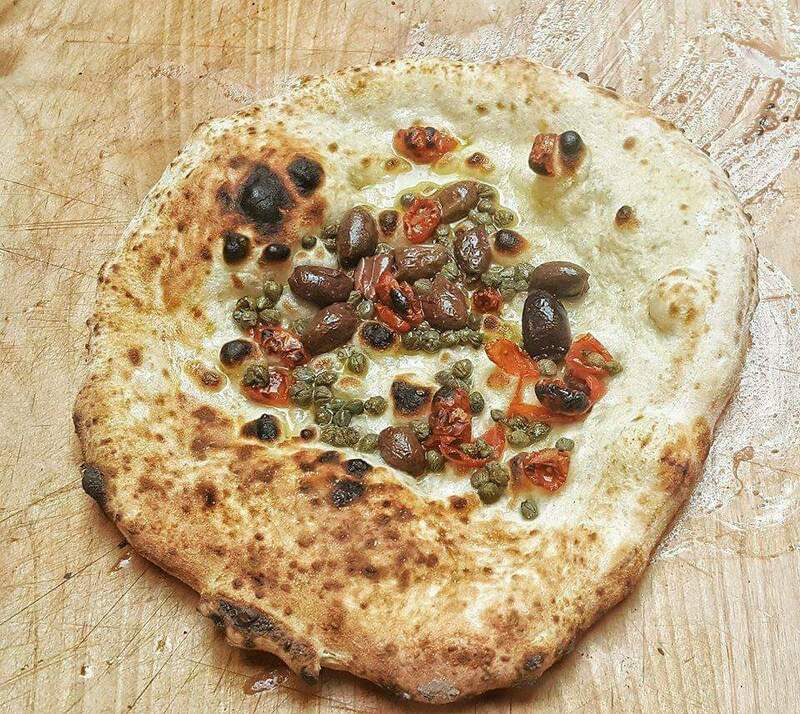 Our favorite: the olive pizza Mediterraneo'; made by the master himself, Fulvio Carbonaro. 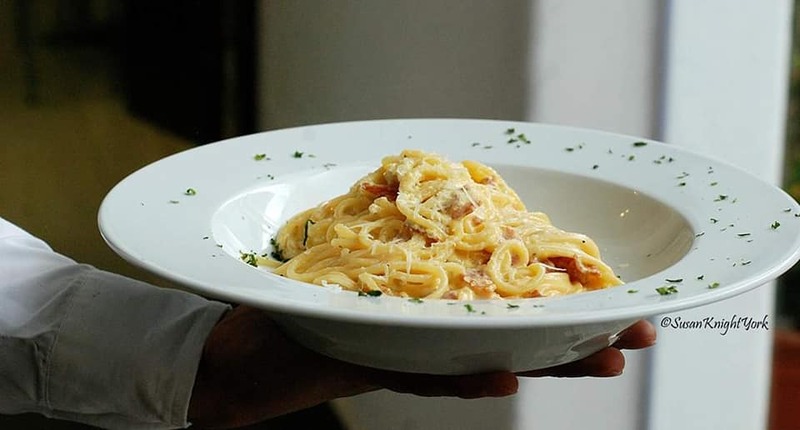 Carbonara overloaded with pancetta and Spaghetti Bolognese from this Italian treasure in the middle of downtown Dolores Hidalgo. The most delicious pasta in GTO? We think so. 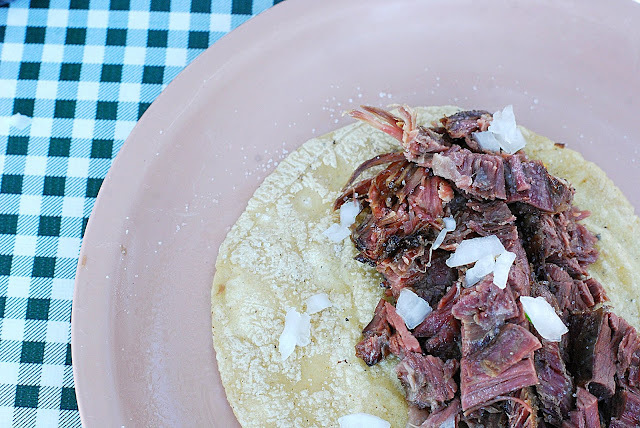 We thought that nothing in SMA was better than a bowl of El Pato’s Mixiotes; the Mexican version of your mother’s Sunday pot roast, but it turns out there’s something else that enlivened our taste buds this year: Espaldilla: the shoulder that has more fat and is much tastier than most other parts of the lamb. Eggs Benedict: because there’s nothing better than an old classic but more important, they toast their English muffins. You can also get a half order. 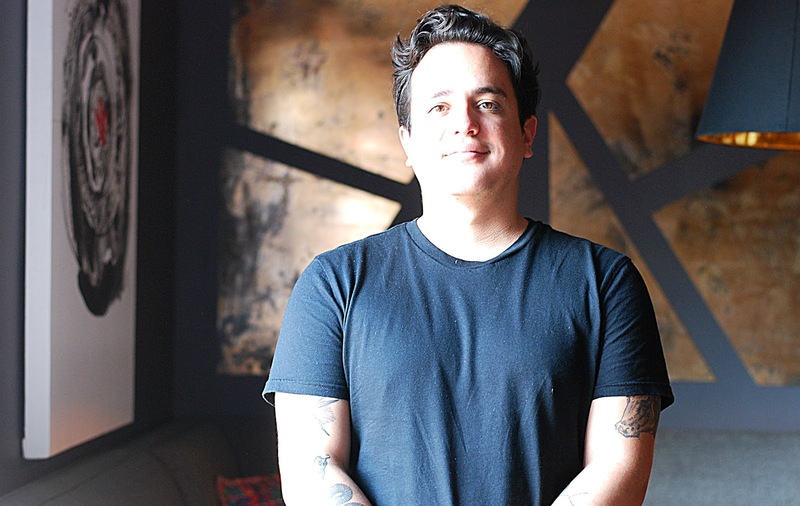 Congratulations to Ari Vasquez, who is the new chef at El Vergel Bistro and Market. 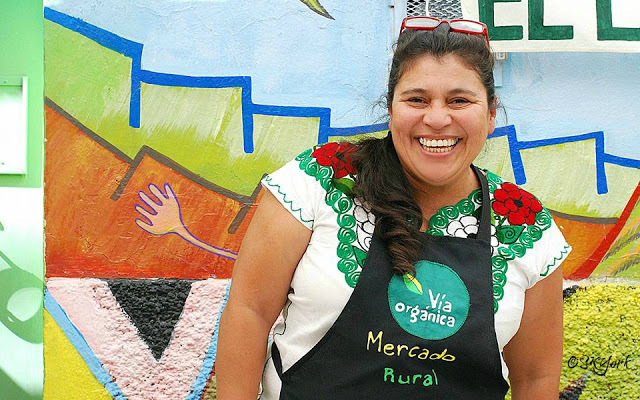 She was El Vergel’s Sous chef before being promoted. 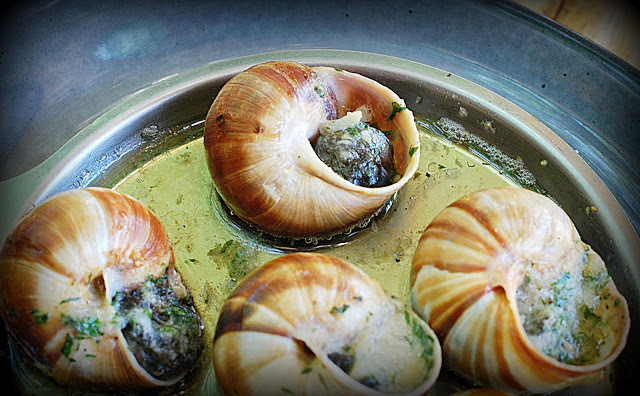 How can something swimming in butter and garlic be anything less than fabulous? Tuesday – Sunday: 9:00 AM – 6:00 PM except Friday and Saturday open till 9:00 PM. Closed Mondays. 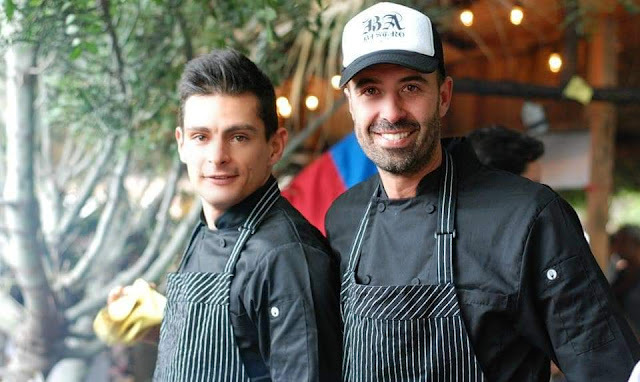 At the Food and Travel 2018 Readers Awards this year, Chef Israel Loyola Espinosa was nominated for Chef Promise and Mixologist Adrian Garcia Evans was nominated for best cocktails. Chef Israel Loyola Espinosa celebrated his 2nd anniversary at a dinner with renowned Chef Alex Ruiz of Casa Oaxaca. The fabulous Short Rib in Istmeno Stew was the highlight of this seven course dinner. 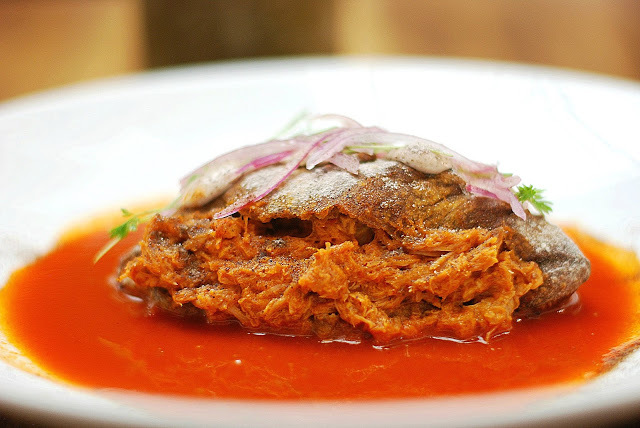 Chef Israel Loyola Espinosa uses some of our favorite ingredients in his Cochinita Pibil Ahogada sandwich including pickled onion and habanero chili with avocado leaf and bean mayonnaise. 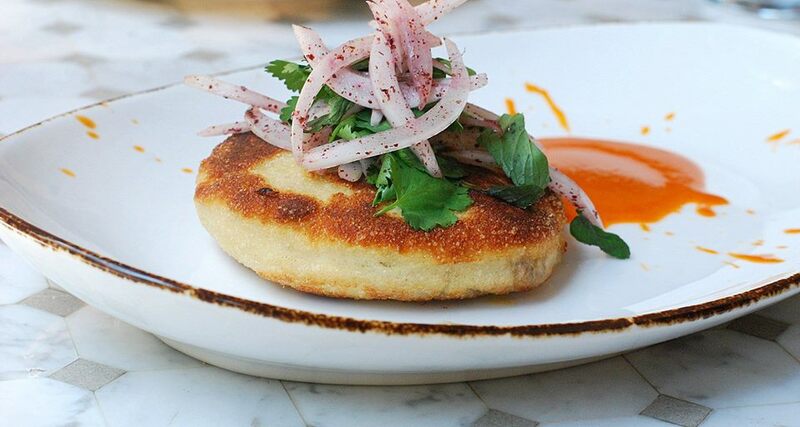 The bean bolillo adds some remarkable new flavors to one of our favorite dishes. 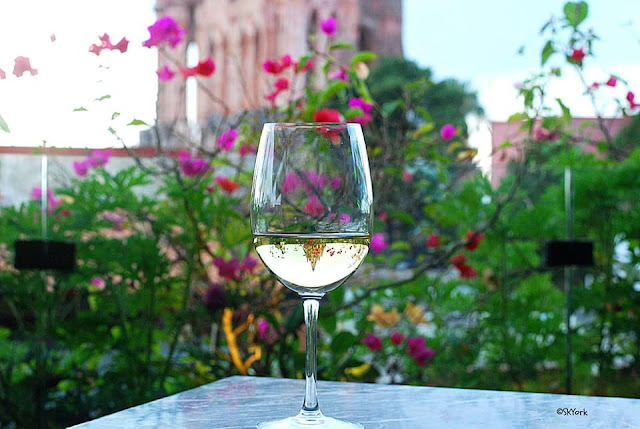 Sunshine + Bougainvilleas: a prescription for Chardonnay with supreme floral notes. 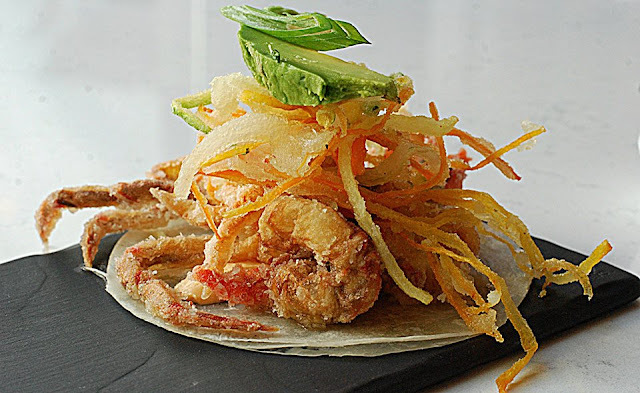 Always memorable, no matter how may years we loved it, is the Shrimp Jicama Taco: because the best taco in Mexico deserves to be savored over and over, again and again, year after year. 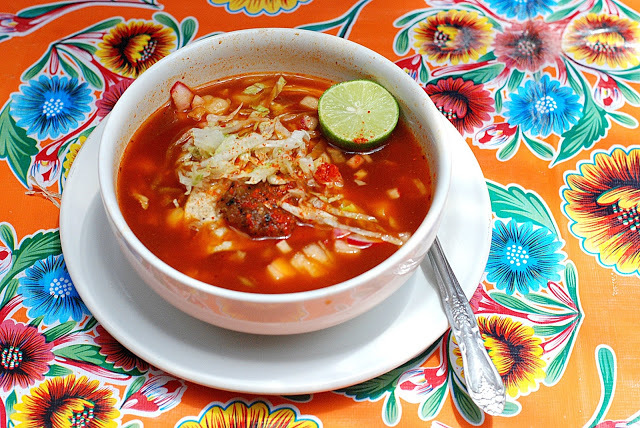 Because red pozole that’s peppery, spicy, loaded with chicken, pork or beef, and served with eight different toppings and spices needs no holiday to be appreciated. 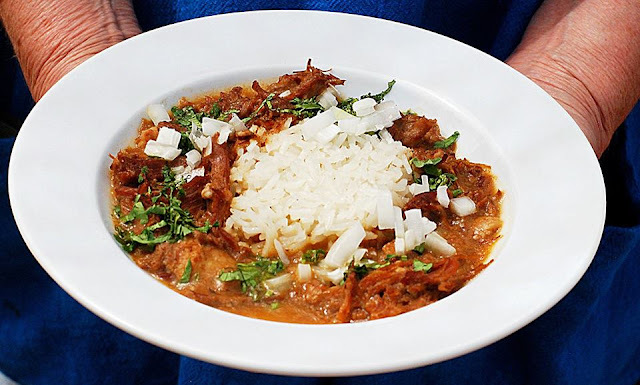 Birria by Sushi 23 - our favorite dish was served with rice, much like a Cajun Gumbo. 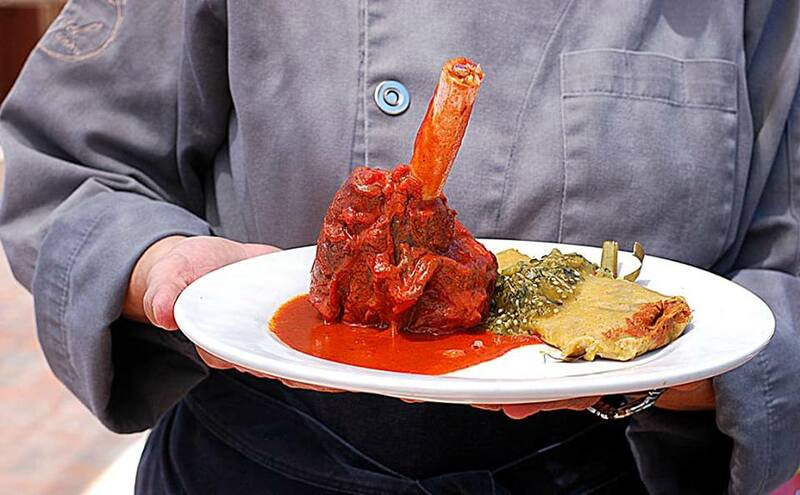 Chef Magda Elisa Pablos’s Lamb Shank, Pibil style, with a tamal made of corn masa, mashed roasted plantains, sweet potato and duck fat wrapped in a banana leaf, tomatillo sauce with mint and Habanero sauce and ginger and cardamom. She got us at duck fat! 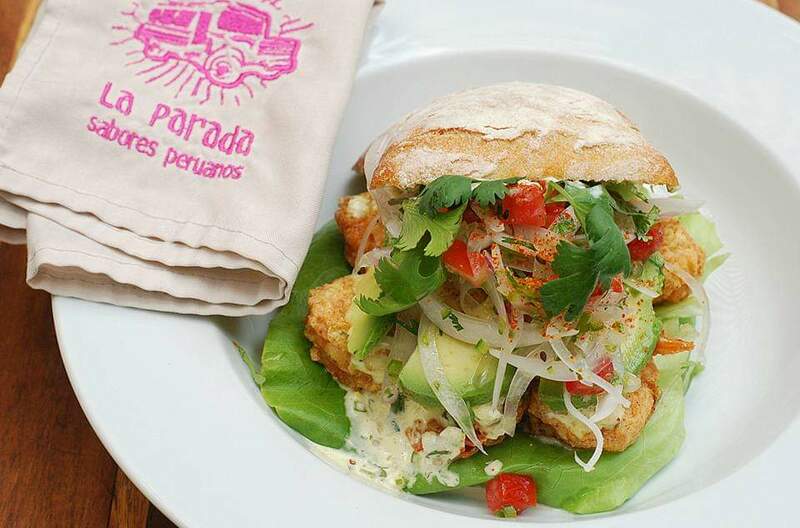 This sandwich tastes exactly like the shrimp poorboys you get in New Orleans on a soft Ciabatta with fried shrimp, and lots of it, piled high with lettuce, pickled onions, tomatoes, avocado and a tartar sauce. One of the best sandwiches we had this year. 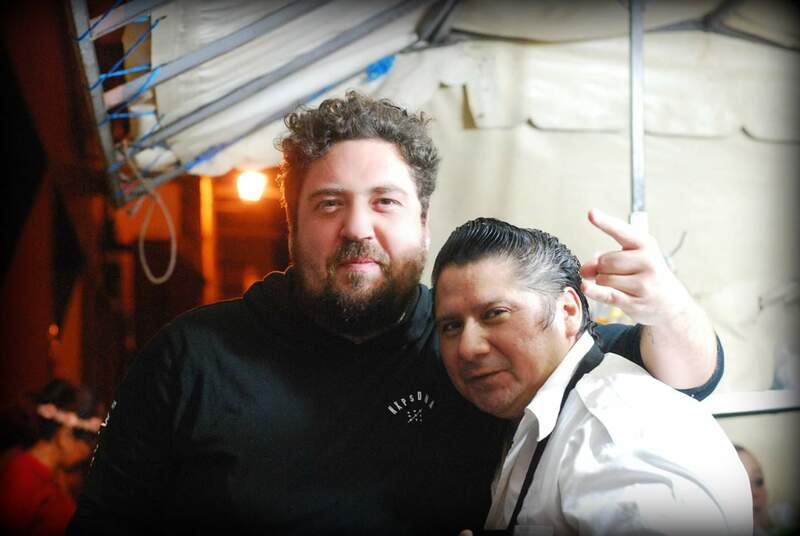 Chef Alexandra Gutt and her husband, mezcal aficionado, Juan Leon De Vivero, opened a new mescal bar, San Mezcal, three doors down from La Parada. 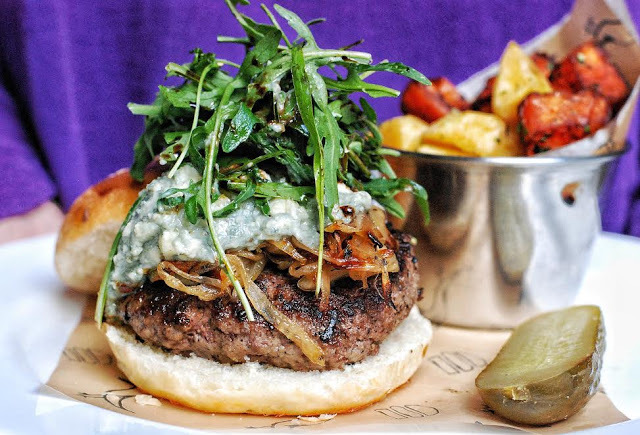 Chef Alexandra Gutt has created a great bar menu with over 10 different dishes to choose from. 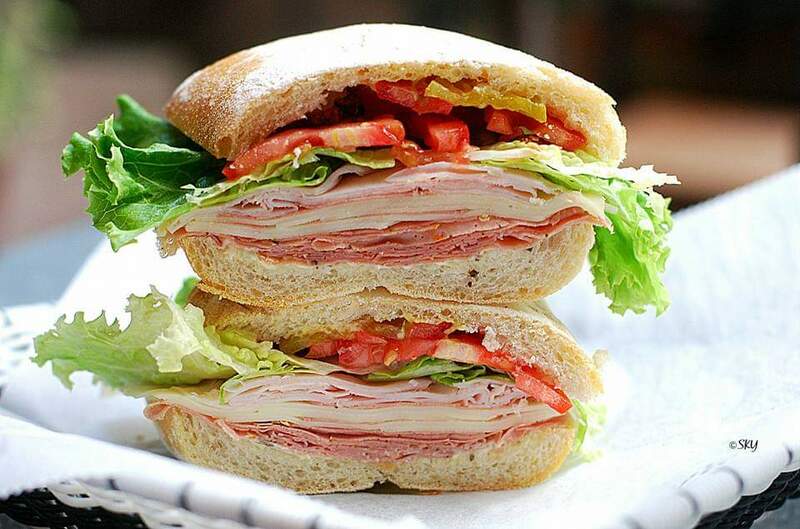 I hear there’s a BLT with my name on it! I was so impressed with Kirsten West’s knowledge of Mexican food. 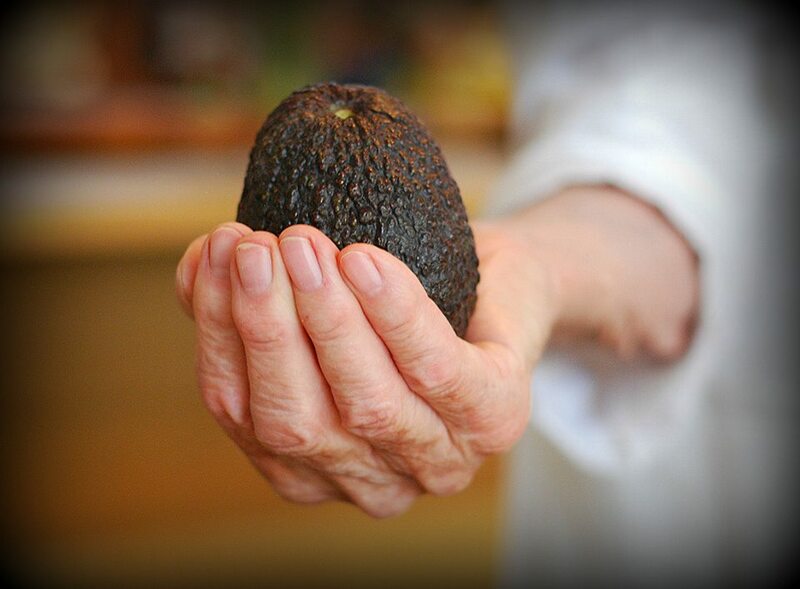 She’s a wealth of information, having learned a lot from her former boss, Rick Bayless, although there’s no doubt he learned a lot from her too. 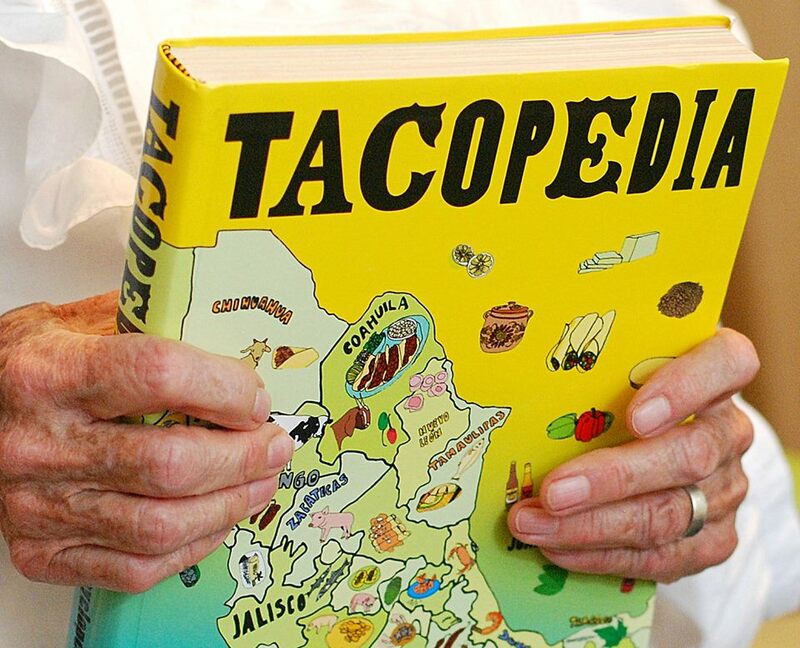 In fact, after taking her class, I imagine her sitting in his library going though every single cookbook; the largest, privately-owned collection of Mexican cookbooks in the U.S. I’ll tell you a secret - it appears that she memorized each and every one of them. She was also Mick Jagger, of the Rolling Stones, private chef for four years. 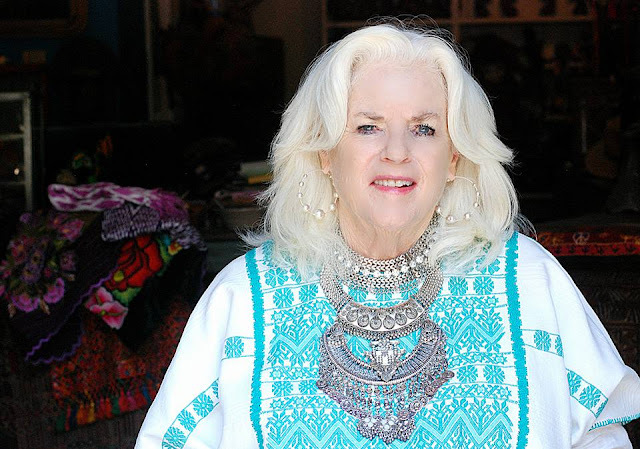 The stories from her career are entertaining and funny. Her appreciation for all things Mexican made this class beyond just the usual learning experience. 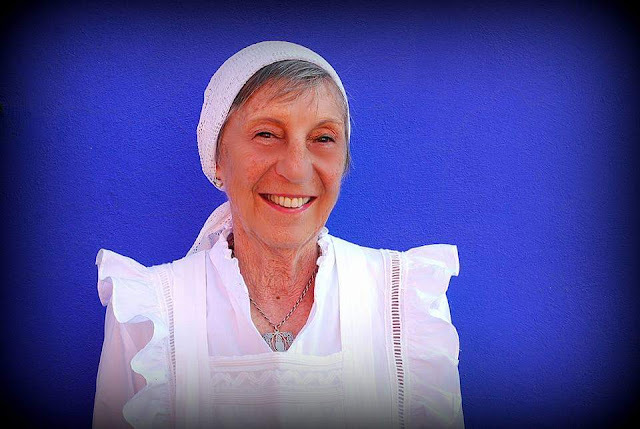 She once told me “ I have deeply ventured into the mysteries of moles, experiencing some ‘near religious experiences’ preparing them.” My fascination with her hands gave me an almost spiritual experience that day; one of the best classes I’ve taken in SMA. Kirsten is also a teacher at the Lifelong Learning Program at the Instituto Allende. Huevos Rancheros: because if I died and went to heaven, I’m sure this is what I would eat on the way there. 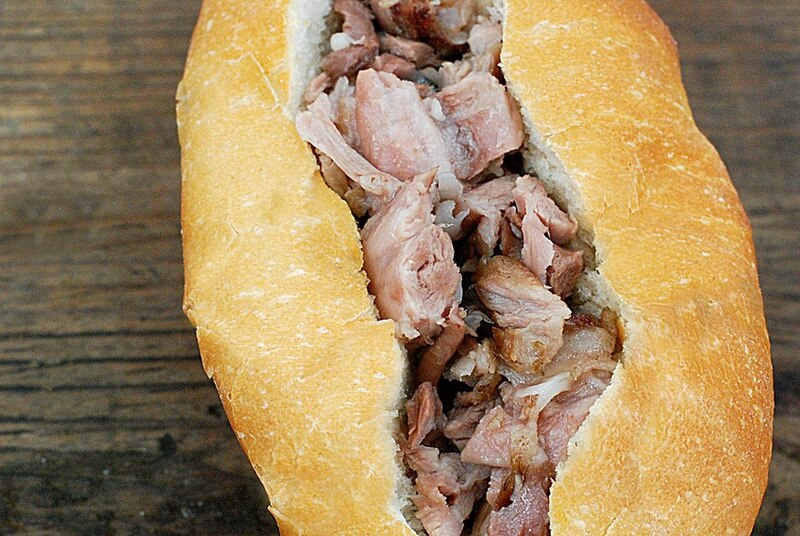 There’s a long line down the block every day; go early. Because recovering from this view requires masssive amounts of pastry. 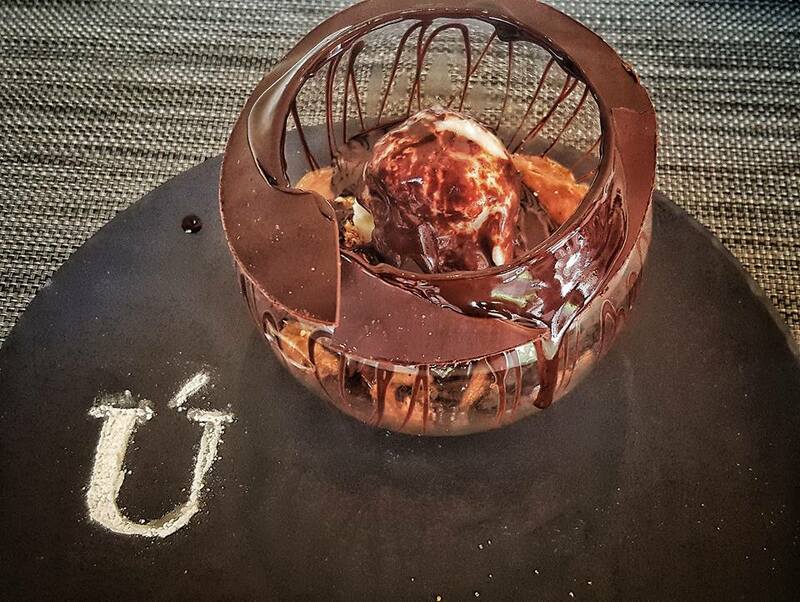 We adore all of their desserts, including Death by Chocolate: Cordelion: chocolate brownie, chocolate mousse, caramelized acorn, vanilla ice cream and hot fudge sauce. Softshell Crab Taco: There are many in town; this is one of our favorites. 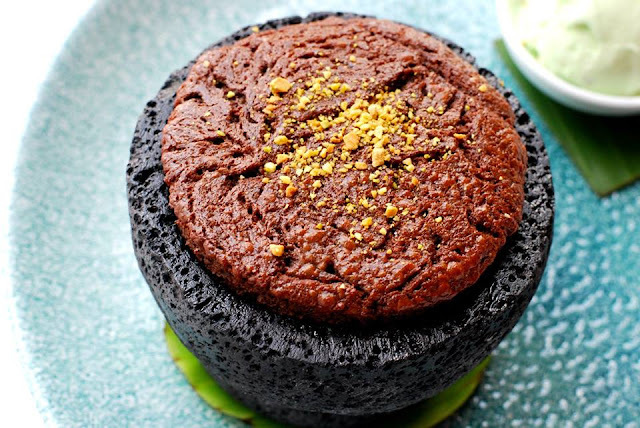 Desserts: The Molcajete of Chocolate Semi-Amargo with pistachio ice cream and the Strawberries on coconut ice cream with Cajeta and dehydrated carrots. Yes, you got that right…carrots. 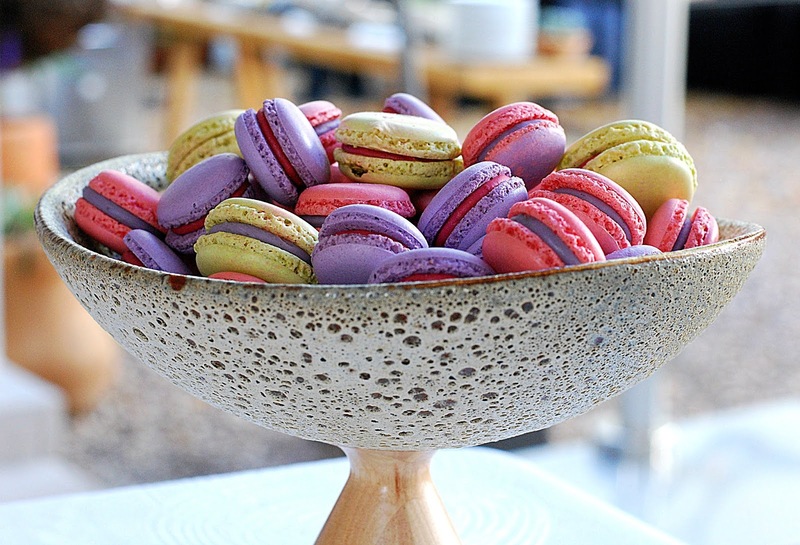 And, the desserts at the weekend brunch. And speaking of Live Aqua, SMA welcomes Chef Eduardo Palazuelos who hails from Acapulco. 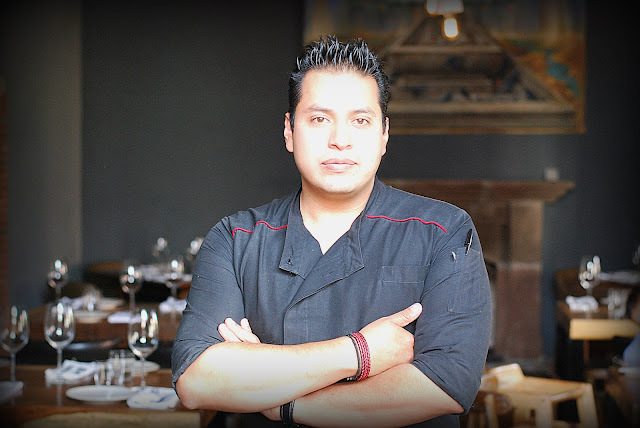 Chef Palazuelos created the culinary concept, MEX-THAI, a flavor long missing from SMA’s culinary profile. We love Luna de Queso because we think a sandwich is not a real sandwich unless it’s jam-packed with good ingredients. 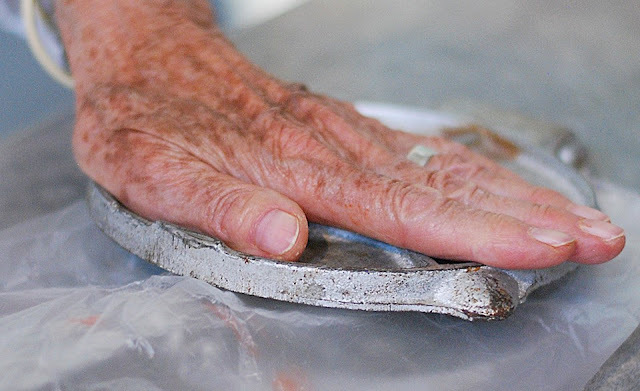 Luna de Queso selects the best products made by hand, with natural ingredients by local producers and farmers. This Italian aperitif is similar to Campari but sweeter. The color is an attention-grabbing vibrant orange and has been showing up at festivals across the US and Mexico this summer and fall. 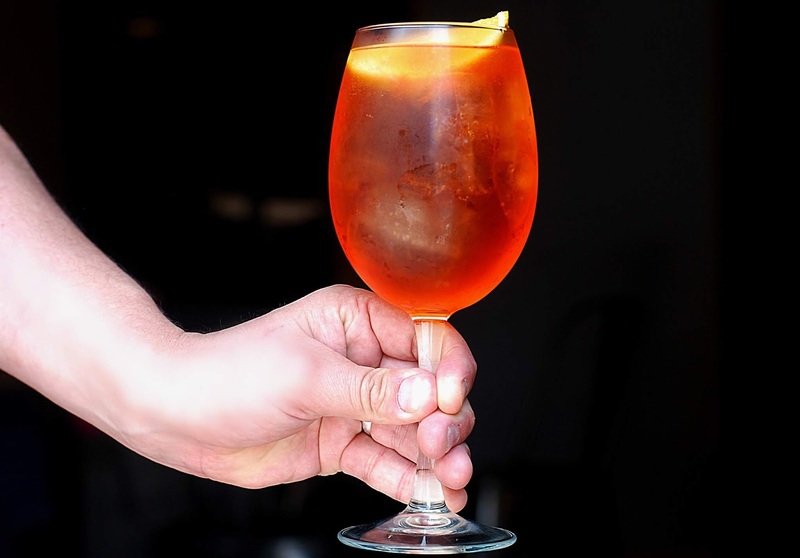 Leave it to Mixologist, Adrian Garcia Evans, who’s on top of every trend, to bring the Aperol Spritz to MAG, where it became the most popular drinks of the festival. 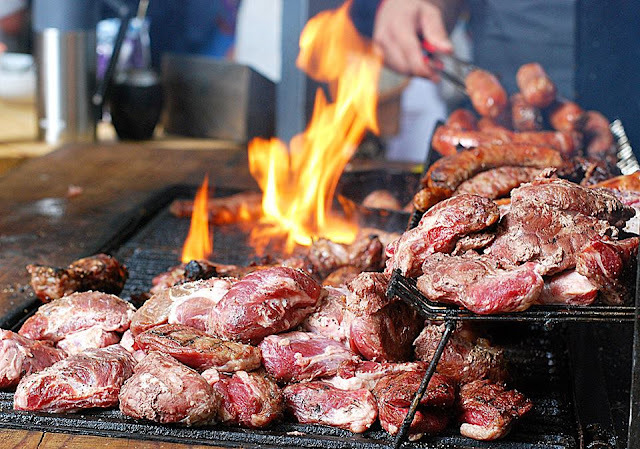 Always a favorite for festival goers in SMA, we loved the offerings of Buenos Aires de Campo, which is featured under Oktoberfest in this article. 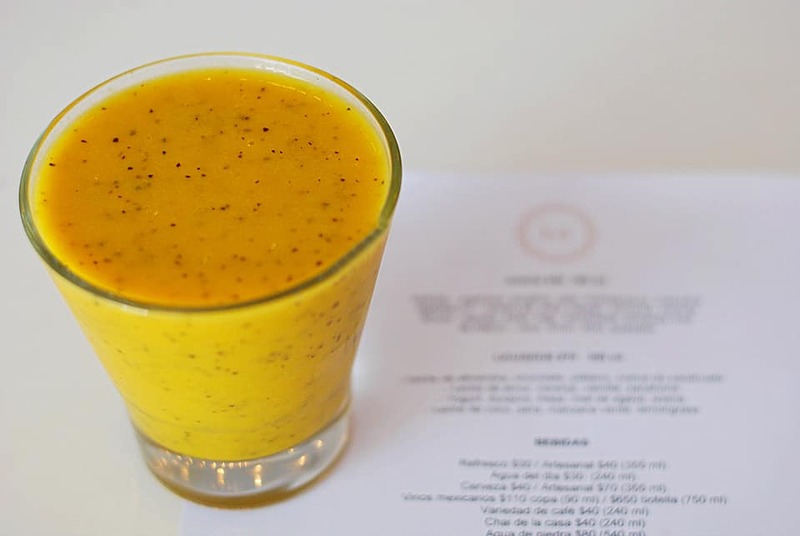 Leave it to a good chef to know how to make juice taste good. Her four juices are made from fruits and herbs; without any sugar or sweeteners. Where are we headed in 2019 for juice? 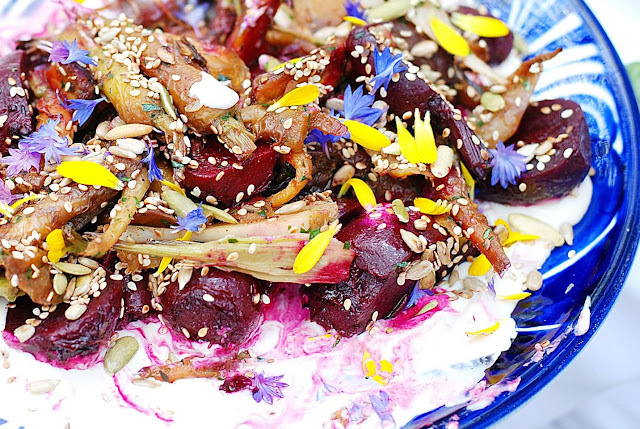 Someone needs to open a good juice bar and get Chef Sofia Antillon’s recipes. 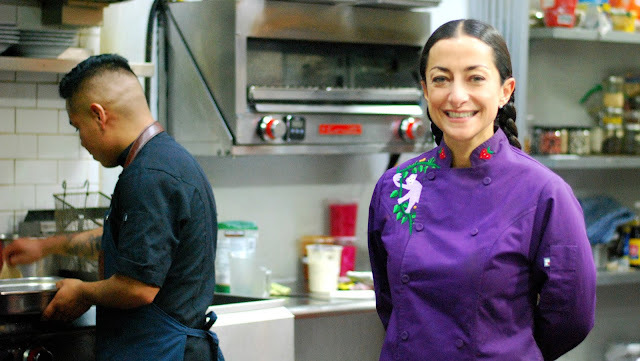 Chef Sofia Antillon now cooks for private dinners and special events. 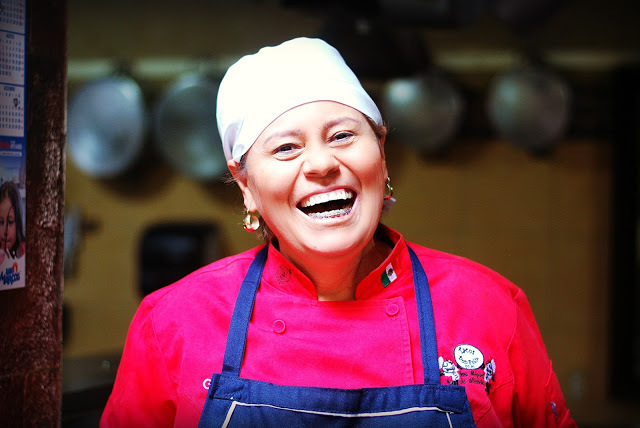 She will be the chef at a dinner this New Year’s at Terraza-Trinitate. Contact her at Nomada cocina de Interpretacion for information. 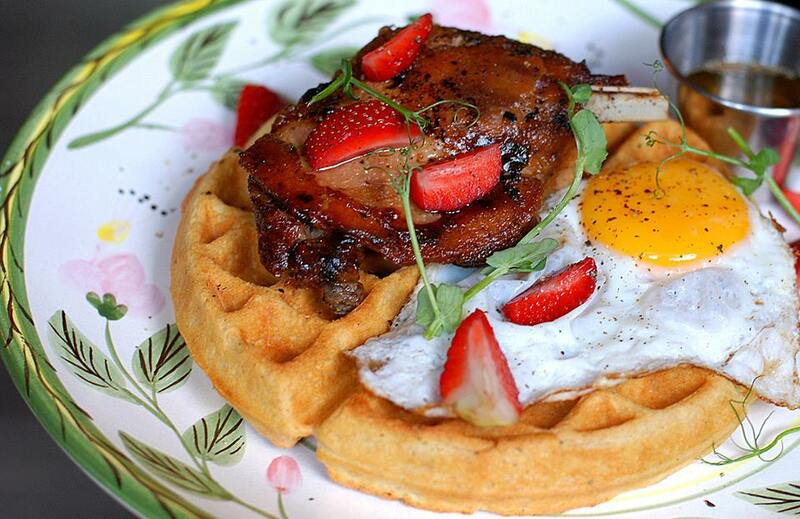 Waffles and Duck: Nobody in SMA cooks duck like Chef Marcela Bolaño; moist, tender and never greasy with delicious crispy, salty skin. 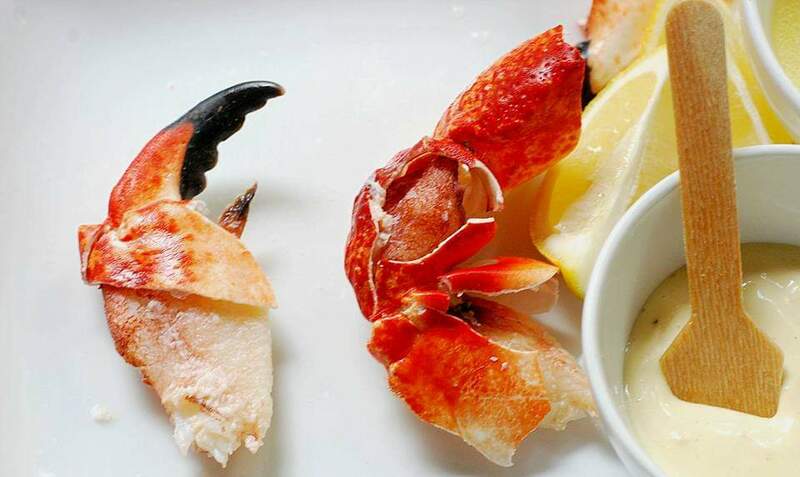 Stonecrab: died and gone to heaven at every Sunday brunch. 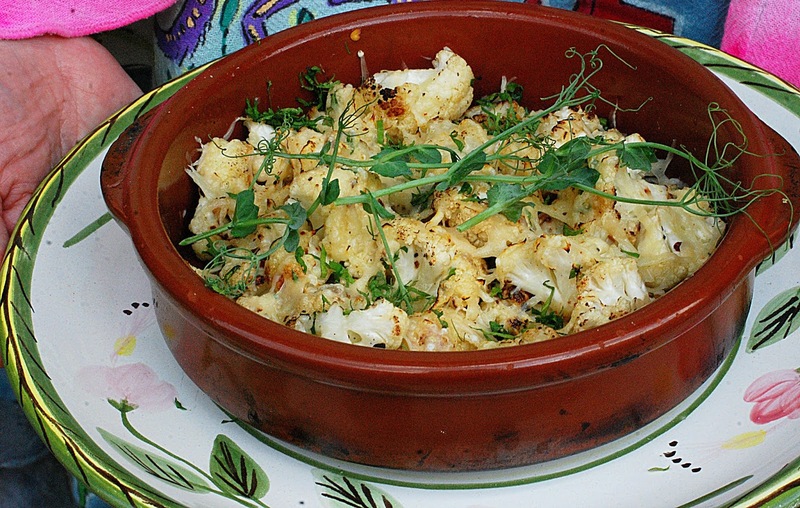 Roasted Cauliflower: because when it comes to picking our favorite vegetable, cauliflower is always it. 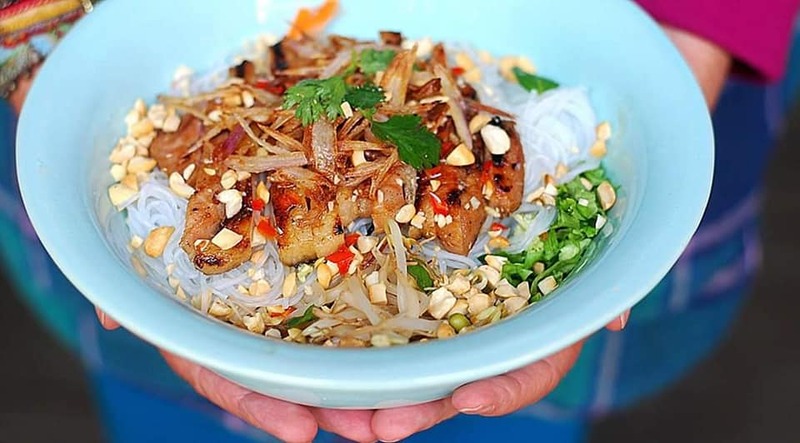 Chef Marcela Bolaño puts her own touch on this Vietnamese Noodle Salad with a perfect balance of tastes, textures and temperatures. 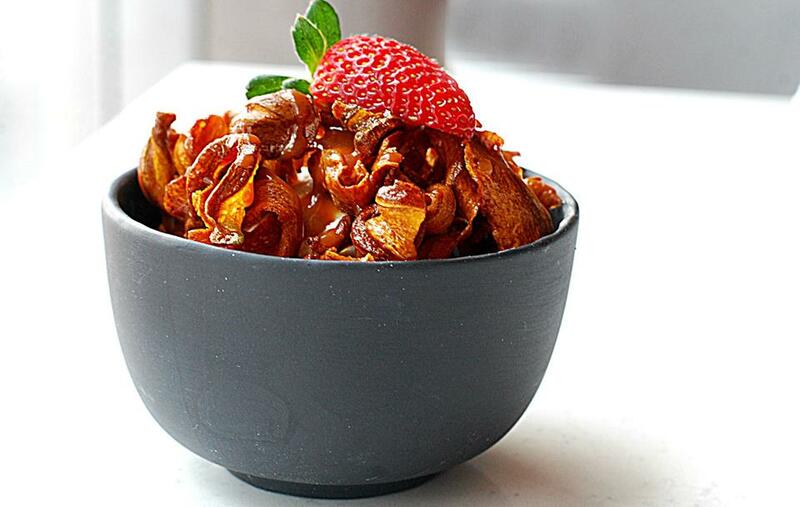 Made with caramelized smoked pork and crunchy shallots, the flavors are as authentic as the chef. 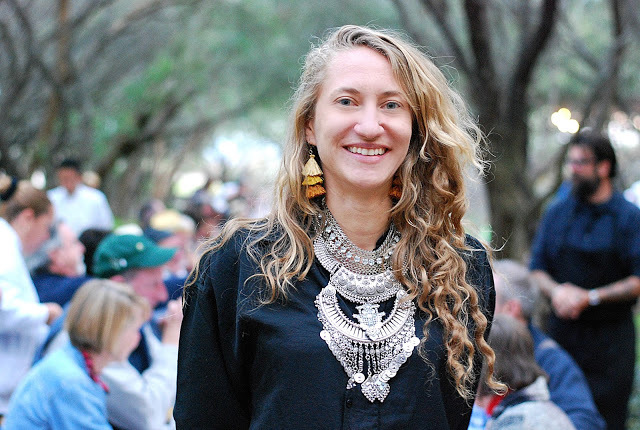 After an extended trip to Southeast Asia, Marcela brought the flavors of Pho back home to SMA. 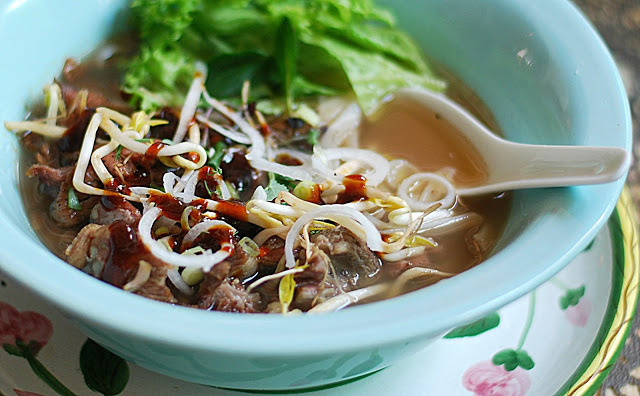 Take your choice of either Pho Bo (Short Rib and Oxtail) or Pho Chay (Vegan). Both are wonderful. Esquites with grasshopper alioli made with white, red and blue ancestral corn from Parzcuaeo by Chef Lula Martin del Campo. Sorry, they’re not on her menu at CASCABEL in Mexico City, but equally delicious Mexican items are. 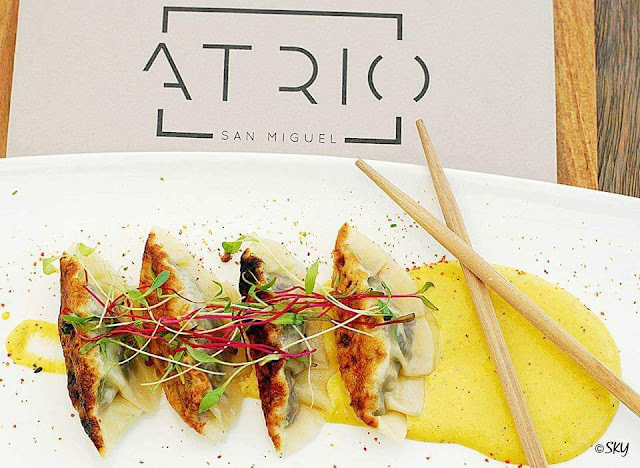 Stop by next time you’re in Mexico City; it’s worth the trip to Santa Fe. 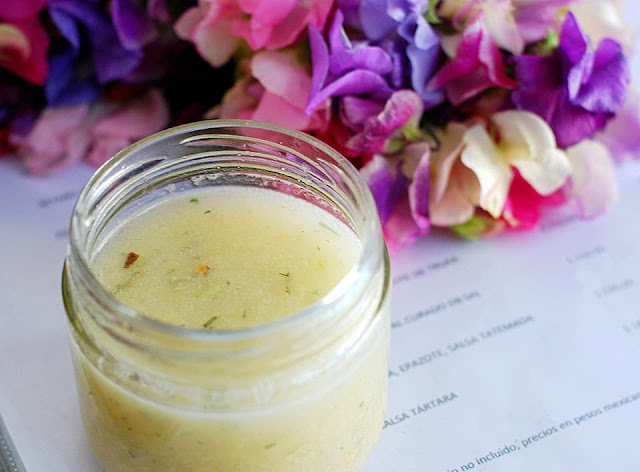 Eggplant Soup with pine nuts, paprika and parsley by Chef Josefina Santacruz. The last two times, I went to her restaurant in Mexico City, Sesame, where she offers street food: Vietnamese, Thai, Indian and Chinese. Sesame is one of our favorite places to go for a great Asian meal. She owns Paprika as well. 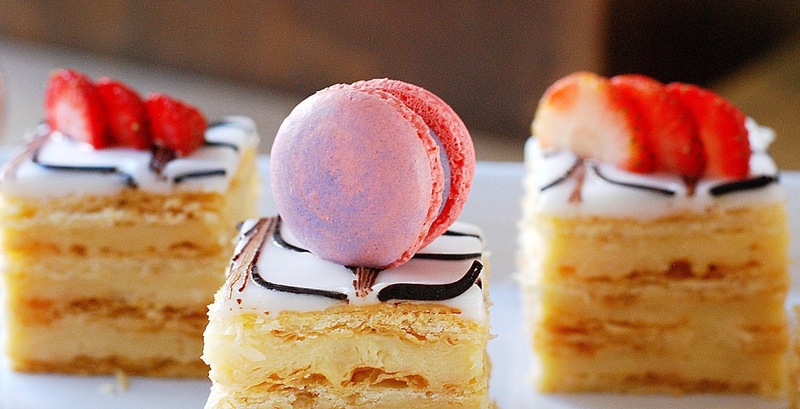 We’re partial to new things, especially when they look this yummy and are in the classification of pastry. 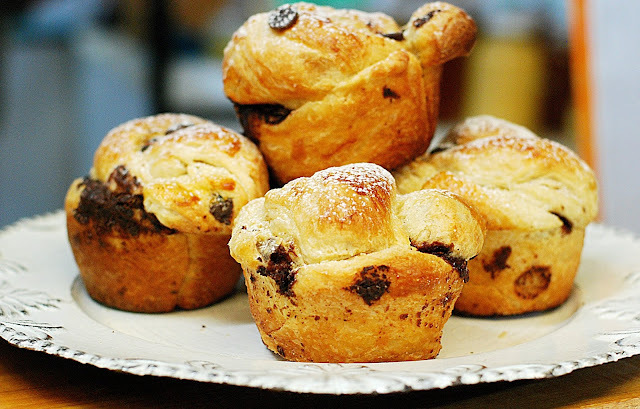 Just when you thought a croissant couldn’t get any better, enter Cristina Mantemayor from Queretaro, who is now at Mercado Sano’s Saturday market serving cruffns: a cross between a croissant and a muffin. She also makes an across-the-board assortment of other delicious pastries and cookies. Pizza Margherita: MiVida is the best restaurant pizza in SMA and we’ve tried them all. Great ingredients are the key to this pizza; served every Sunday and Wednesday. 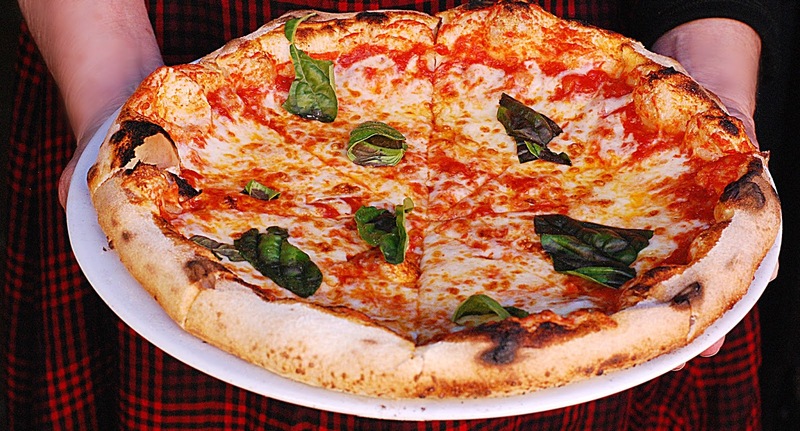 It’s easy to judge pizza if you start with a Margherita. We can also eat their homemade ice cream by the bucket it's so good. 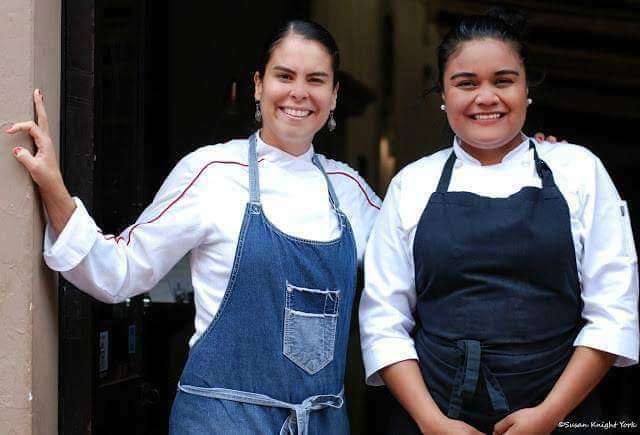 Chef Greta Ortega Casanas and Sous chef Cecy Alverez made the most amazing dinner for ten very impressed guests in the private dining room at MiVida this year. Did you know you can reserve this room for an intimate dinner? Ask about it when you call for reservations. One of the best dinners we did all year. 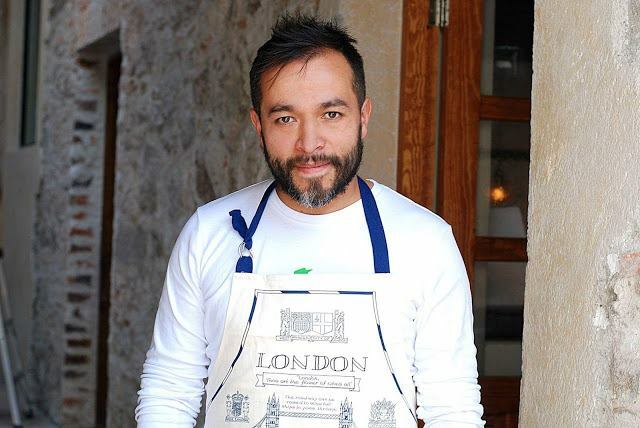 We’re scheduled to try some of the items off the menu from the new chef, Francisco Ibanez, shortly. Stay tuned. at the MAG brunch at Moxi featuring guest chefs from Pinch Kitchen Miami. Sincronizada: A tortilla based sandwich with refried beans and Chicharron prensado (crunchy pork skin that’s been “pressed” to squeeze out the juices and tastes a little like Chinese char siu) covered with cheese, jalapenos, avocado and an egg. 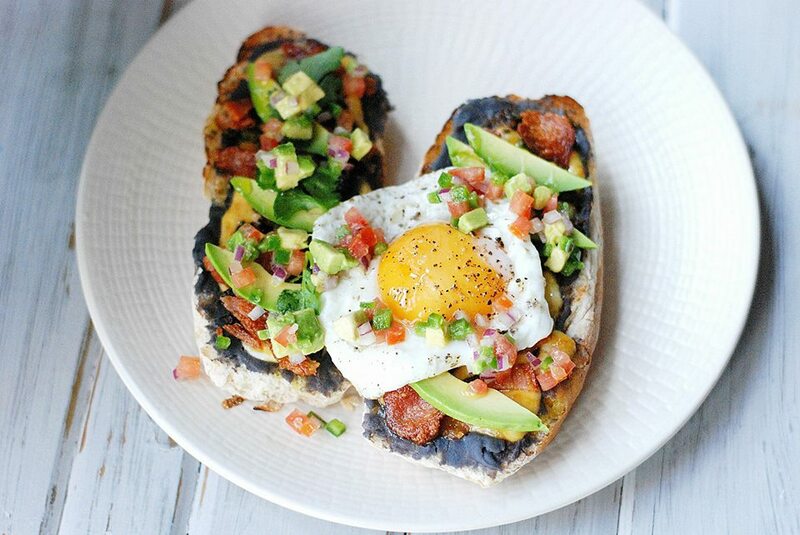 Molletes: bolillio, frijoles refritos, chorizo verde, bacon, pico de gallo, avocado and an egg to top it off. This was our favorite breakfast dish this year. Chef Marco Cruz was named one of the Best Young Talents in Mexico by MillesimeGNP2018, held in Mexico City this past November. Congrats to one of our favorite chefs. At Nomada, always go for the gold; don’t miss the chef’s tasting menu every Wednesday; it’s the best in SMA. 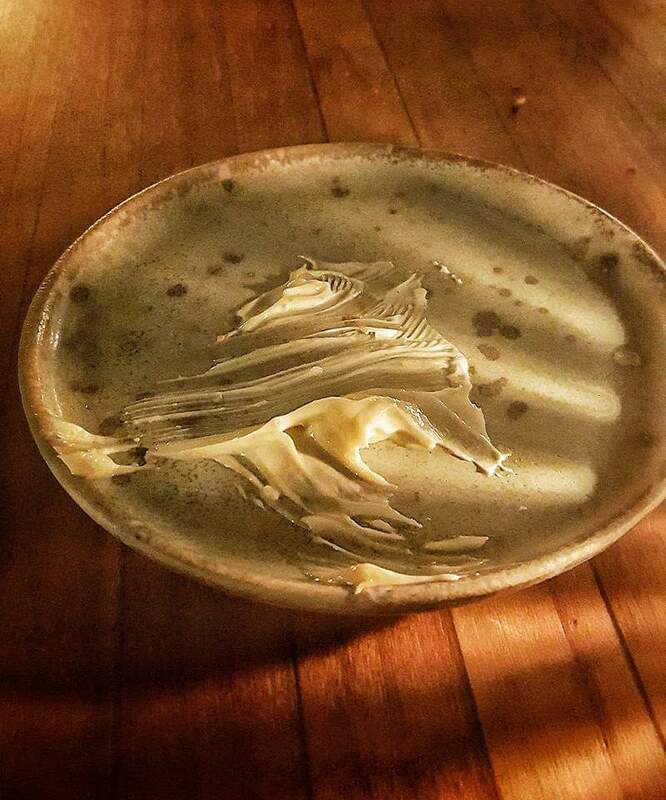 Also, Nomada has special dinners from time to time like the all seafood dinner one Sunday afternoon. 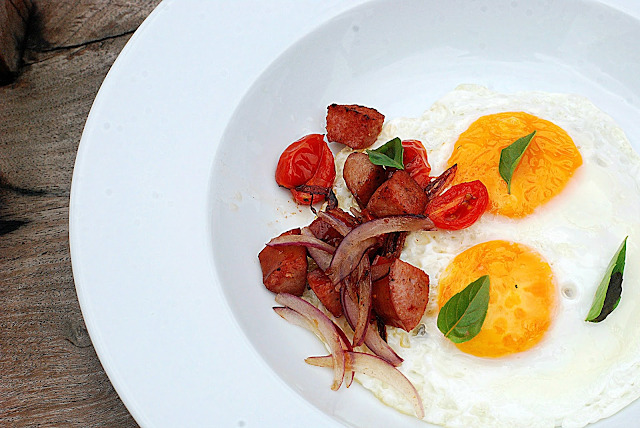 Dreaming in Italian: Carbonara + Eggs for breakfast. 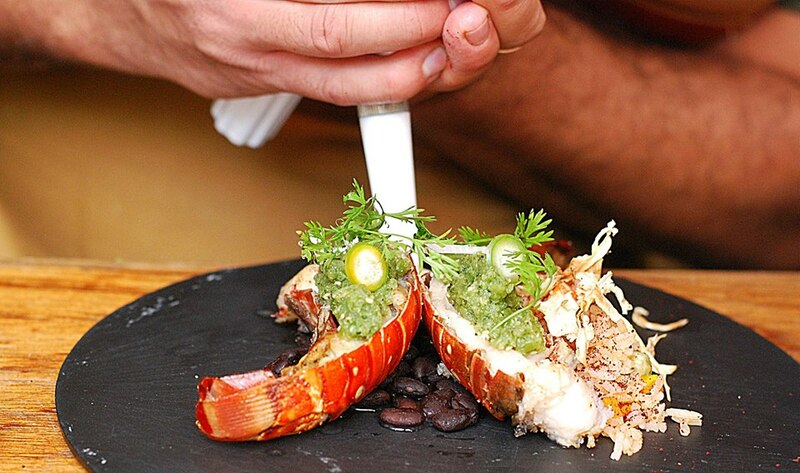 Lobster…and we don’t need to explain why we LOVE lobster, do we? 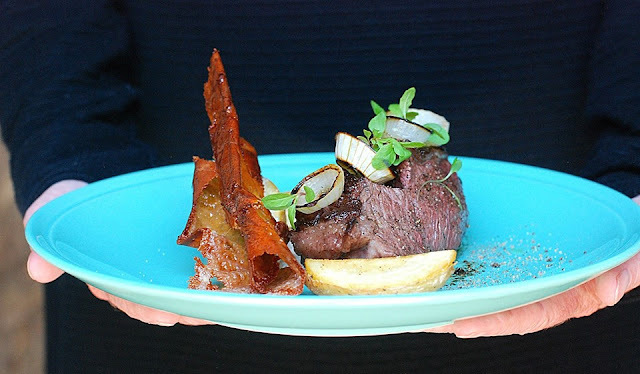 Top this Top Sirloin Steak with Chicharrón, truffle oil, and a blue cheese cream. It’s one of the best indulgences we ate in SMA all year. 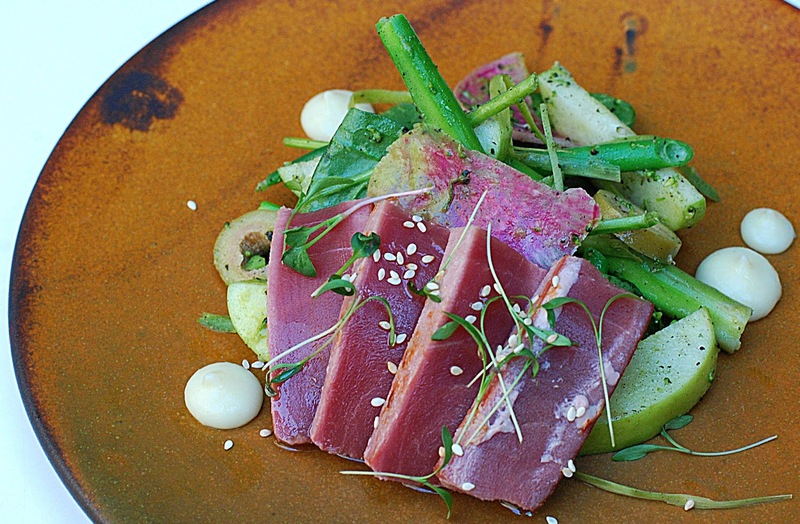 Tuna Salad: because only Chef Cruz can make healthy taste this good. 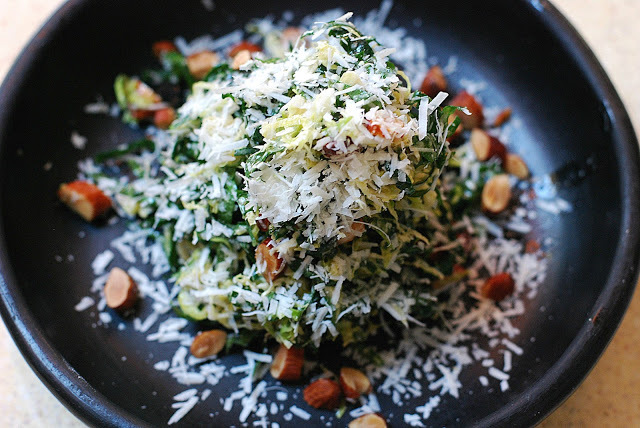 I take all of my detox meals at Nomada. 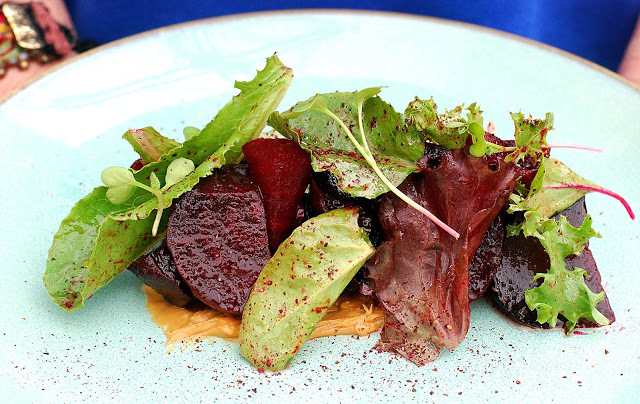 Beets with a smear of peanut butter because only this chef would think of putting these two ingredients together. 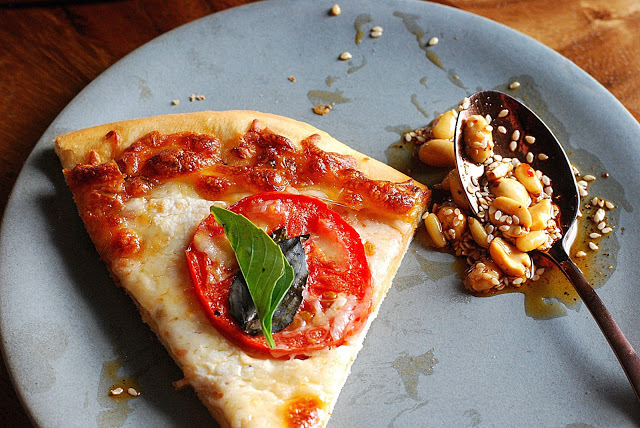 Extra thin crust Margarita pizza with an optional sauce made of olive oil, almonds, sesame seeds, pumpkin seeds, chili de arbol, pine nuts, peanuts and salt. Look at their new menu for some exciting pizza selections. Figs on pizza? We’re in! 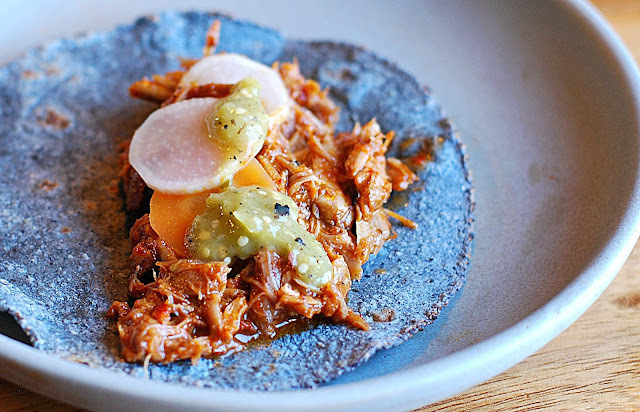 Duck Barbacoa with Hoja Santa Leaf, Star Anise and pickled carrots with one of the most authentic blue corn tortillas we’ve ever tasted. 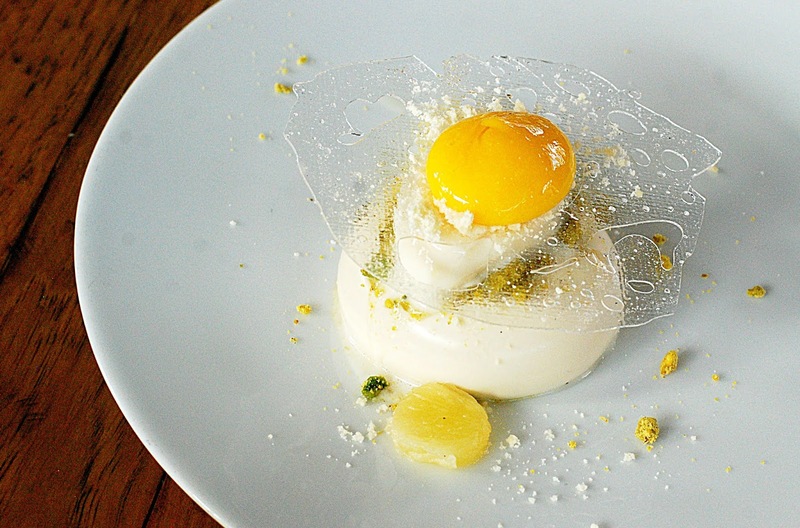 And did we mention we love lemons? 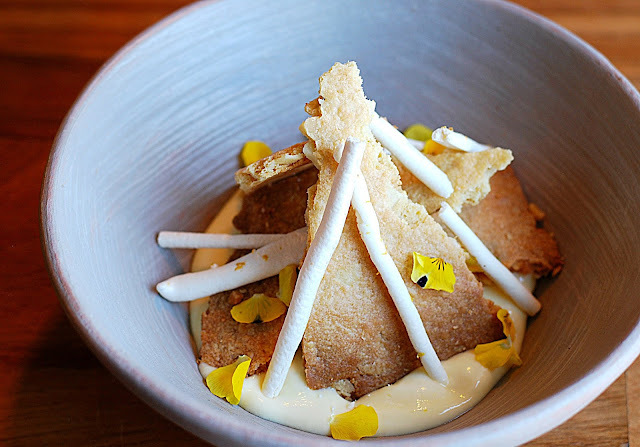 Creamy Lemon foam with an Almond Shortbread Cookie, Meringue and Lemon Grass ice cream. Chef Armando Pratt is the winner of Oktoberfest 2018 with a delicious lamb sandwich with sauerkraut. 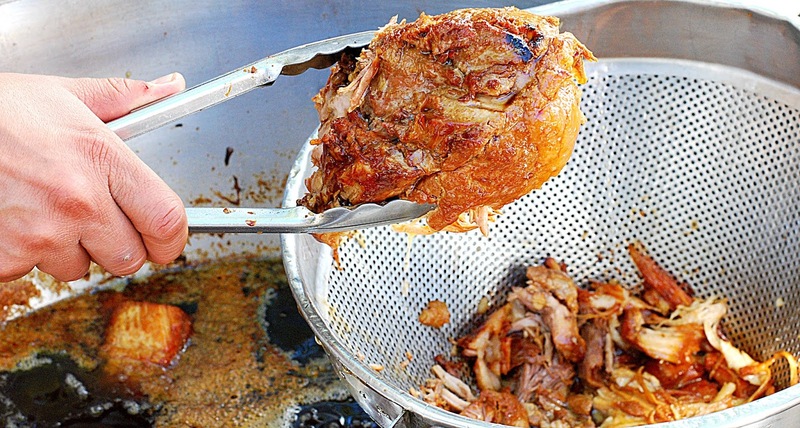 Chef Pratt dreams up some of the most interesting techniques for BBQ. 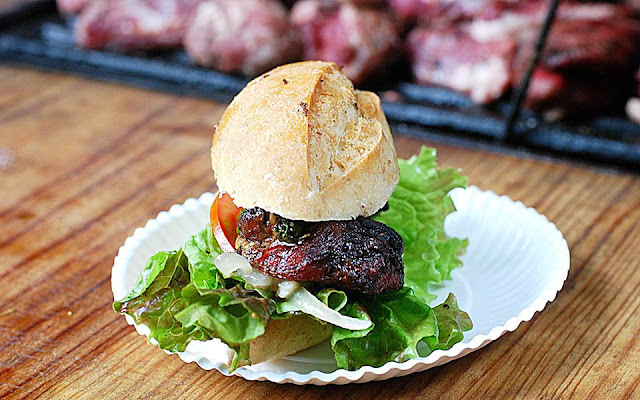 Buenos Aires Bistro’s Pork Cheek Sandwich: because nobody in SMA has mastered the grill like Chef Mariano Alverez. The open fire cuisine of Buenos Aires de Campo is featured at many of the special events around SMA. 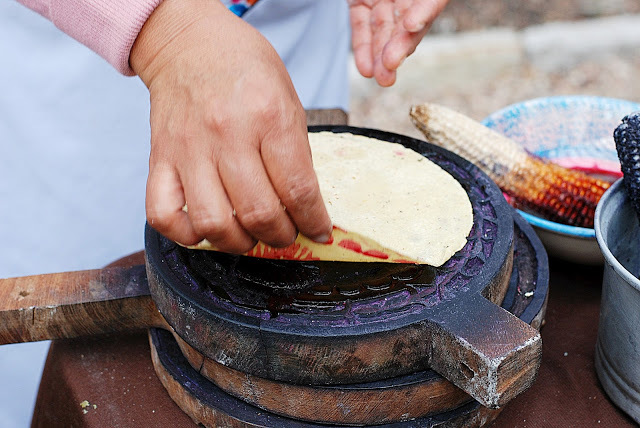 The perfect complement to a textbook meal: a pile of tortillas handmade by the women from the Otomi community at El Llanito, just outside of Dolores Hidalgo. 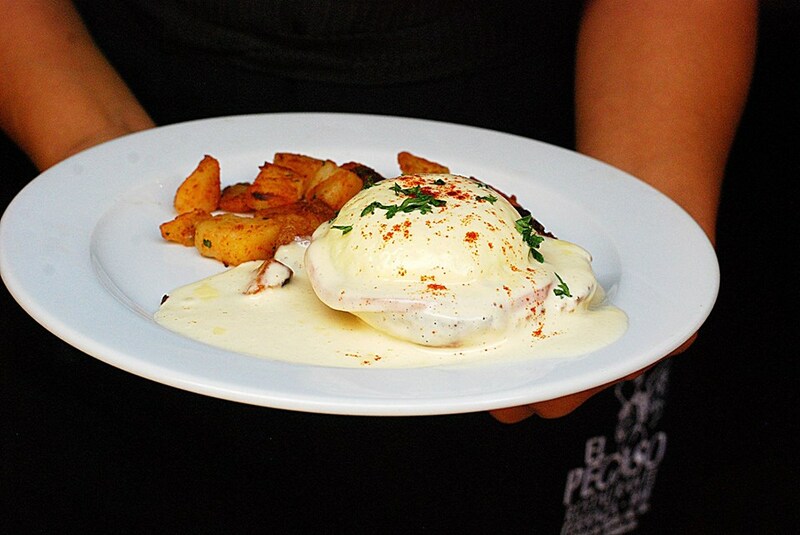 Eggs Benedict on Brioche - because every plate of Eggs Benedict needs to start with brioche; Panio’s brioche. Panio just opened a new restaurant in the Antea Lifestyle Center in Queretaro. I’ve always wanted to go to Spain for an olive harvest but local chef, Patsy Dobois, brought Andalucia a little closer with her own olive harvest in the SMA countryside. 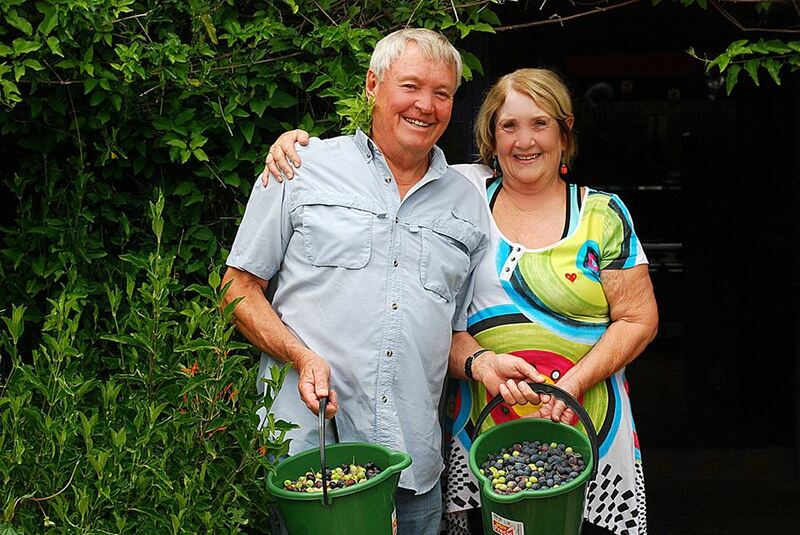 We loved the fresh grown olives almost as much as we love Patsy Dubois… and her cooking. 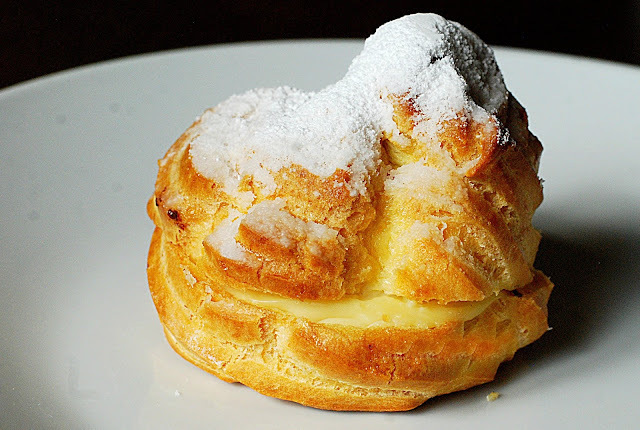 Because if we can’t be called a cream puff, this one can! Good thing we never compared notes with Chef Tony Cherry; she ate one every day. Now I know why. One of the many dishes we tasted during an elaborate, pre-hispanic feast was Pork with Tejocote. Finding the wild fruit that goes in to making it is nearly impossible, like many of the ingredients Jose Yanez uses in his prehispanc dishes, unless you happen to have recently traveled to a rain forest in the mountains or are lucky enough to find one at one of the Mercados now that it’s Christmas season. A peculiar crab-apple-like fruit that most people have never heard of, it’s also an essential ingredient in ponche, a hot fruit punch that’s served during the holidays. 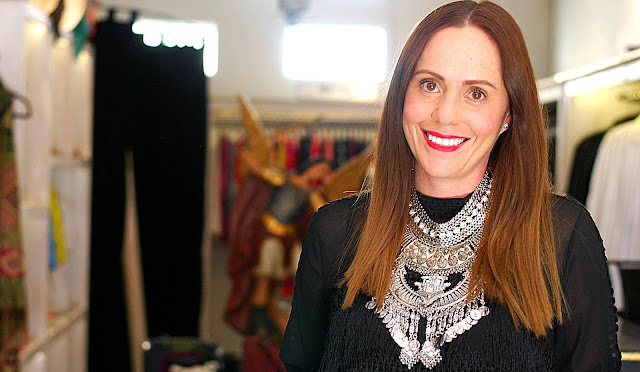 Yes, this fabulous cook is also that famous SMA fashion designer. POLP S.M.A. 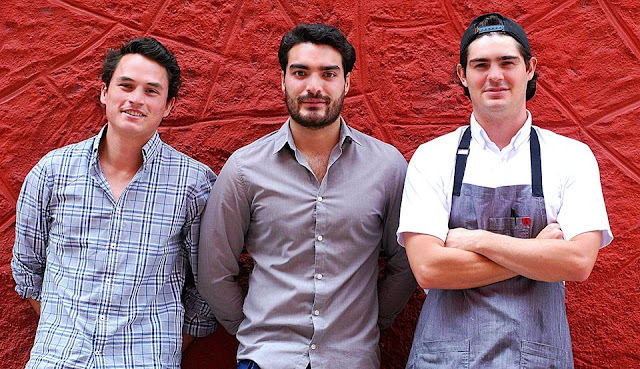 Gastrobar was recently opened by Chef Patricio Fuentes Alverez and two of his childhood friends. 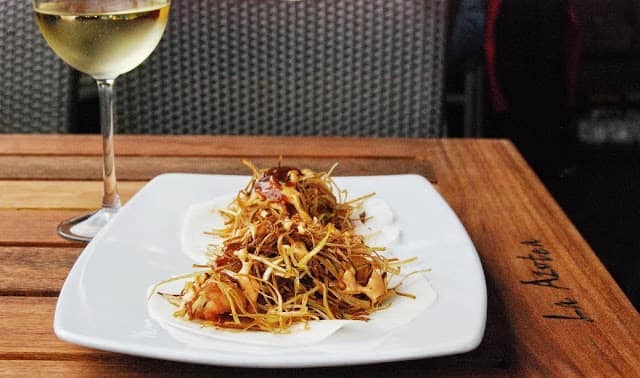 We love all of the small plates like the Pincho de Ribeye with a side of Burrata. 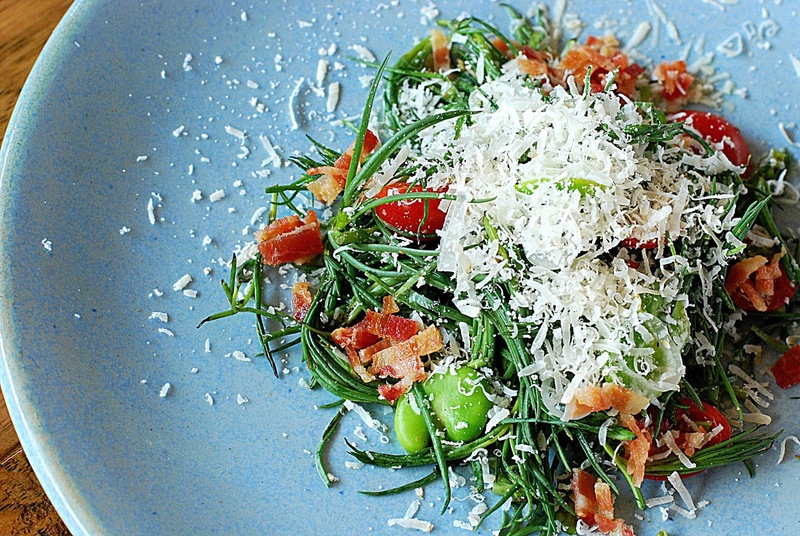 We’ve always said that a restaurant designed around small plates is somewhere we want to go often. Absolutely one of the best ways to eat. You'll also love the prices. 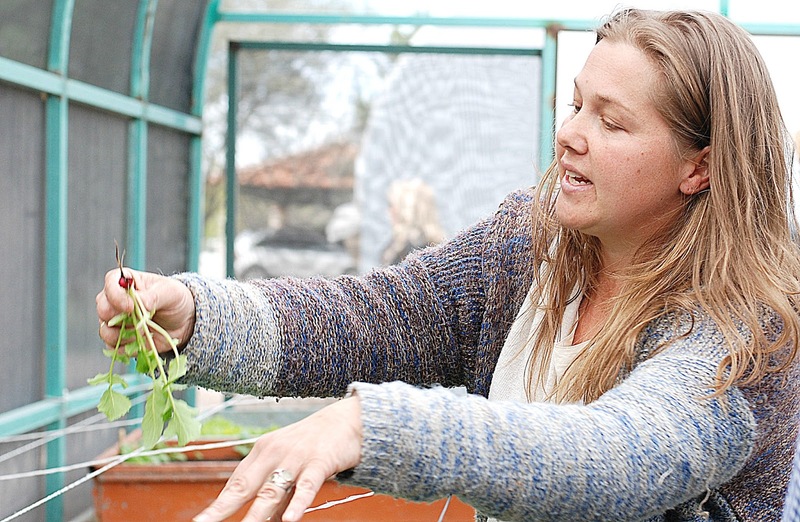 When Chef Esmeralda Brinn Bolanos brews a new batch of sauerkraut, we’re there. 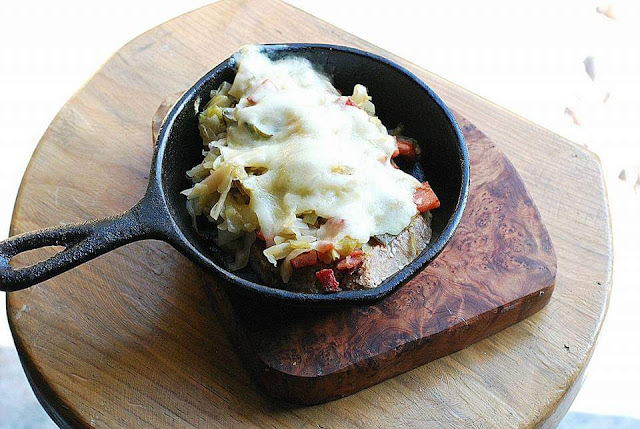 Her sauerkraut sandwich, smothered in bacon and cheese, is one of our favorites. 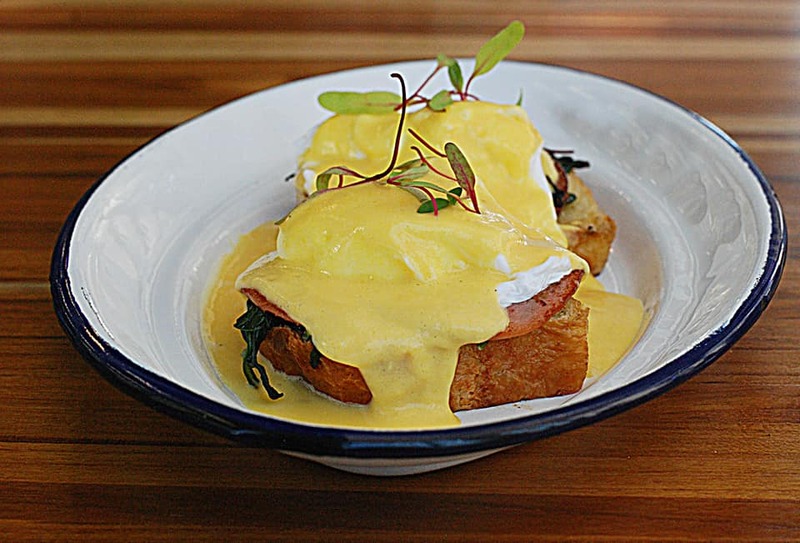 Eggs Benedict with Pesto and Hoja Santa; a first - choice selection for anyone who enjoys a unique eating experience. 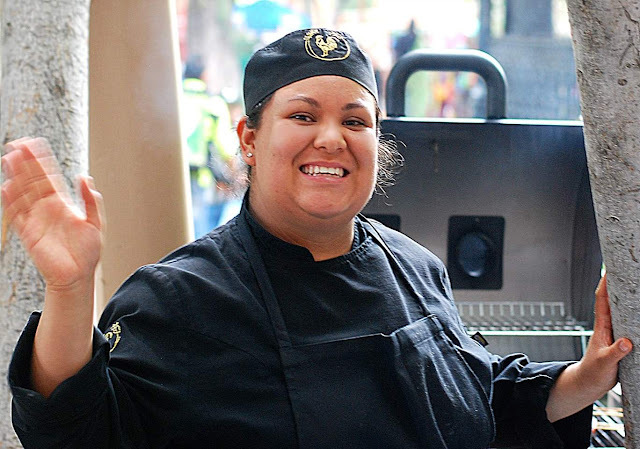 Chef Esmeralda Brinn Bolanos also puts on special events at Cocina Libre, an artistic cooking project she created, combining open fire cooking and live performances. 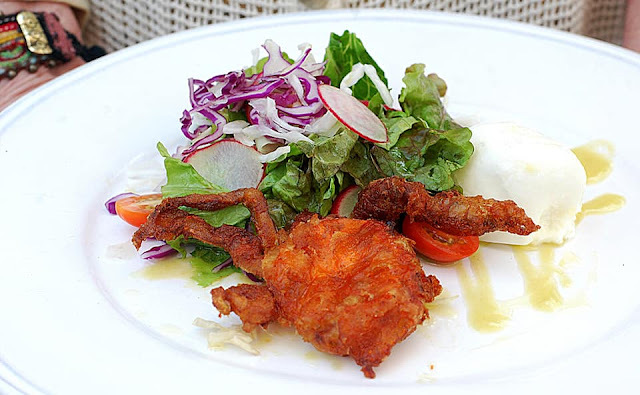 Soft Shell Crab Salad with local burrata, a musculin mix, tempura soft shell crab and roasted tomtillo vinaigrette. We also loved the Duck Confit Salpicon: a 12 hour duck confit with Thai chilli sauce and pickled veggies. 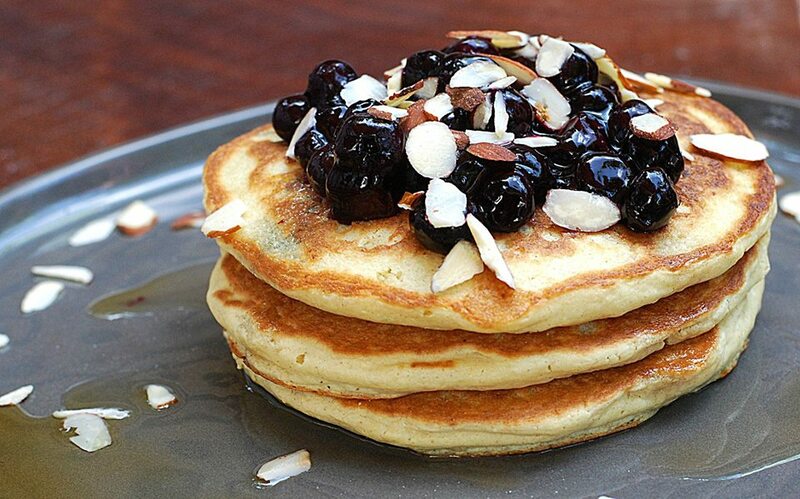 Lemon Ricotta Pancakes: because nothing reminds us of Sweet Home Chicago more than this dish. 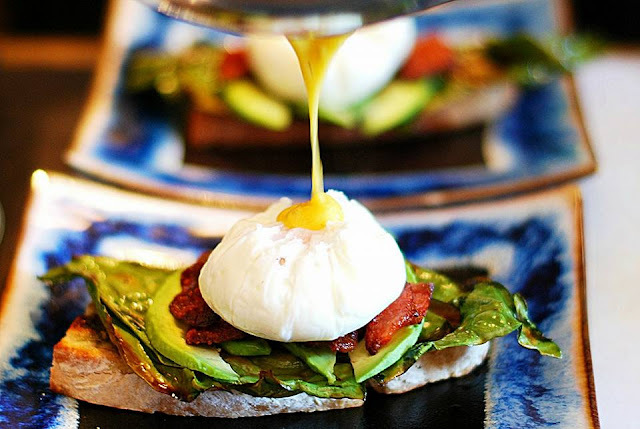 We also like it when you can order breakfast any time of the day; at Rustica you can. 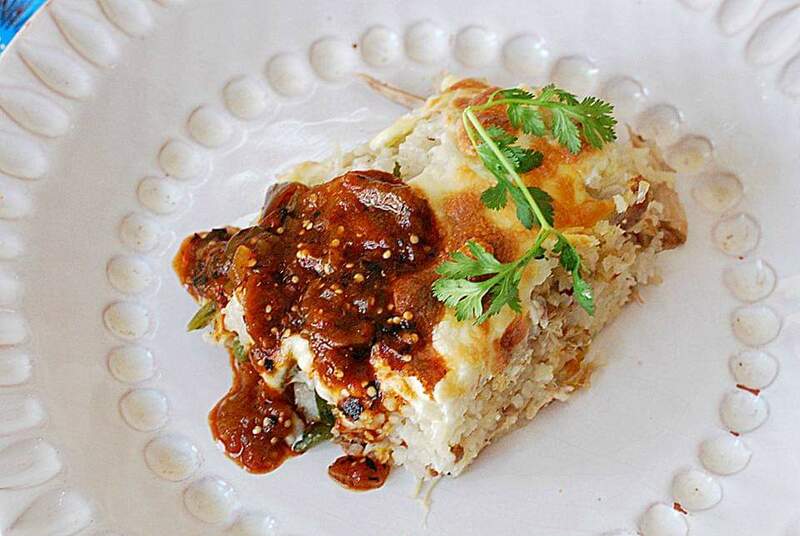 We like out-of-the-ordinary dishes; this was one of them: Chicken and Rice bake by Chef Ruben Yanez Hernandez. Arif Towns Alonso supplies most of the best restaurants in town with a wide assortment of seasonal mushroom offerings. 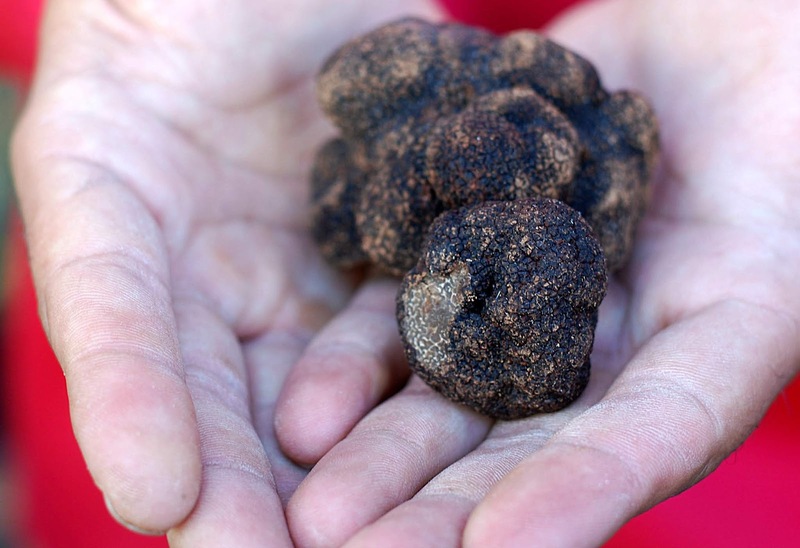 And this year…black winter truffles from Europe. We were lucky enough to be invited along for the first pick up; a special order for Aperi. 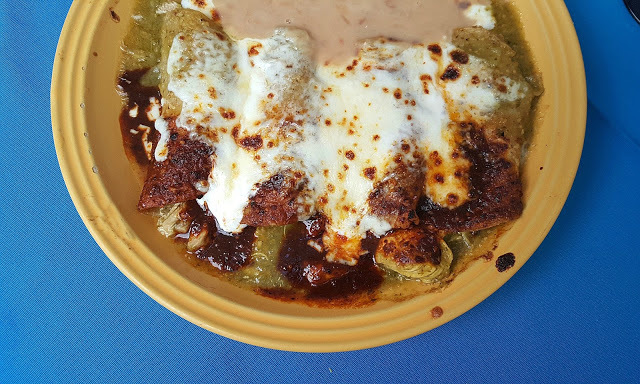 Enchiladas Gloria – chicken and pork topped with red and green sauce. 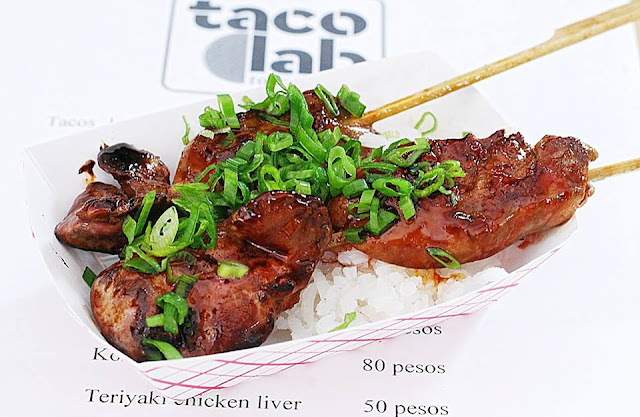 This is one of the best dishes in SMA that’s made by the happiest chef in town. 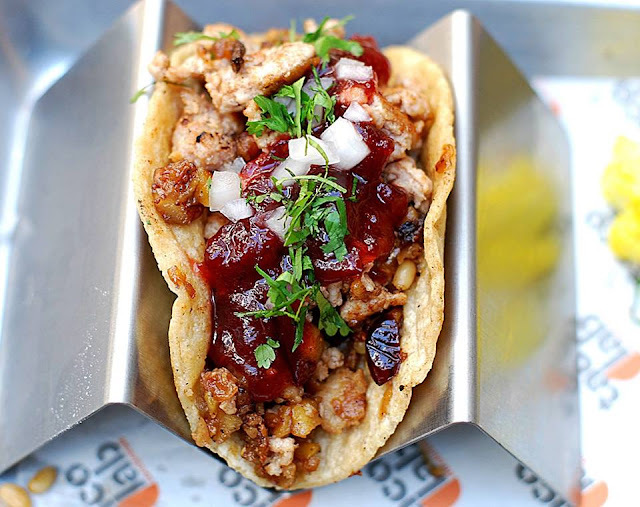 A Thanksgiving Taco: because no other chef in town creates weekly specials this good; a combination of Turkey, stuffing and Cranberries. We wish a turkey taco would stay on the menu all year. 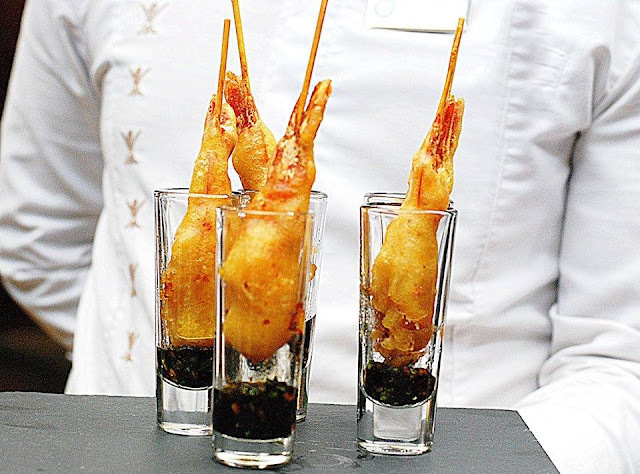 In addition to a full menu of creative cocktails, wines and beers, we love the Asian appetizers including the STIX: skewers made with Miso Salmon, Chicken, Teriyaki Beef, Veggie or Korean Pork Belly served with jasmine rice and Asian slaw. The STIX premiered at the MAF festival this past summer. 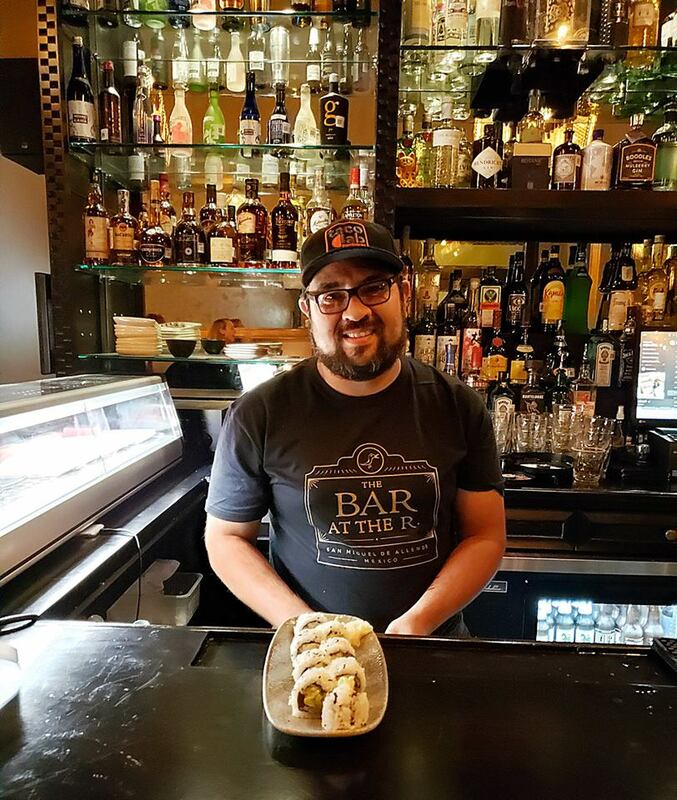 The Bar at The Restaurant was the bar opening of 2018. The Restaurant is an institution that has stood the test of time in an ever growing restaurant scene in SMA. 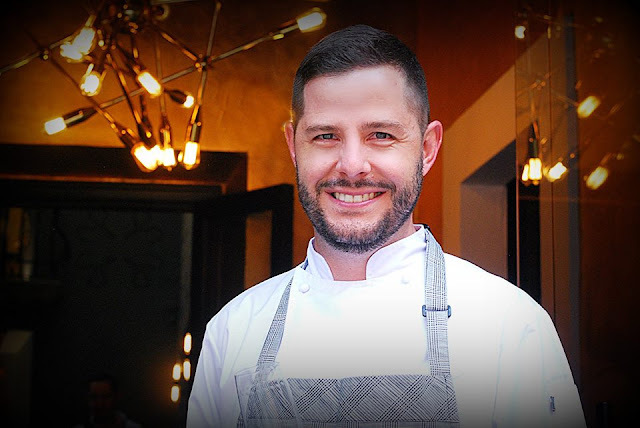 Congrats to chef-legend, Donnie Masterton, for TEN fabulous years of The Restaurant and for understanding that the experience of dining involves more than just the dinner. The food at The Restaurant, remains among our favorites after five years: the Appetizers, the Shaved Broccoli and Kale Salad, Burger Night and of course, the Burnt Caramel Sundae. 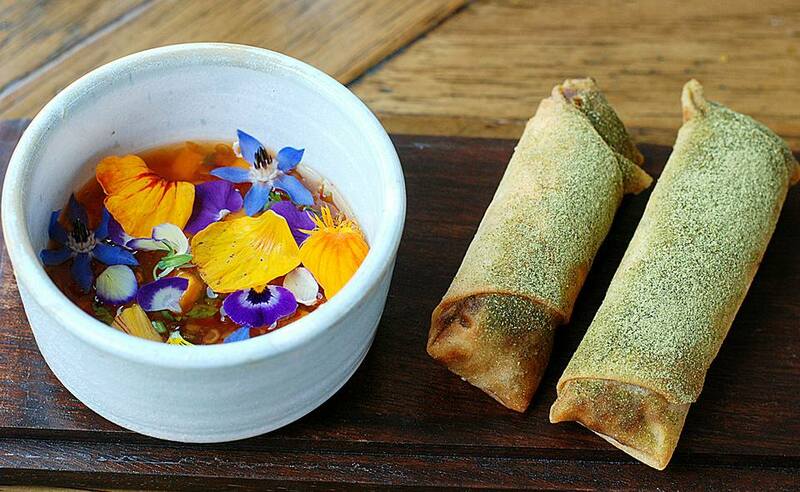 Thai Rolls with flowers. The presentations at Trazo 1810 are always exceptional. 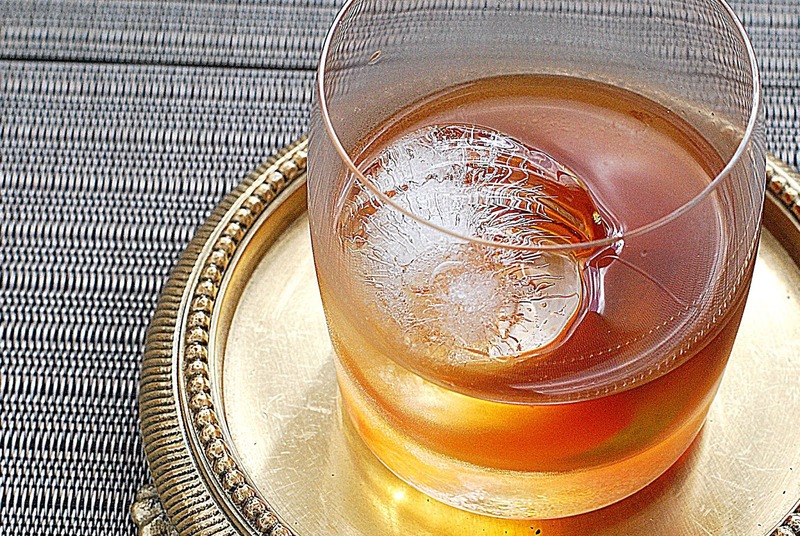 Infused Whiskey Old Fashioned: because it’s the most stylish drink in SMA. 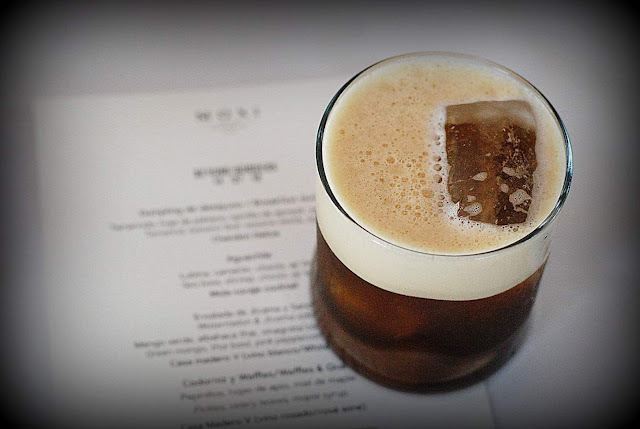 Just look at the ice cube. Romeritos Salad with steamed Flava Beans, Pine Nuts, Black Pepper Aged Goat Cheese and Bacon emulsion: because this dish would bring me back to Trazo 1810 every week. We loved the flavors. 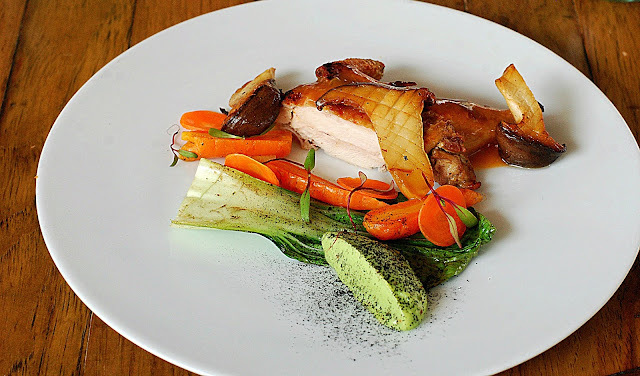 Roasted Rock Cornish with Cauliflower and Fennel Puree, Eringuis Mushrooms and Citric Sauces. The poultry was soaked overnight in a secret ingredient to keep it moist. One of the most impressive poultry dishes we’ve eaten in SMA all year. The perfect dish to bring in the holidays: Pork Belly in plum sauce. 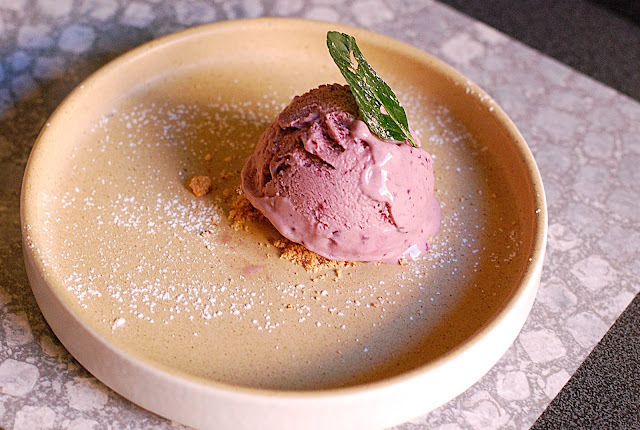 Dressets: because none of Trazo 1810 desserts ever disappoint. 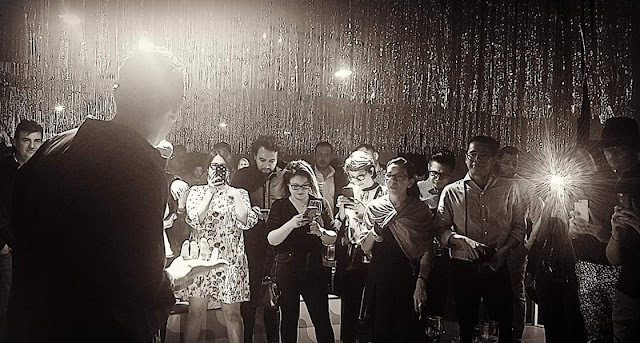 At an evening with Rose Ruiz and Alberto Cinta Laborde to honor Italian Ambassador Luigi Maccotta for the Week of Italian Cuisine in the World, organized by the Italian Embassy in Mexico in partnership with Crea Italia Connections . The surprise of the night was the wine from Tres Raices, the best local wine we've had in SMA this year. We loved the Sauvignon Blanc (and I'm a Chardonnay drinker) and the Merlot, which won a gold medal at the 2018 Brussels World Contest 2018. The winery just opened this year. It's definitely worth a trip to the vineyard to sample their remarkable brands. 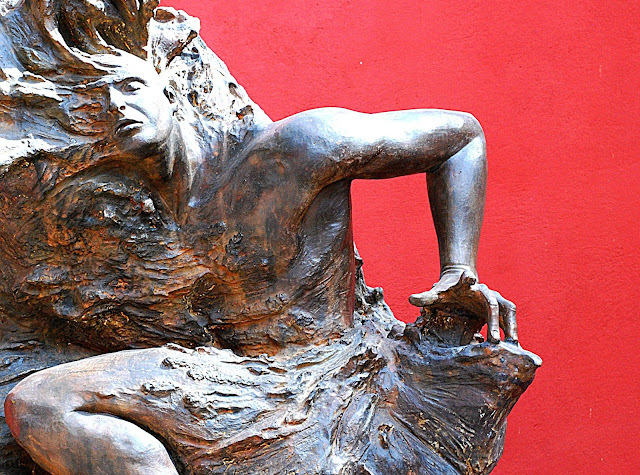 You can also try the wine in Centro; they just opened a tasting room at Cuna de Allende #15. Best thing we did in 2018: A birthday parade through the streets of SMA. Thank’s to everyone who participated and to friend, Billy Mervin of the Nena Hotel, for all the help. 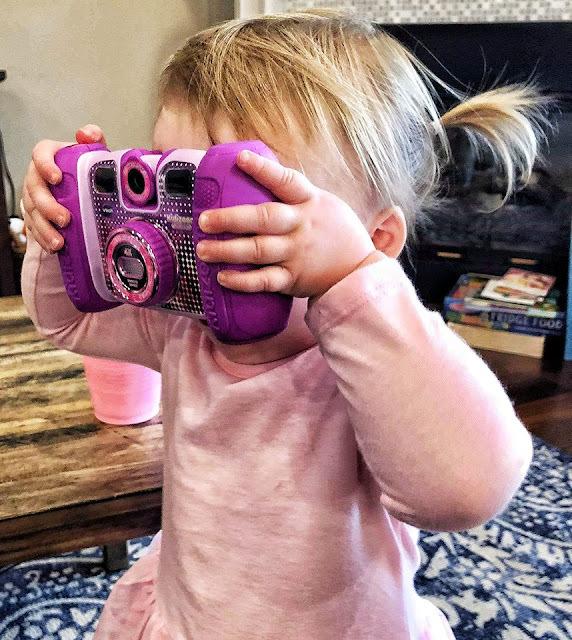 A girl after my own heart...she loves to eat and now she loves taking pictures of food. Here, Olivia with her 1st camera on her 2nd birthday. Photo by the Yorks. 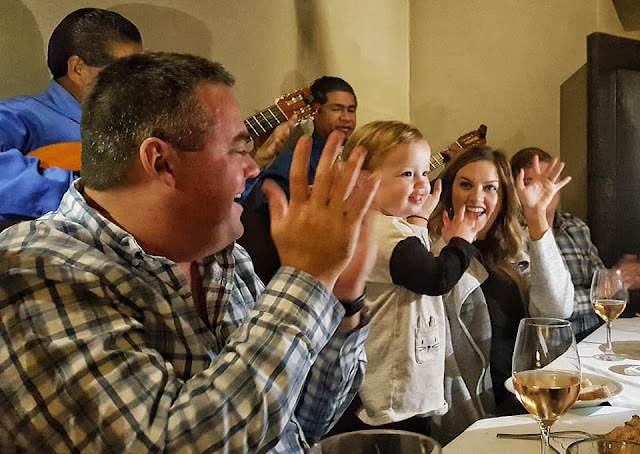 A warm up for the parade and my favorite picture: Jessica, Olivia and Tommy getting into the SMA spirit with the mariachis taken in the private dining room at MiVida. An abuela and her granddaughter showing the love: This picture reminds me that the cultural stigma around aging and death doesn't exist in Mexico. 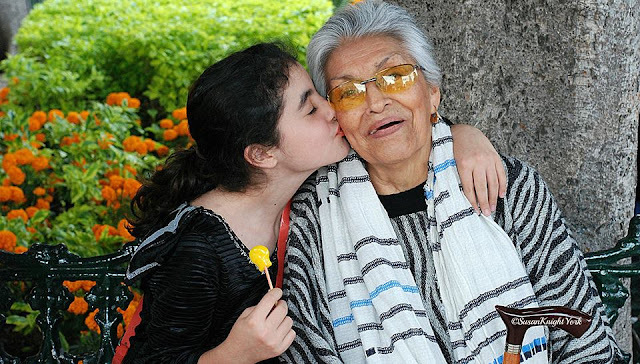 Old age is respected and celebrated; one of the many things I love about Mexico. I had just had an hour to snap the face painting on Day of the dead. All of the faces were filled with so much life. 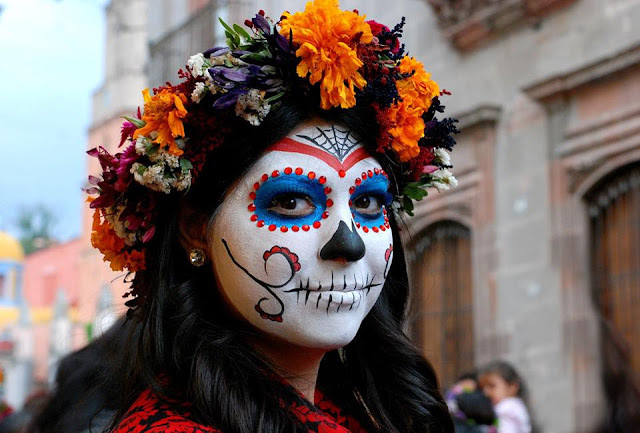 Don’t miss a Day of the Dead celebration in SMA; it’s magical. 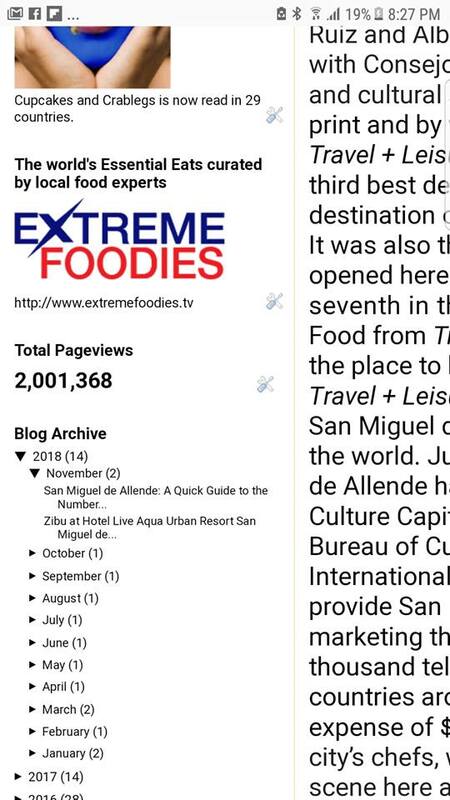 Two million hits on www.cupcakesandcrablegs.com; one million alone in 2018. 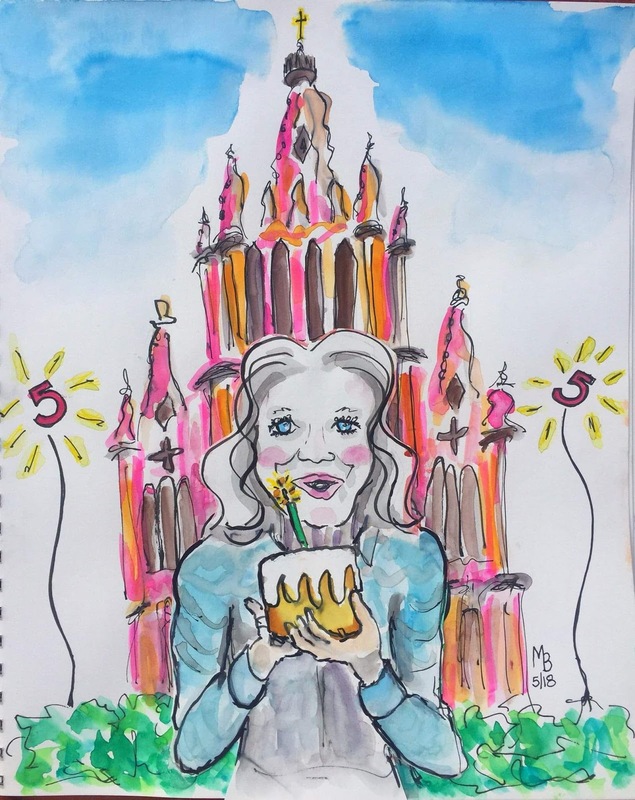 Thank you San Miguel de Allende… two million times over. 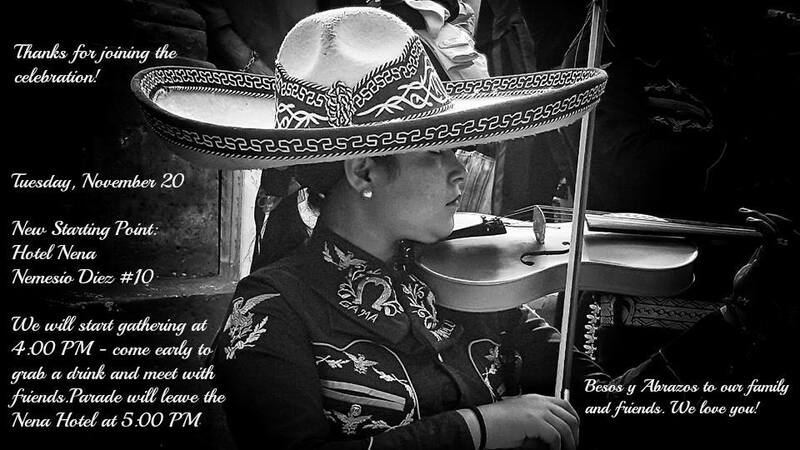 Miracles happen daily in SMA; this was ours recently: I took this picture of female mariachi, Delia Edith Flores Tellez, when I came to SMA in 2013. I never knew who she was until today. Five years later, in 2018, I used the picture for the invitation to our birthday parade. 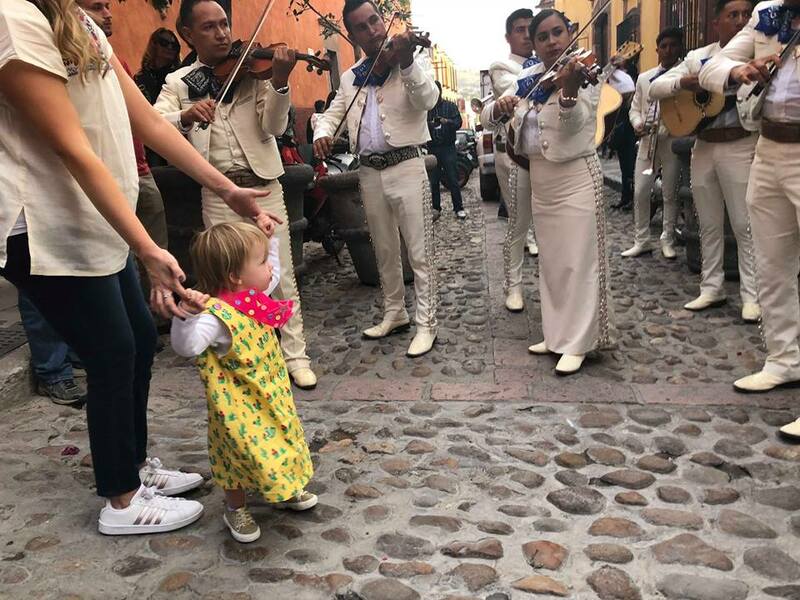 Delia then showed up as one of the Mariachi’s for the birthday parade. Here, Olivia looks on as she plays. 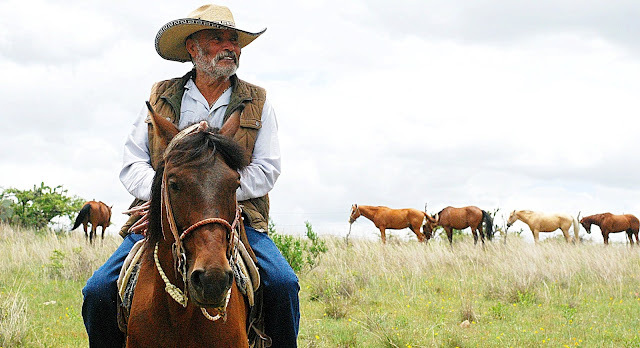 A cowboy, who never likes to have his picture taken, plays up to my camera at the beautiful Canada de La Virgen ranch. Five years in SMA: a drawing by amazing sketch artist, Meagan Burns. Is there anyone who eats out more than we do in SMA? 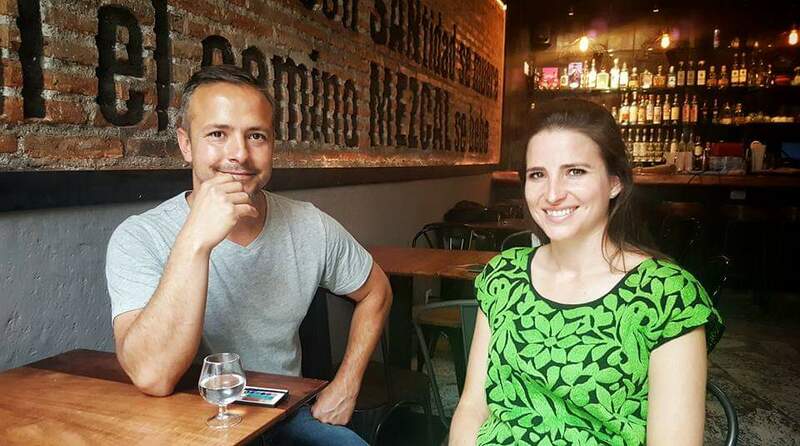 A close tie would be these two: Rose Ruiz and Alberto Cinta Laborde, our 2018 pick for the food lovers of the year. Honored to be named to the 101 Faces of SMA. Thank you and abrazos to Daniela Doig, the author of this book. 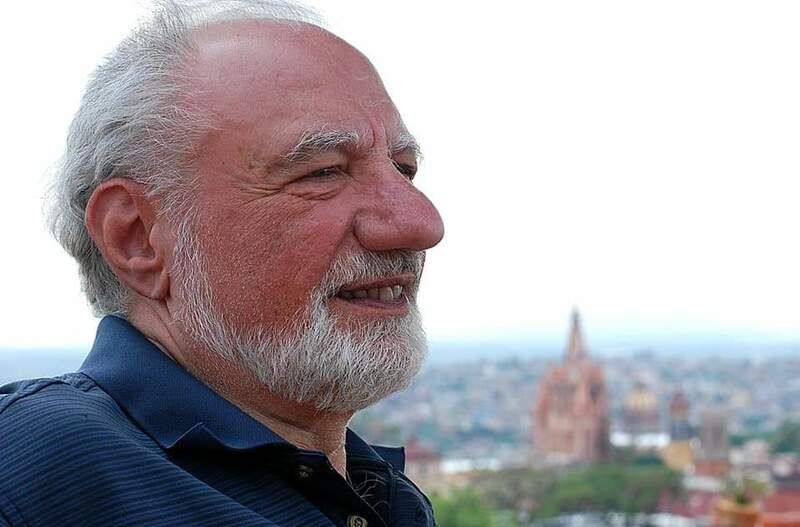 Photo by Erik Zavala Kugler. The posada at the home of the Mojigangas; thanks and blessings to Maritza Celeya and family for one of the most memorable Mexican experiences we’ve had in 50 years. 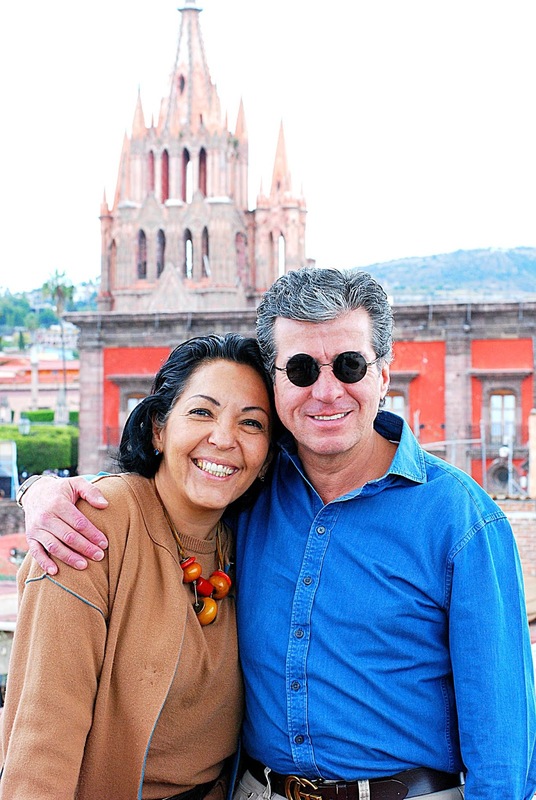 A guide to the #1 city in the world, San Miguel de Allende, is now on my website. Click on the picture of SMA in the left hand column of the website www.cupcakesandcrablegs.com. 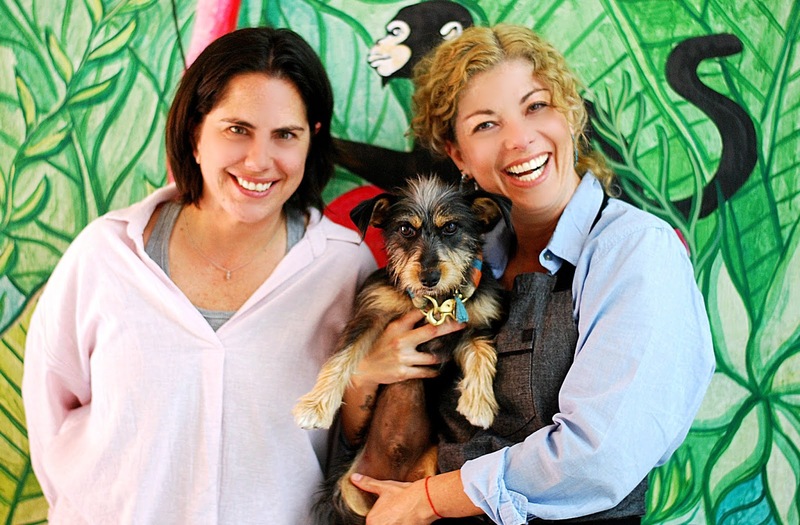 Irma Dena Villanueva, Oktoberfest SMA and Owner of Boutique San Miguel Arcangel; Karla Becerra Martinez, Chef, Lavanda Café. Thanks to everyone. Over 279 more people have signed up. Shooting will commence again in January, 2019. 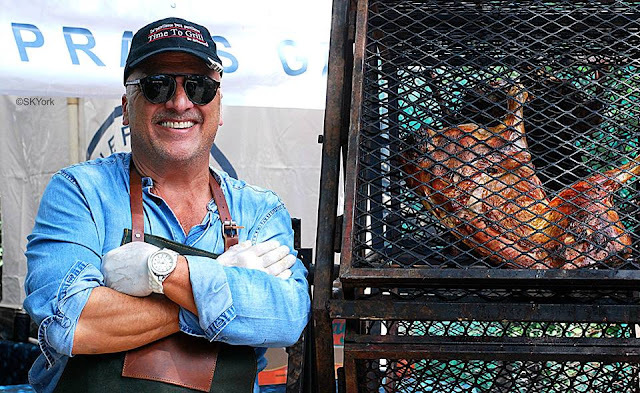 Contact susan@cupcakesandcrablegs.com for information. 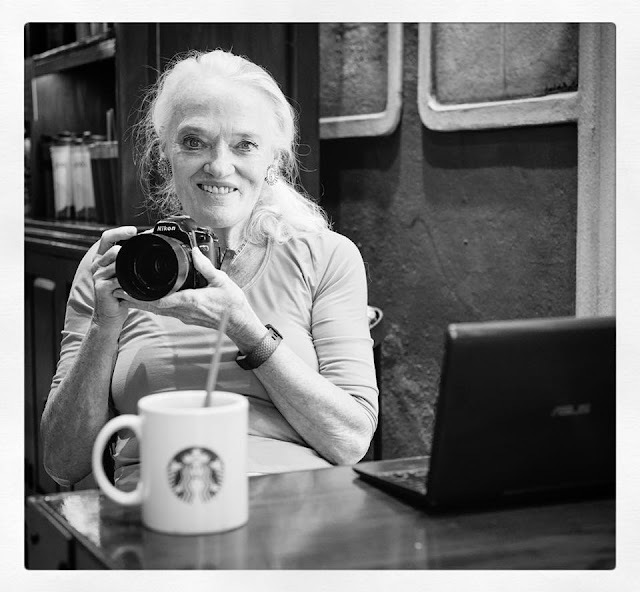 All photographs ©Susan Knight York unless otherwise noted.